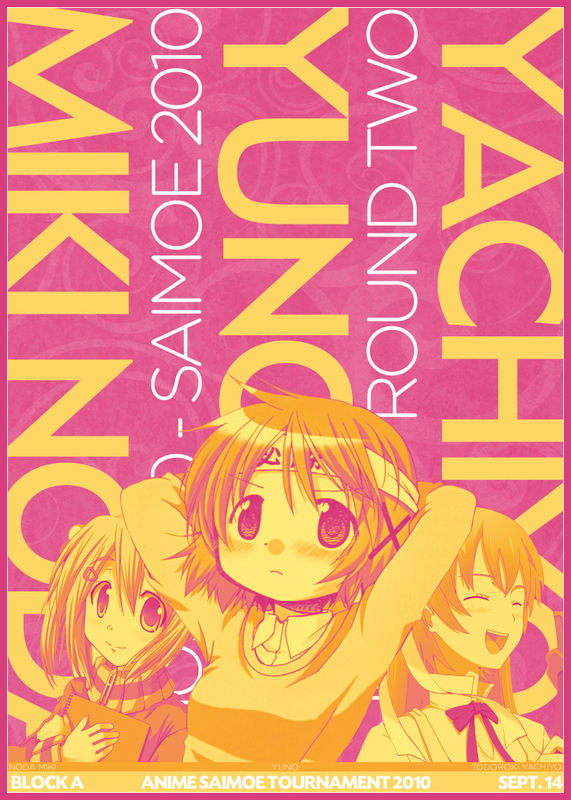 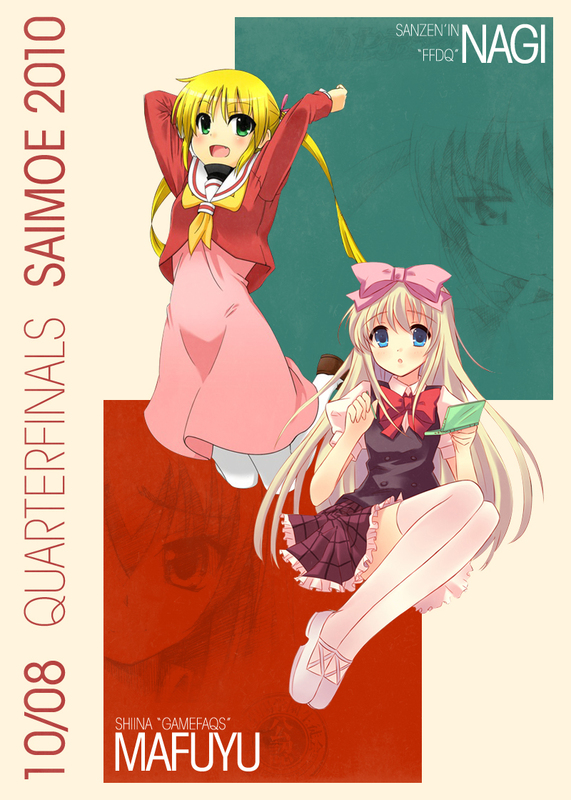 Saimoe 2010 | Hau~ Omochikaeri~! 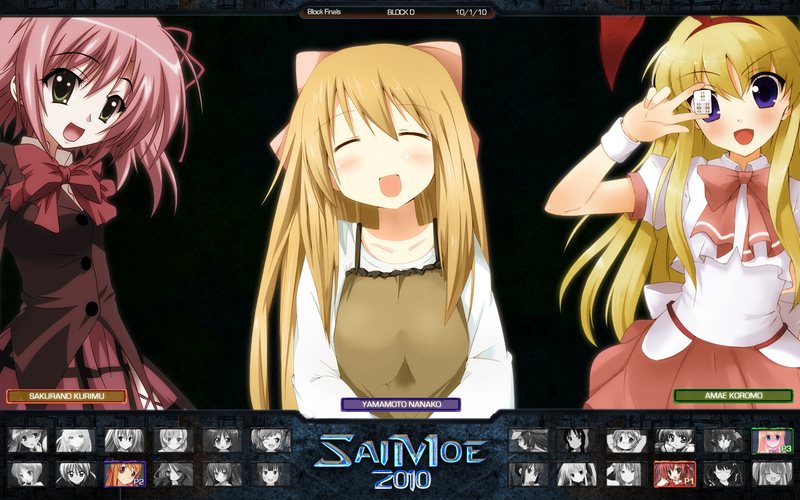 Welcome to Saimoe 2010. 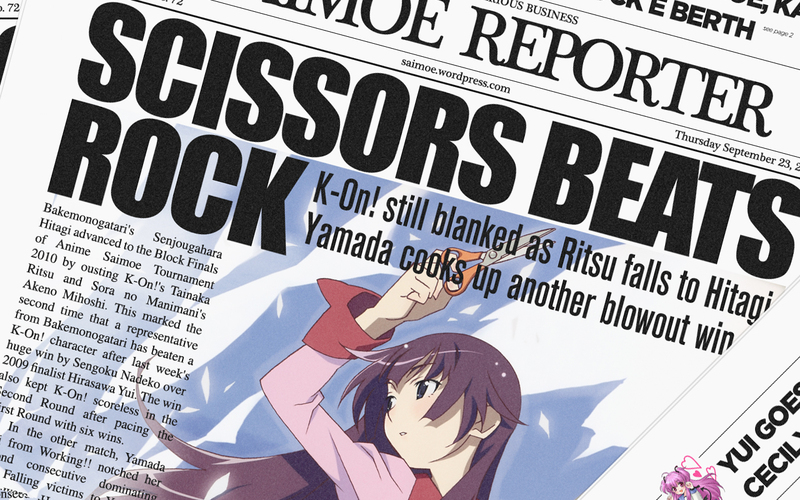 It makes no sense. 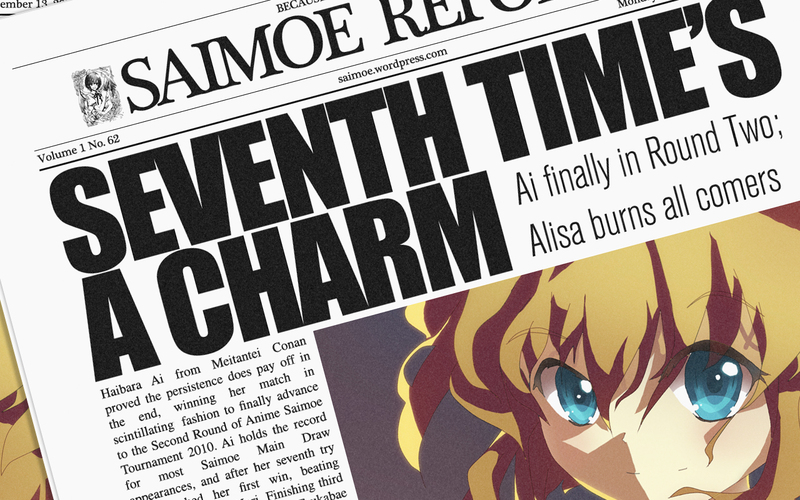 And that’s why we like it. 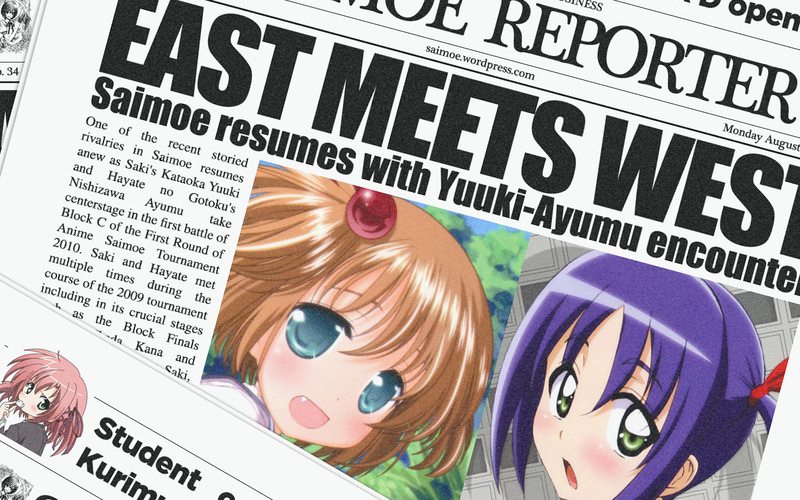 A wise man once said: “Your moe is not my moe”. 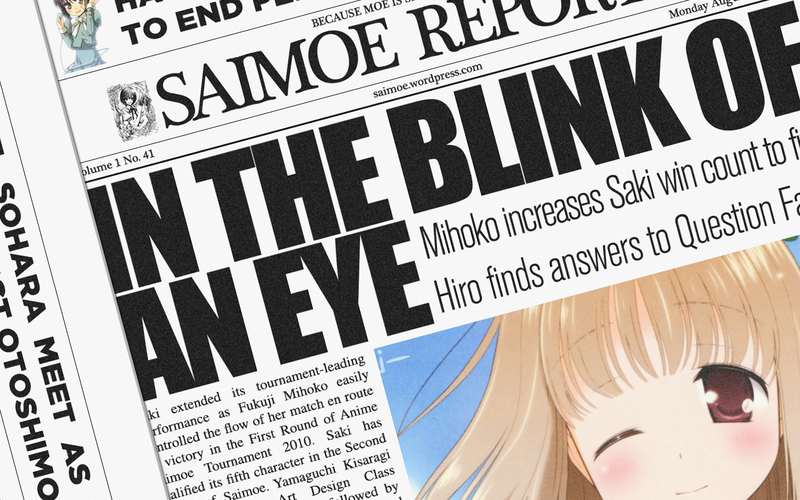 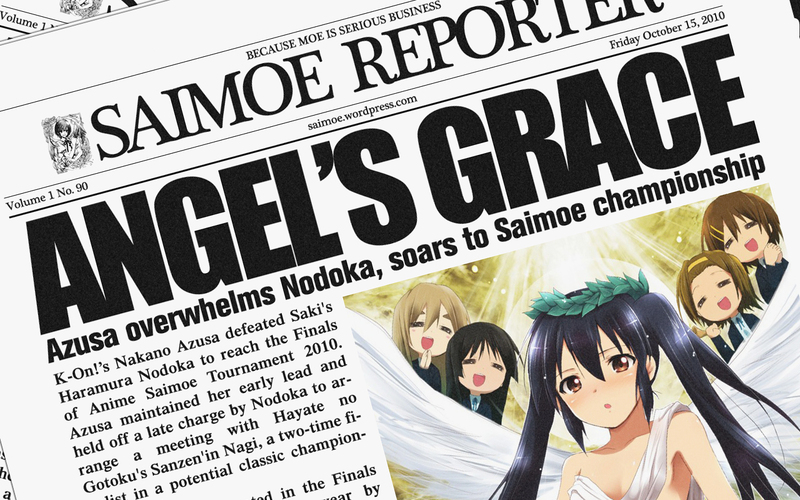 This is what makes Saimoe so beautiful. 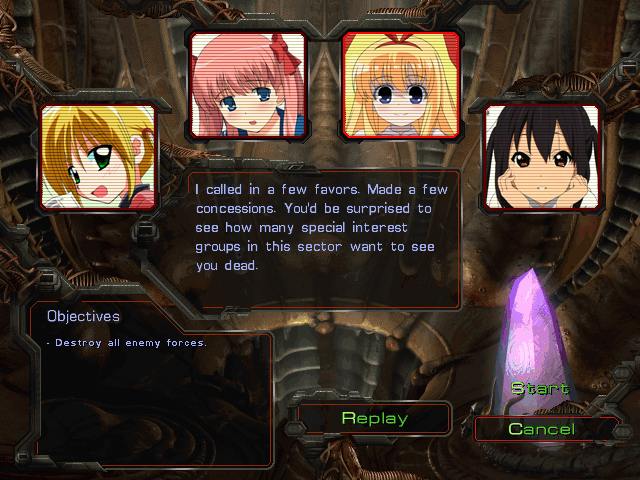 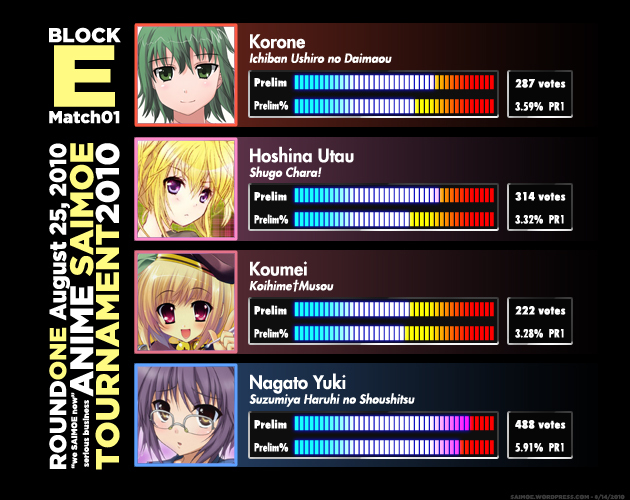 I believe that everyone should vote for who they feel is the most moe within each match. 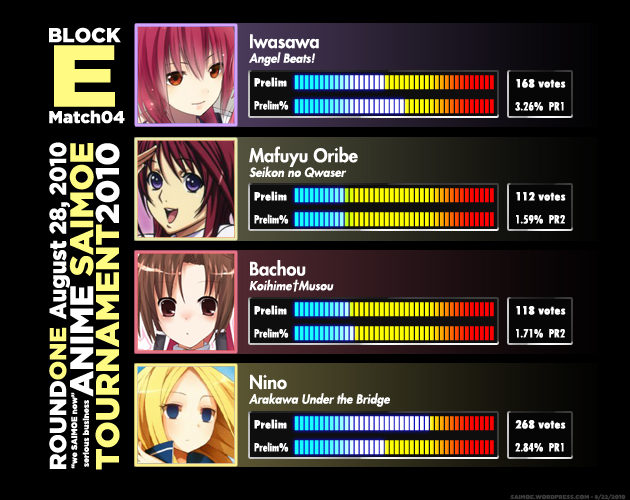 No hate or revenge votes. 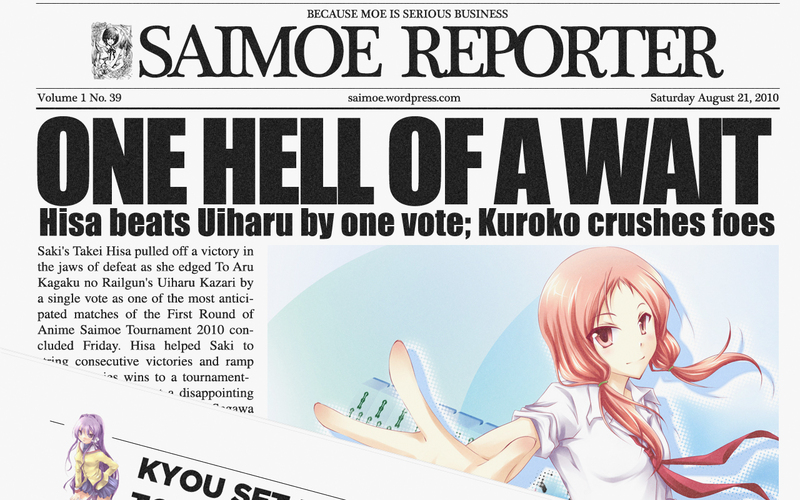 No swaying by interim votes. 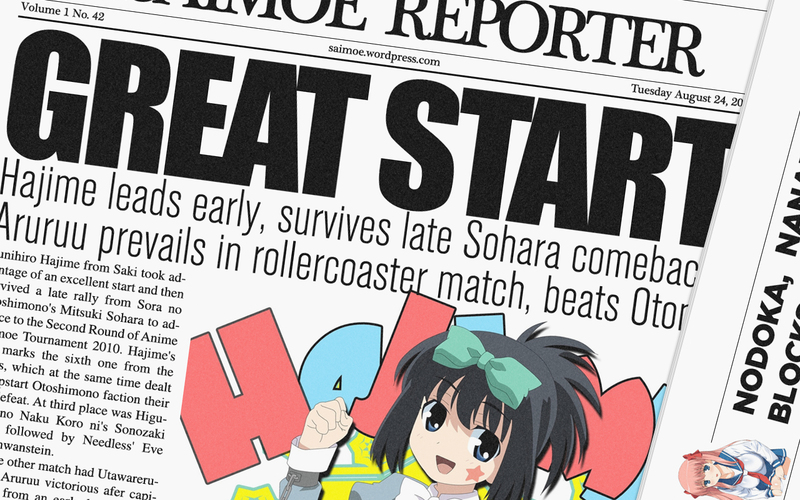 More important than crowning a winner is being introduced to new series and new characters that you have not known before, and gathering moe images of those characters that you love. 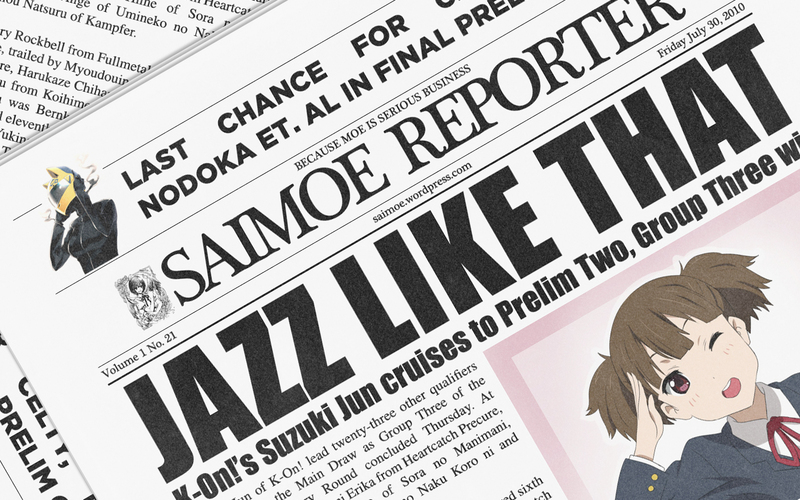 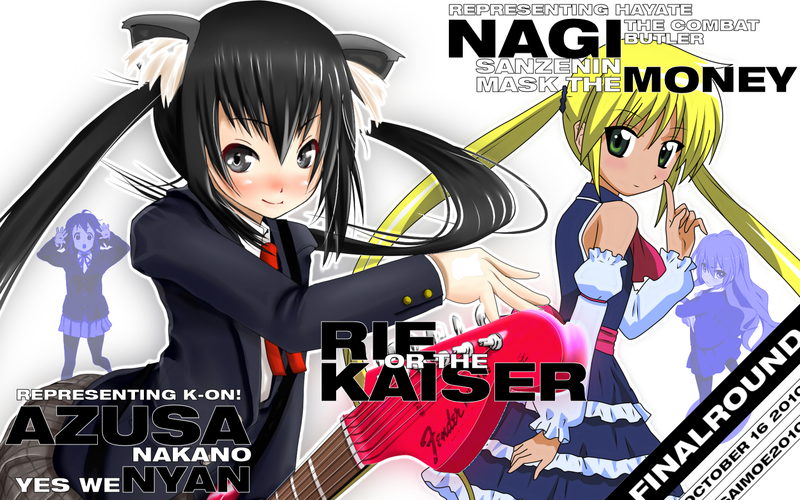 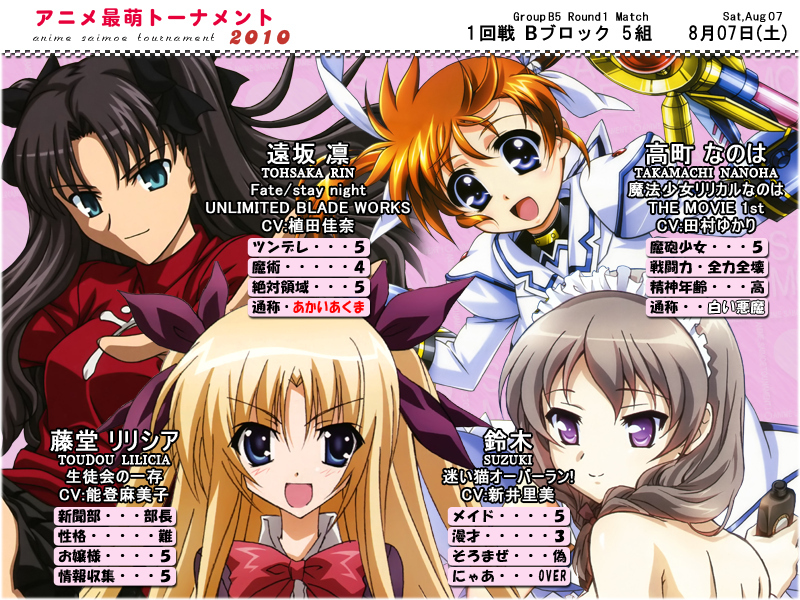 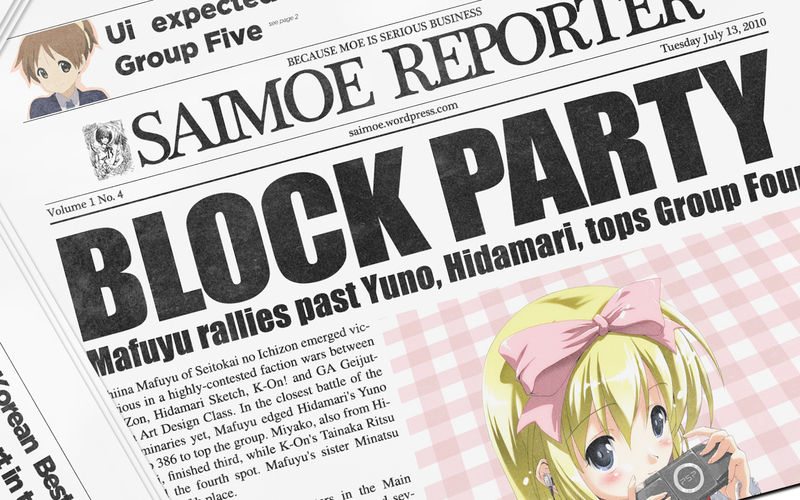 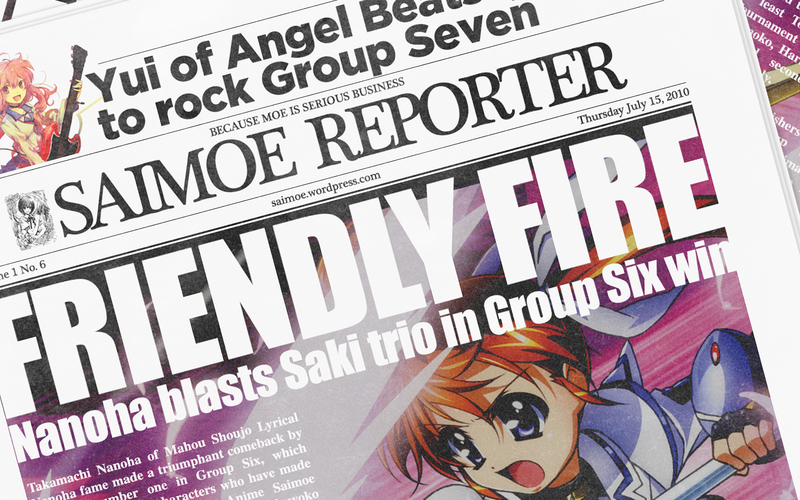 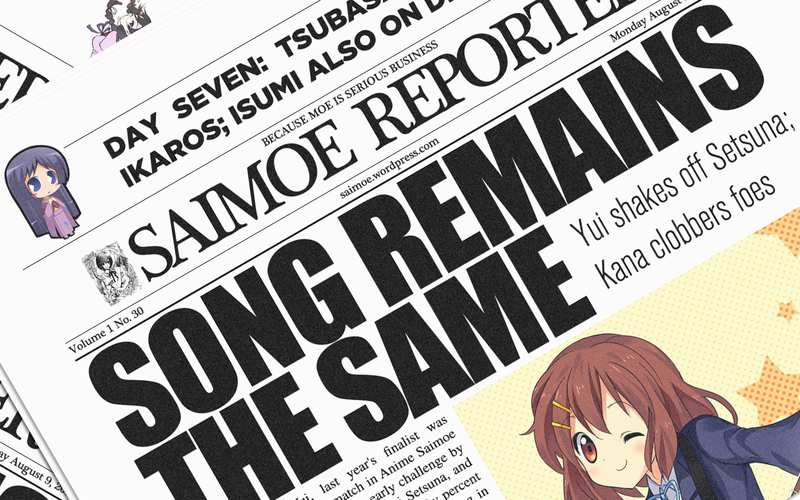 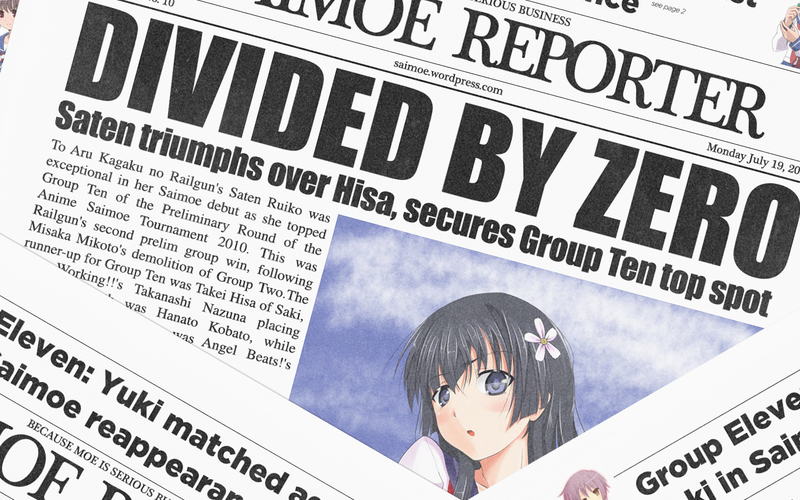 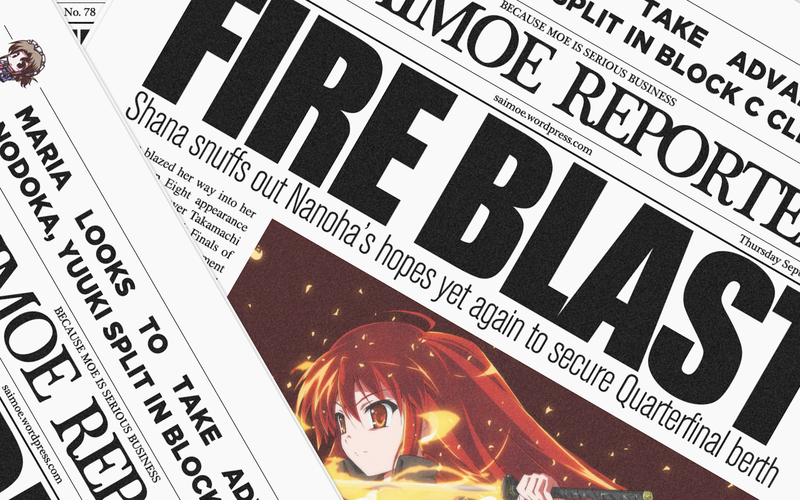 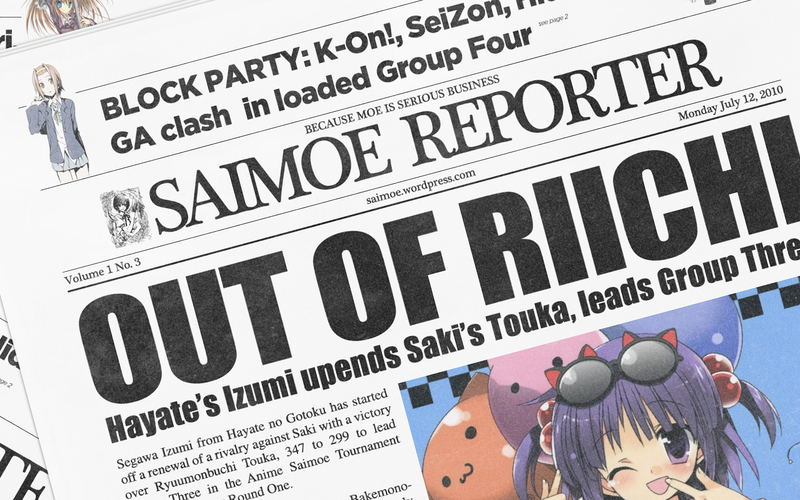 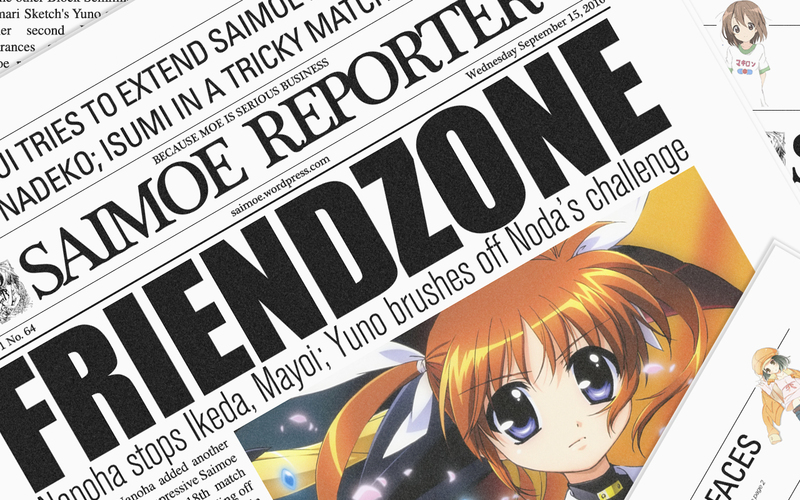 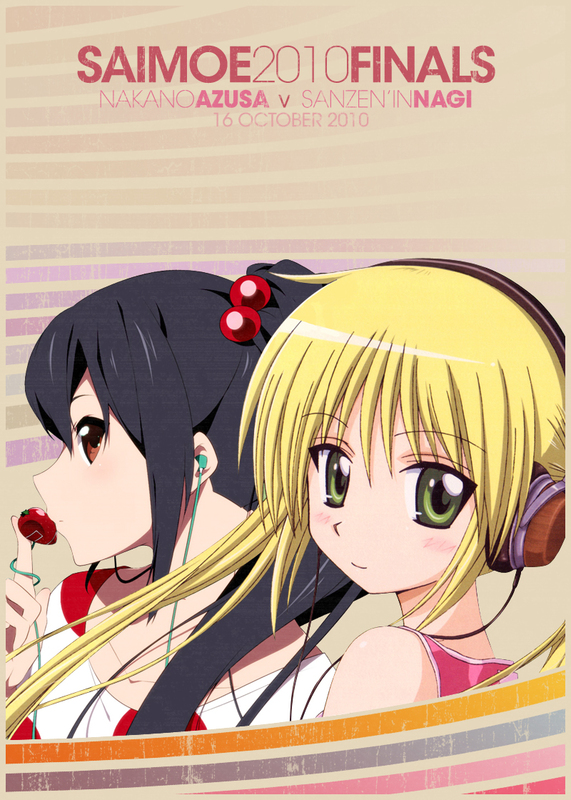 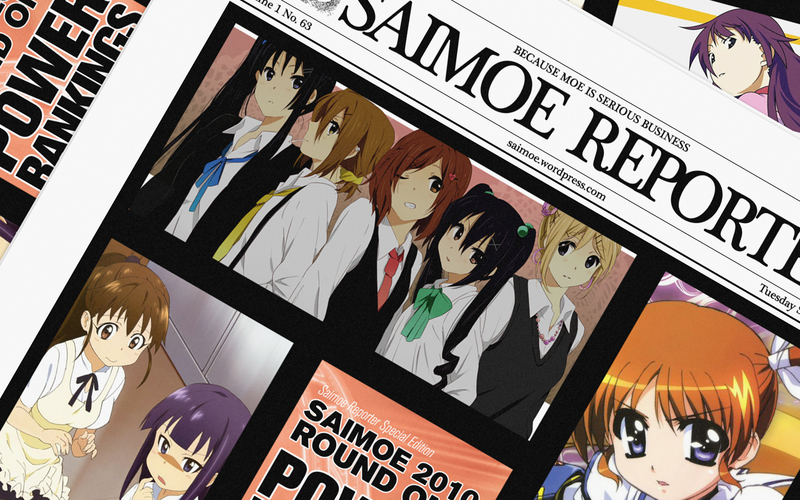 The Saimoe 2009 archives can be found here. 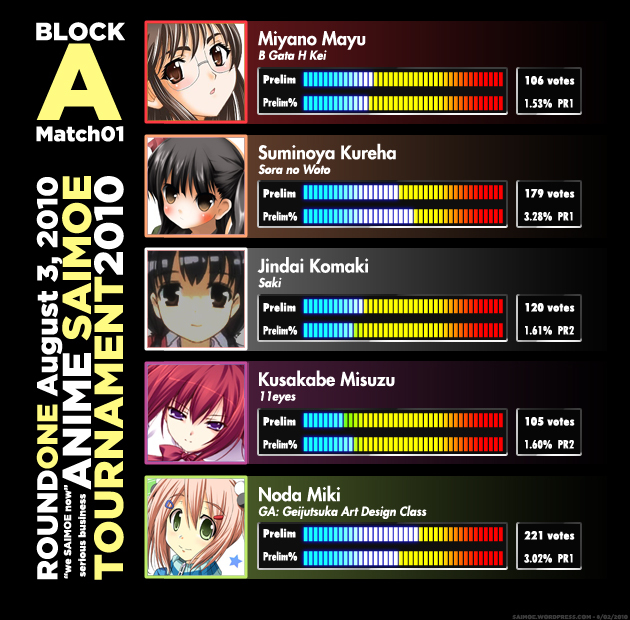 Note that the first round will be 4-way matches, while the second round and block finals are 3-way. 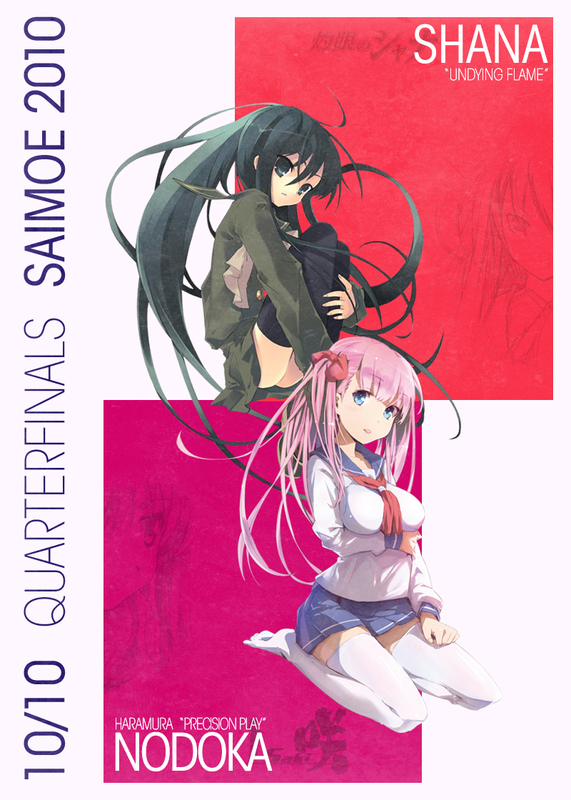 From quarterfinals on, matches will be 1-on-1. 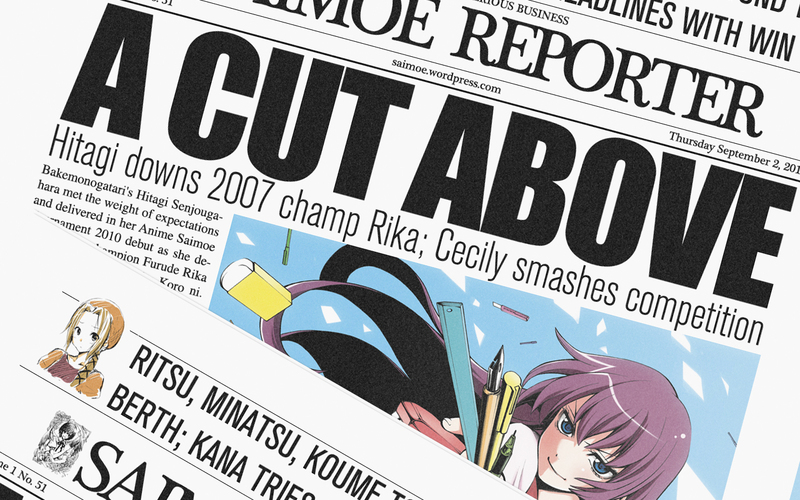 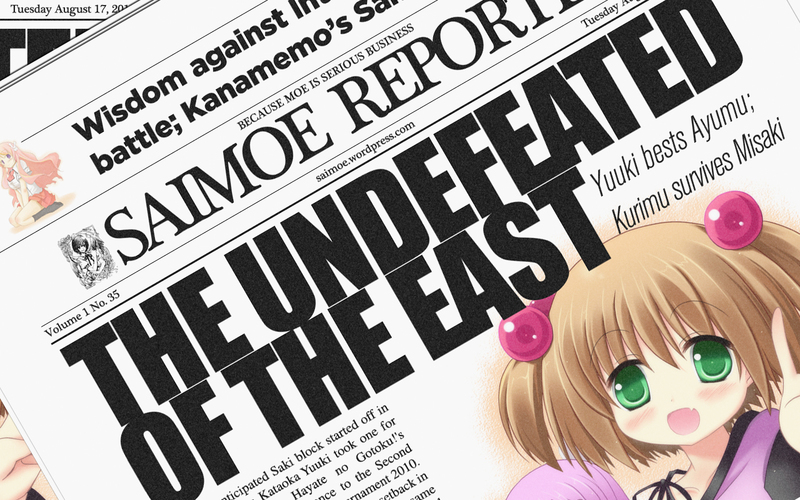 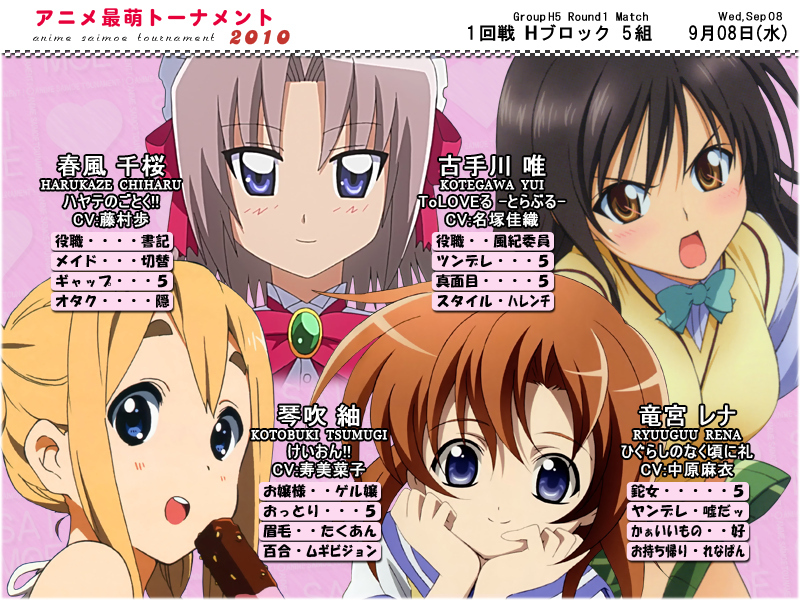 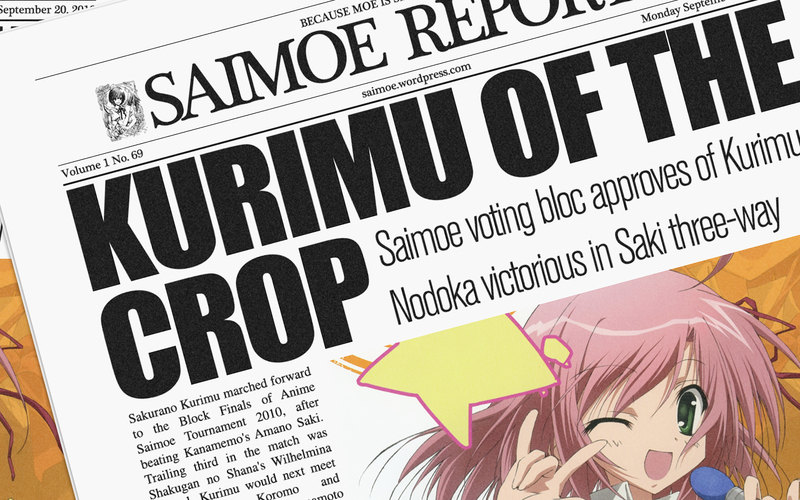 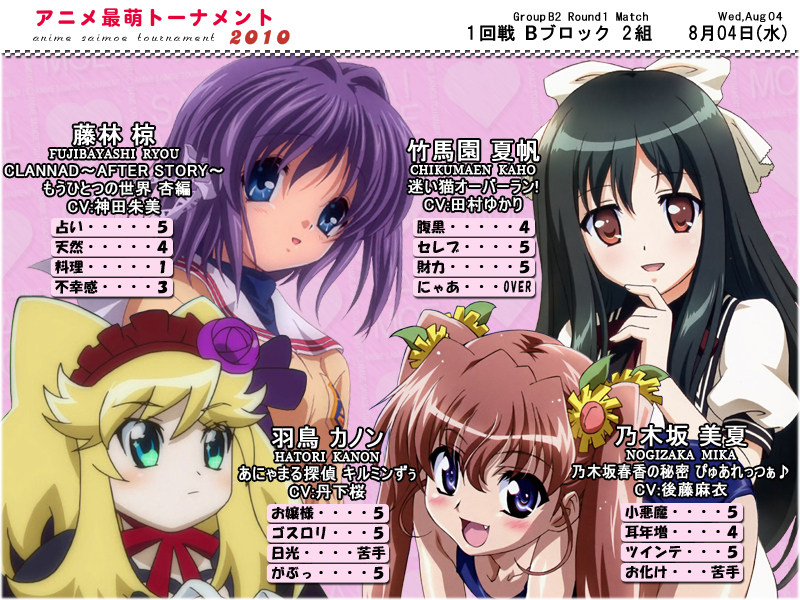 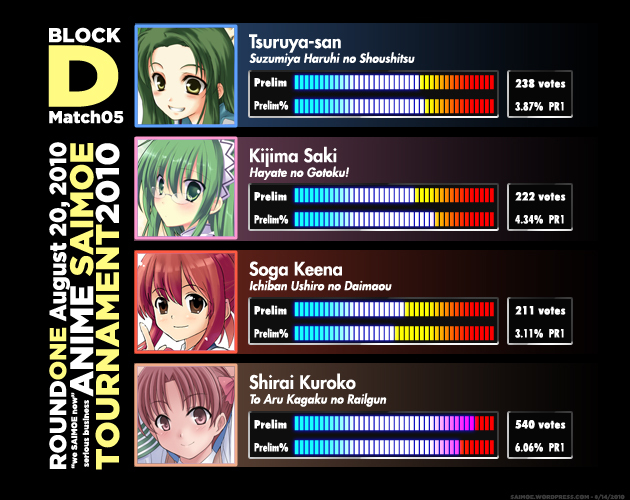 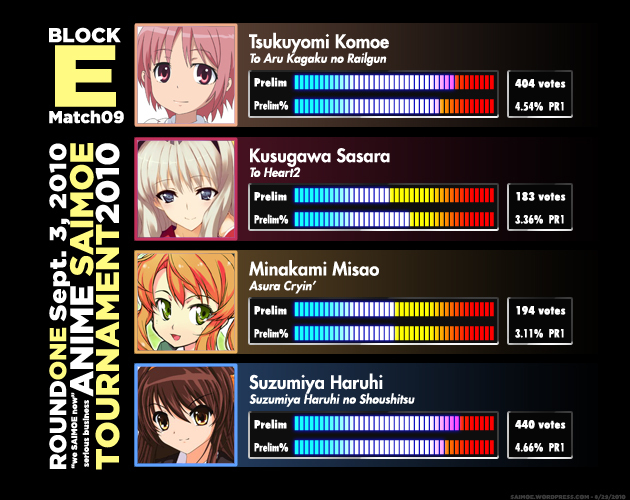 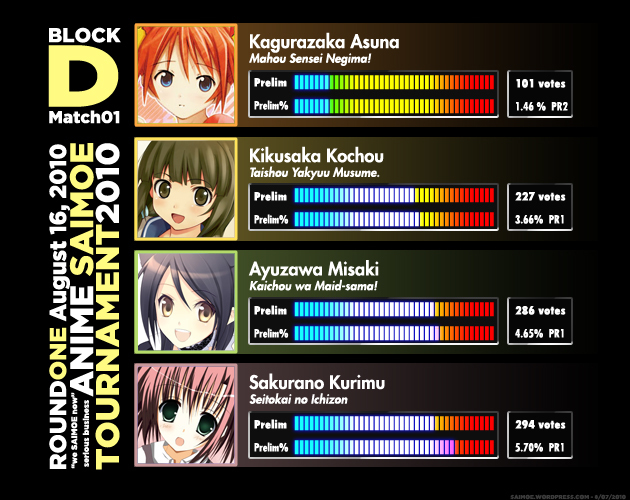 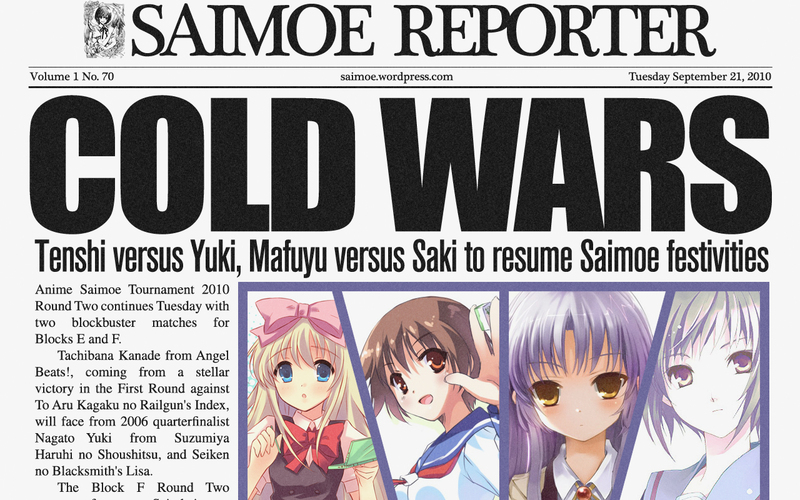 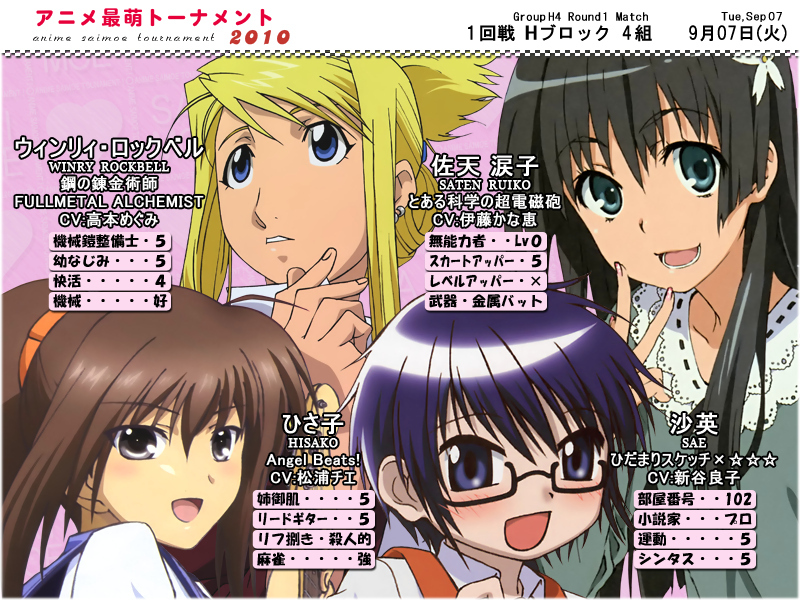 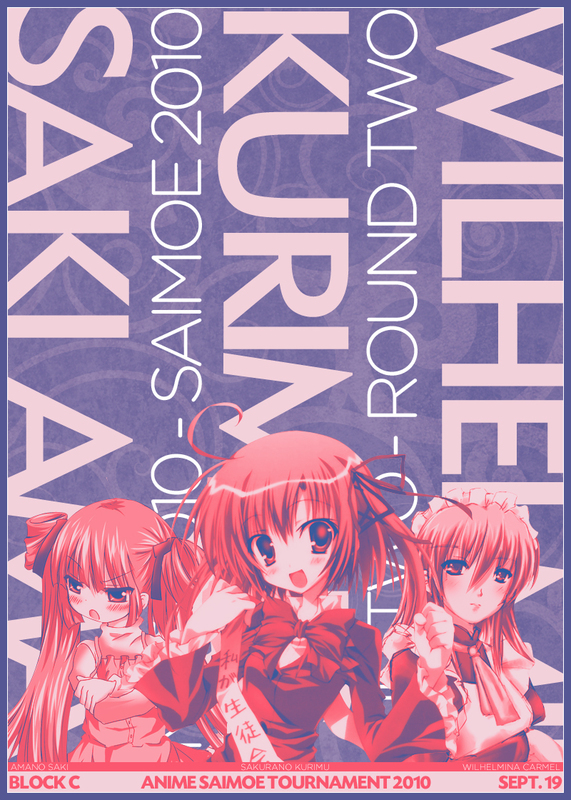 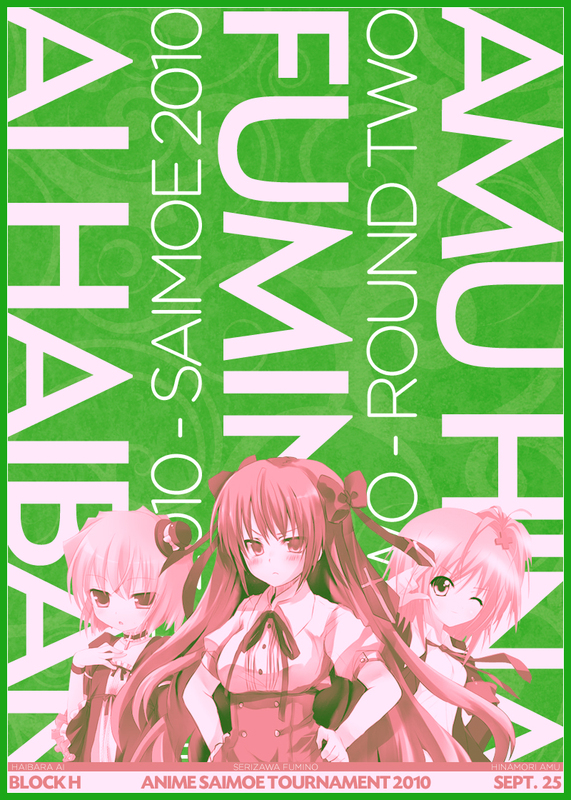 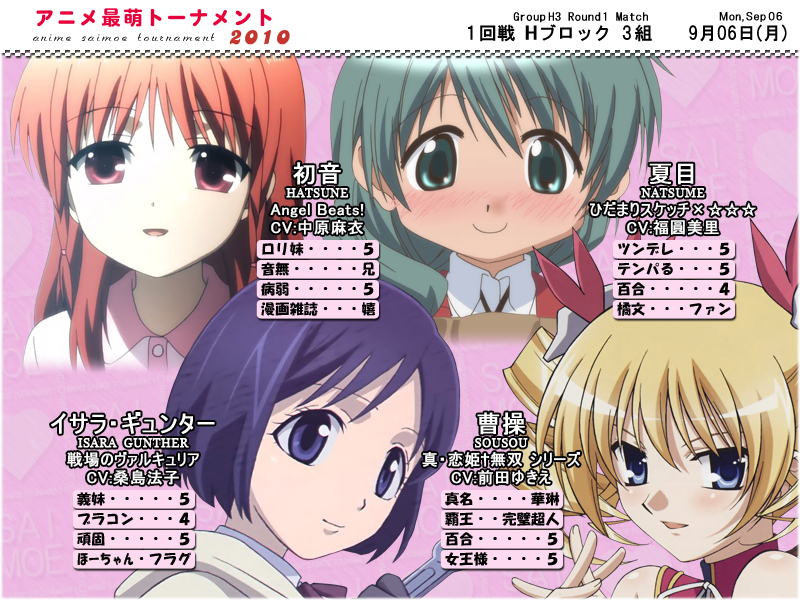 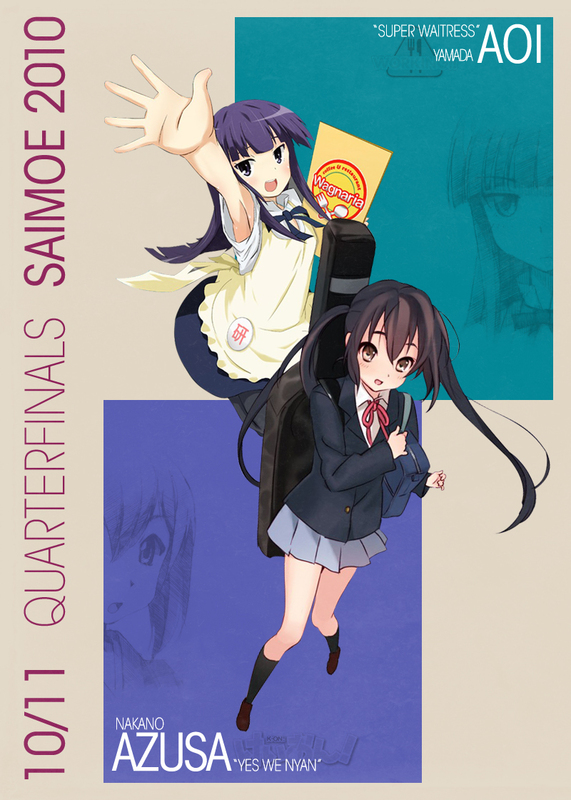 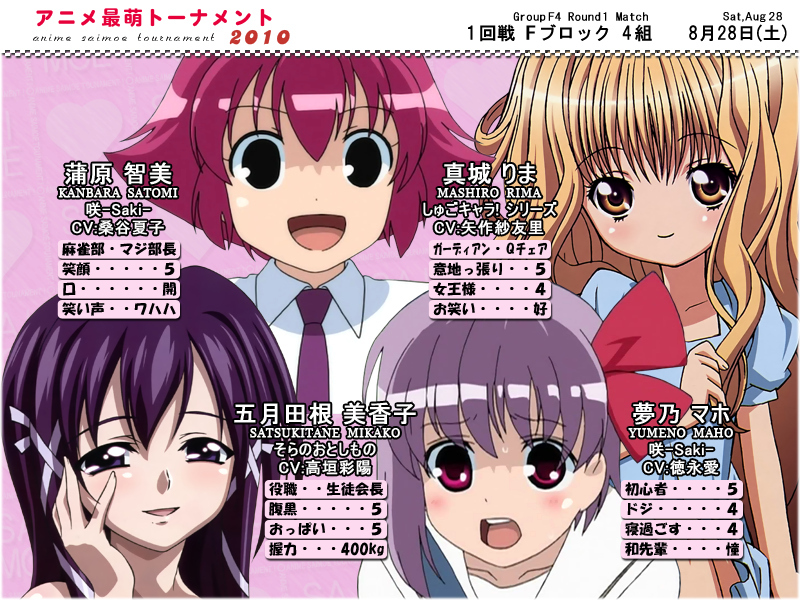 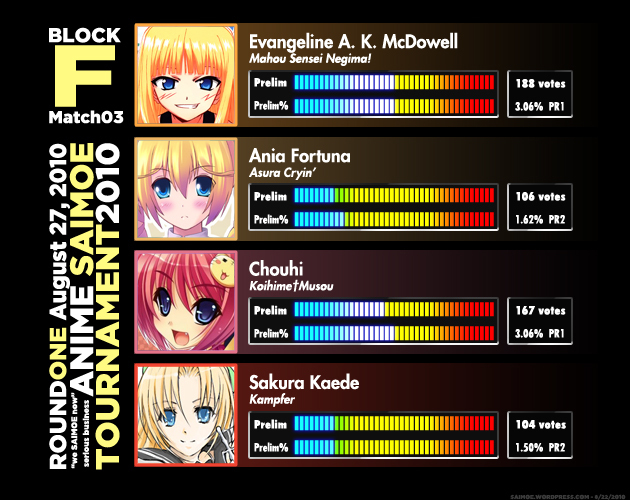 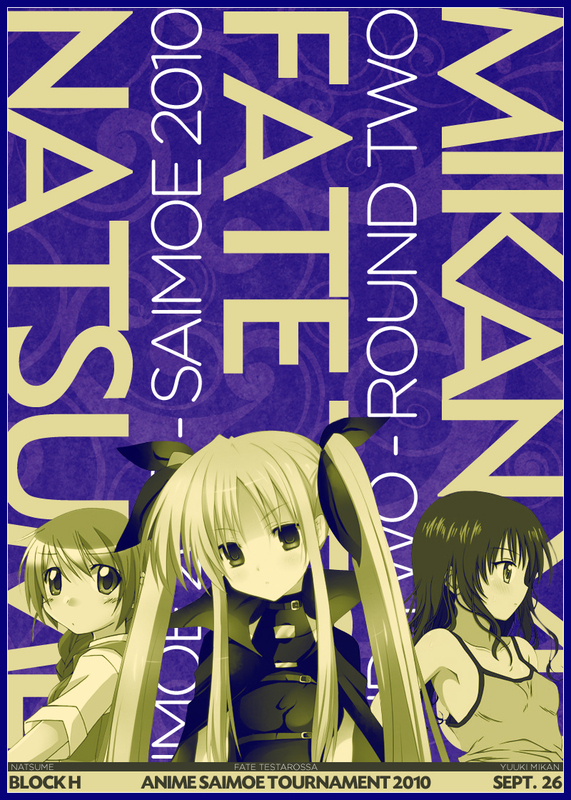 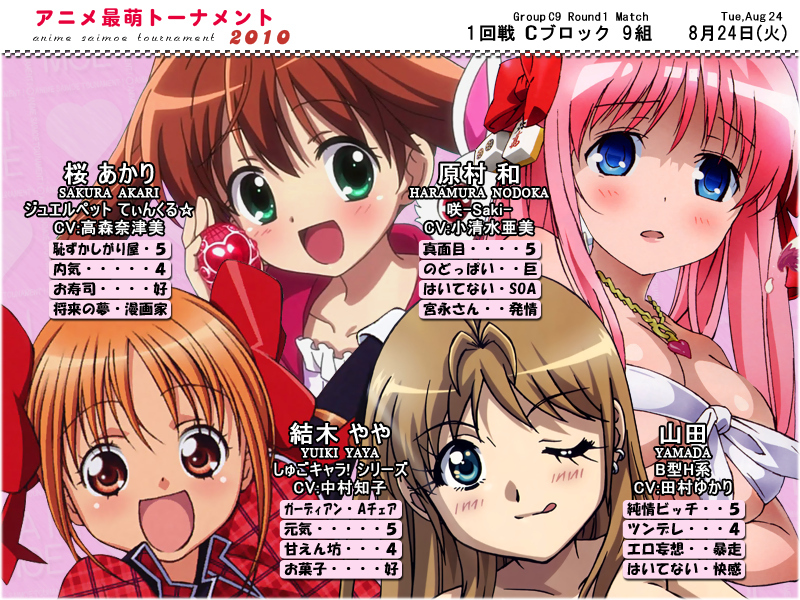 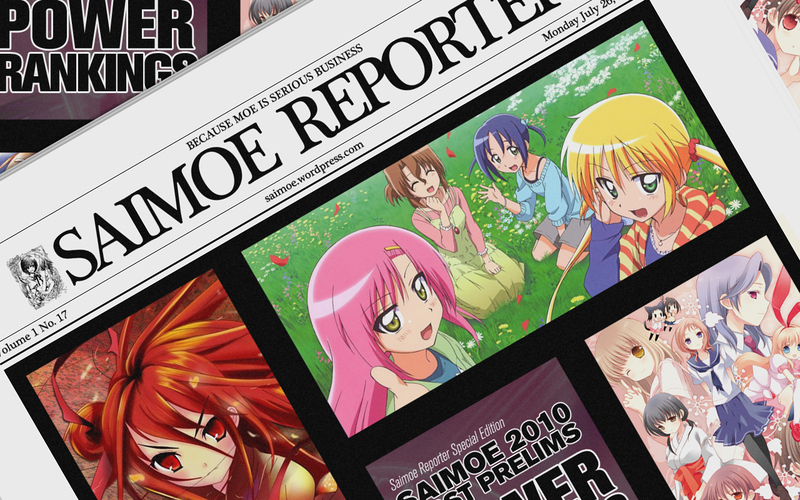 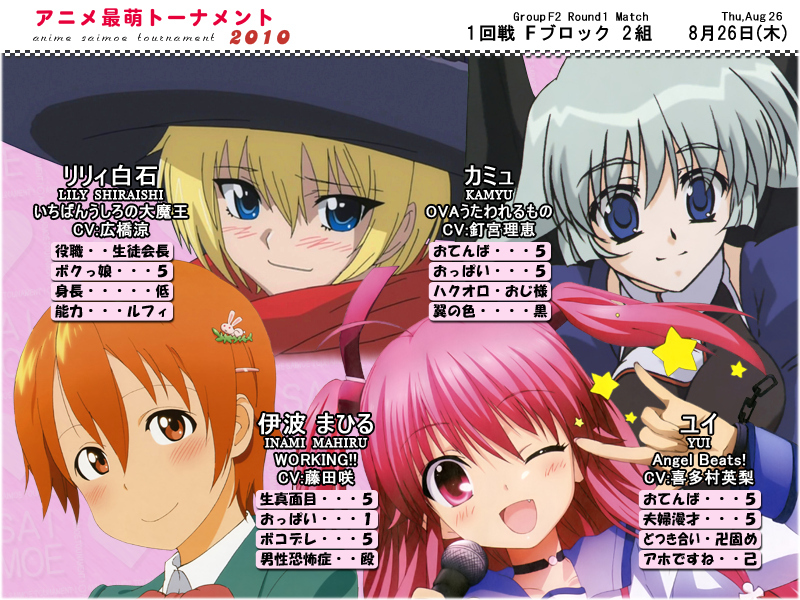 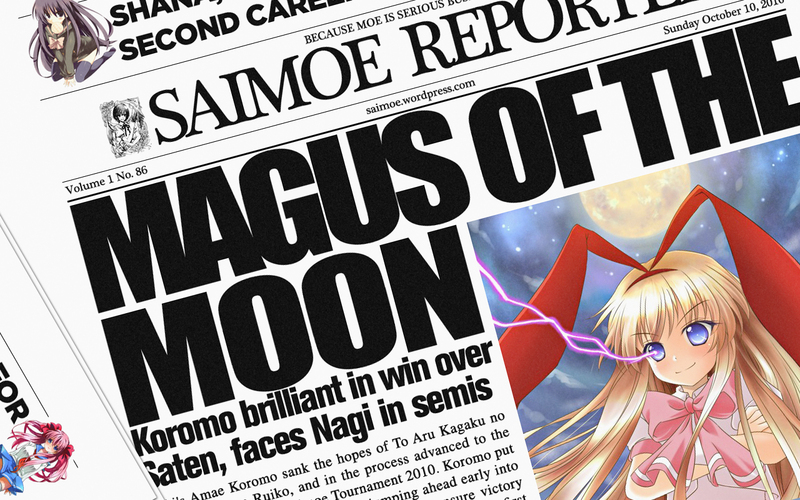 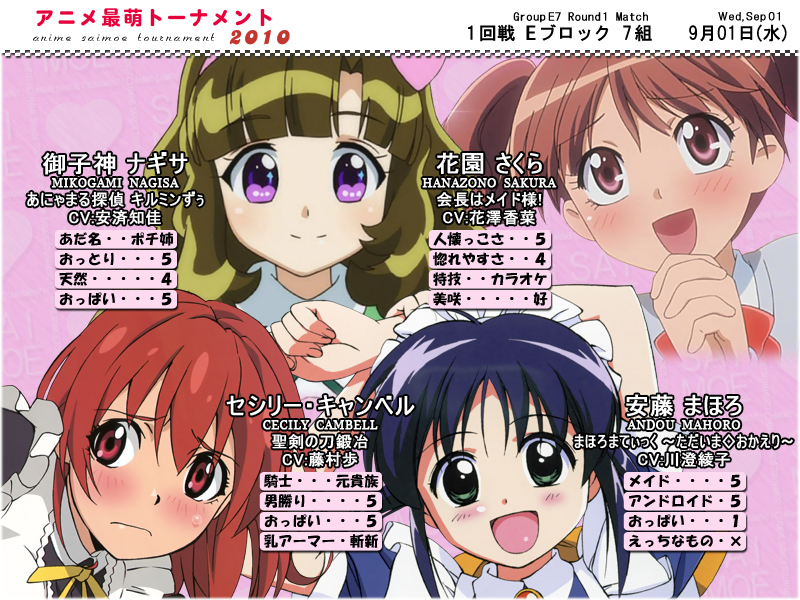 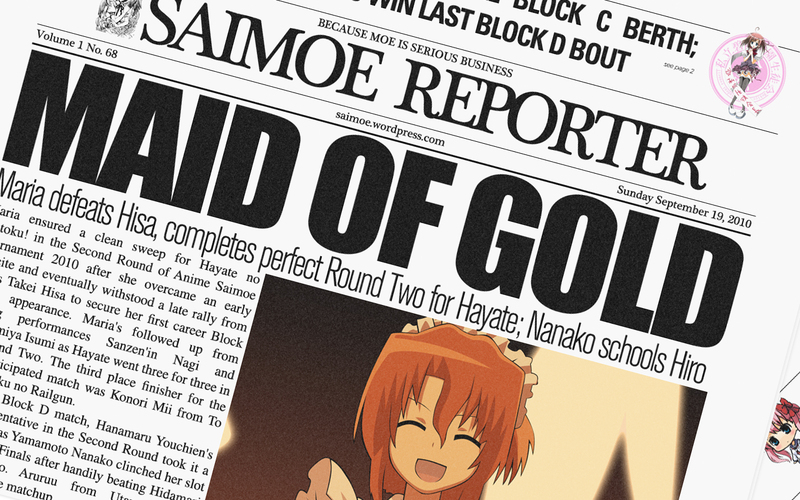 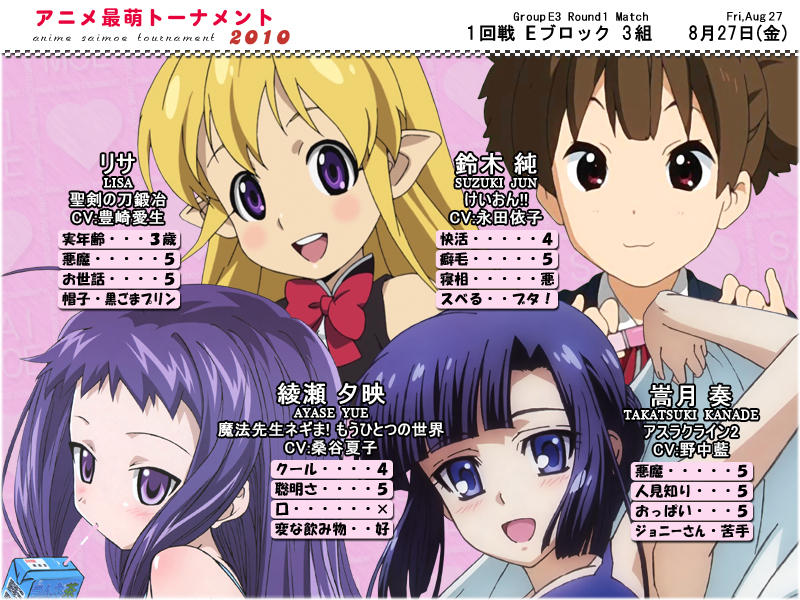 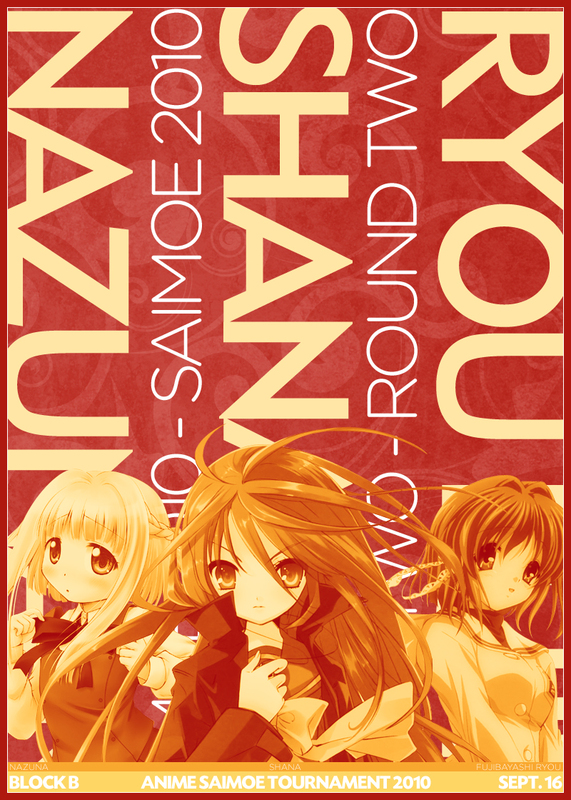 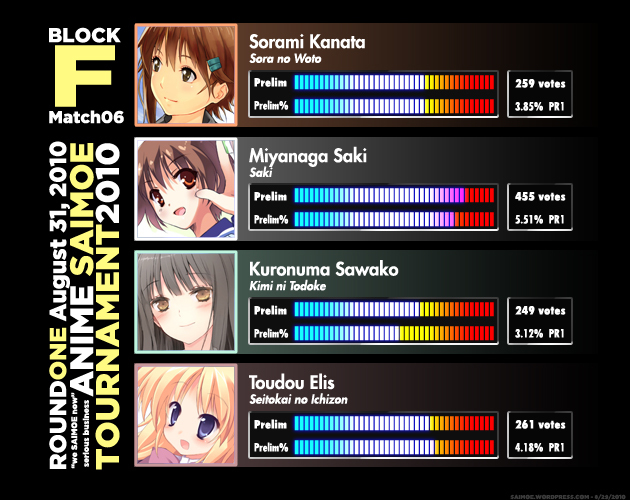 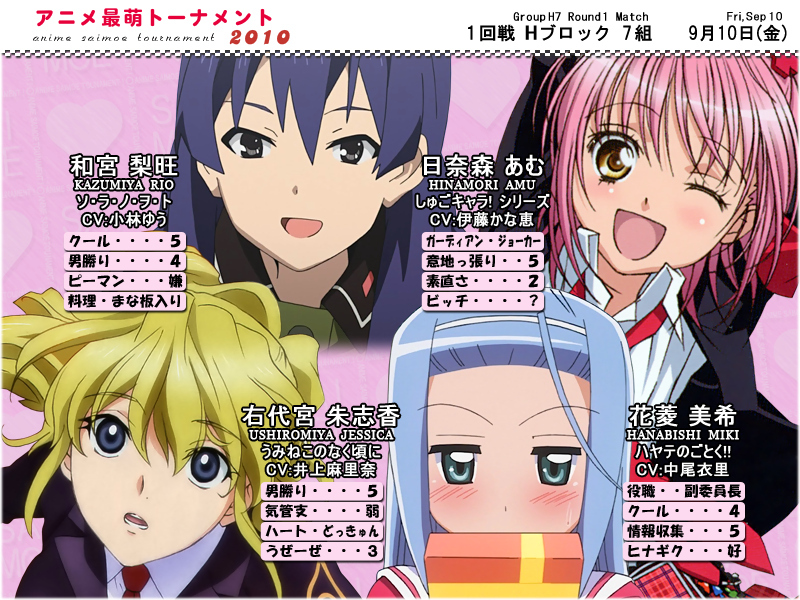 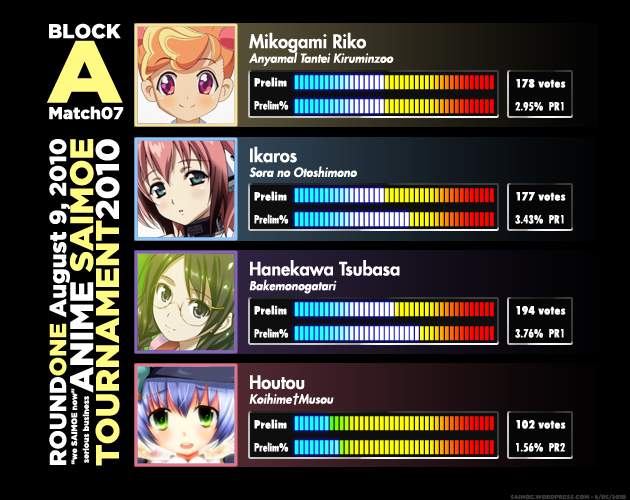 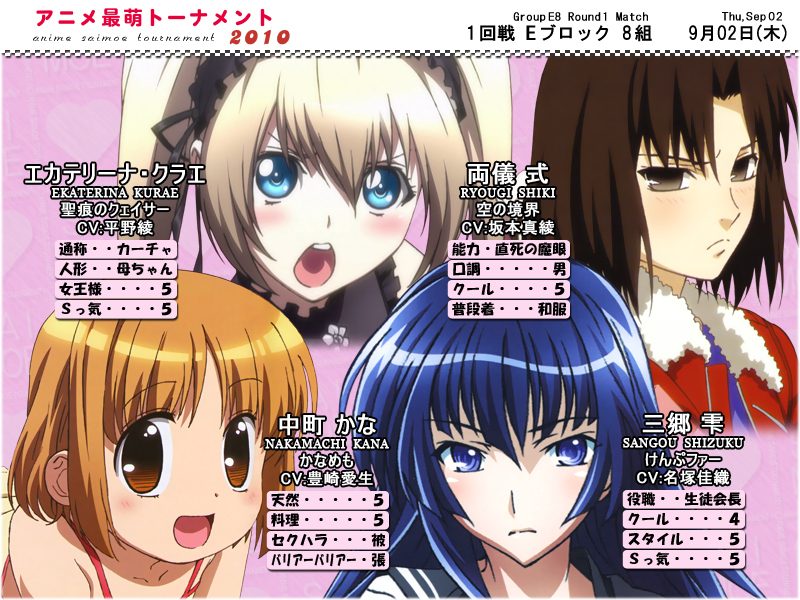 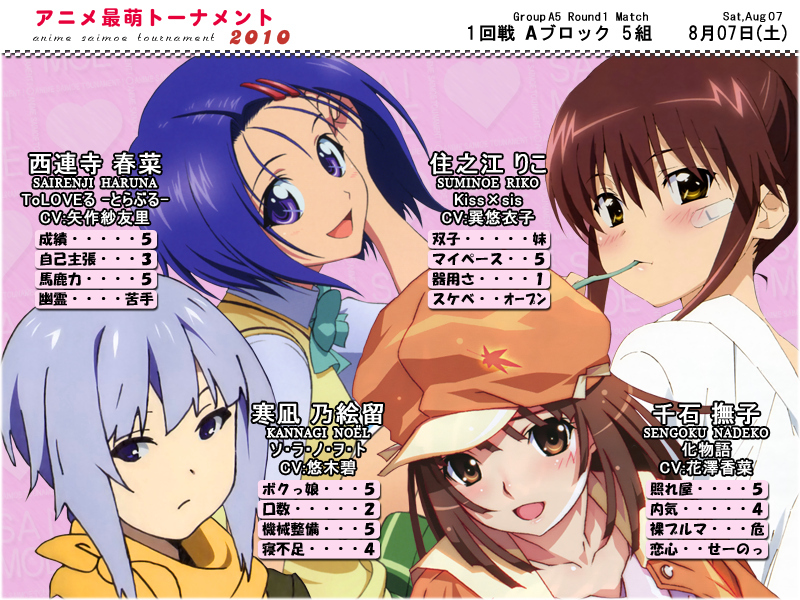 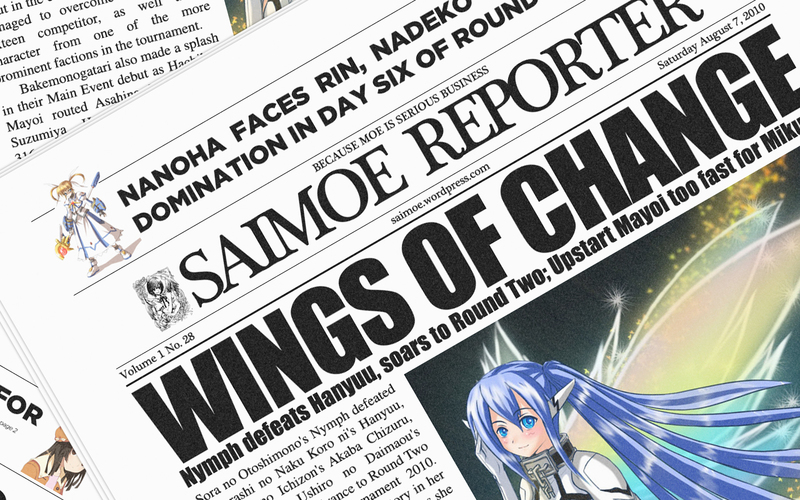 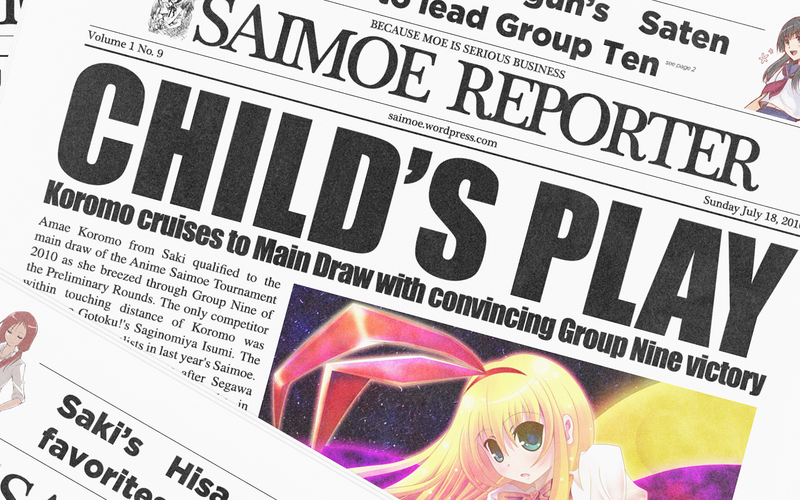 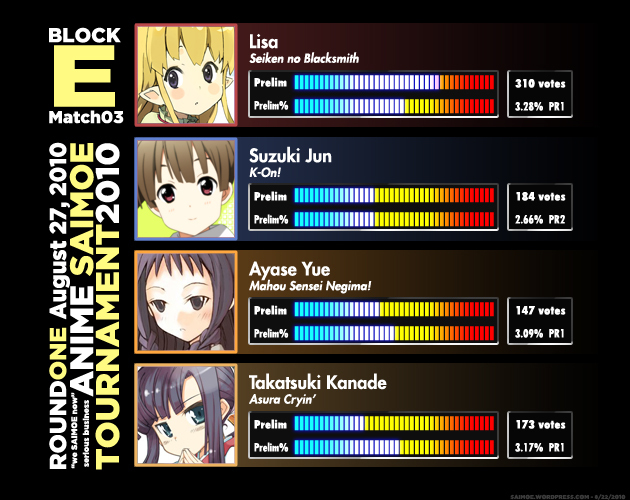 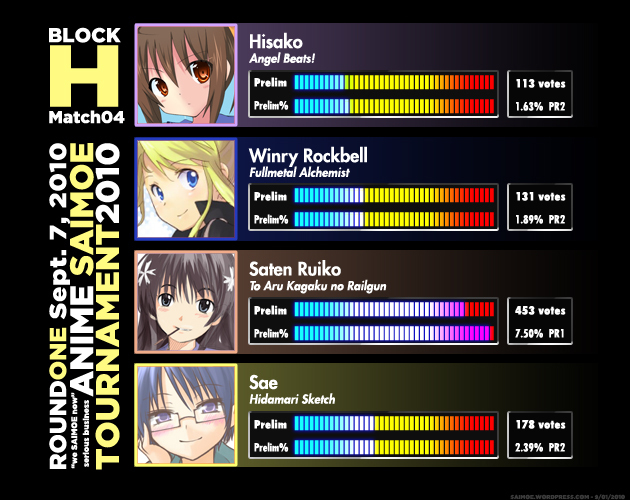 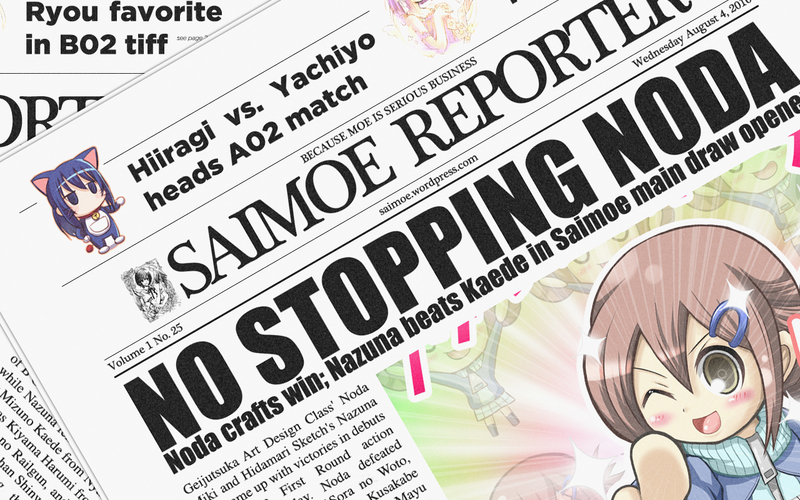 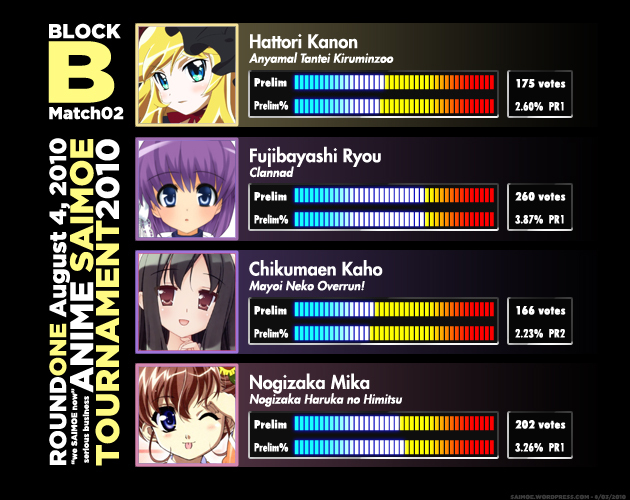 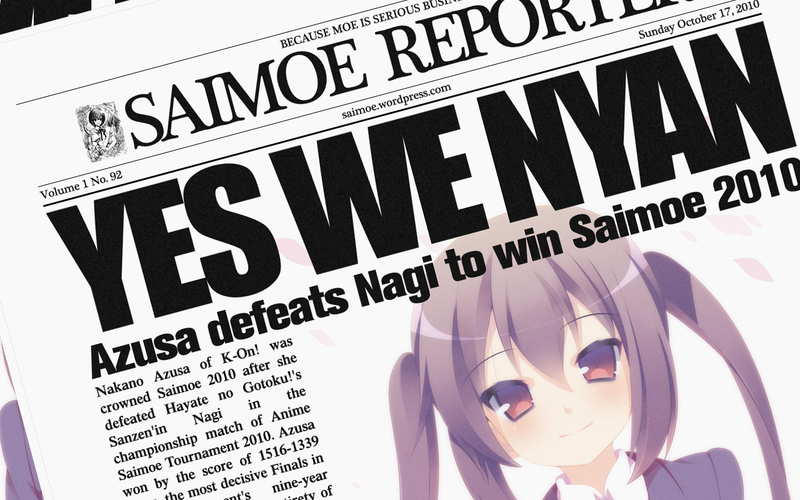 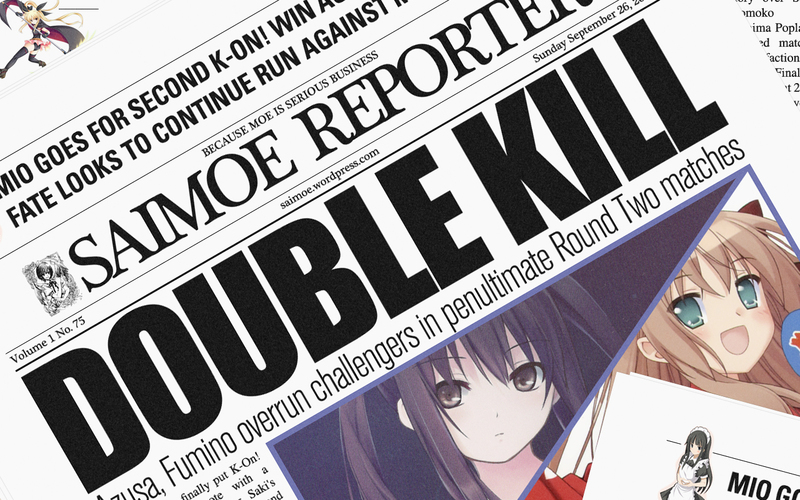 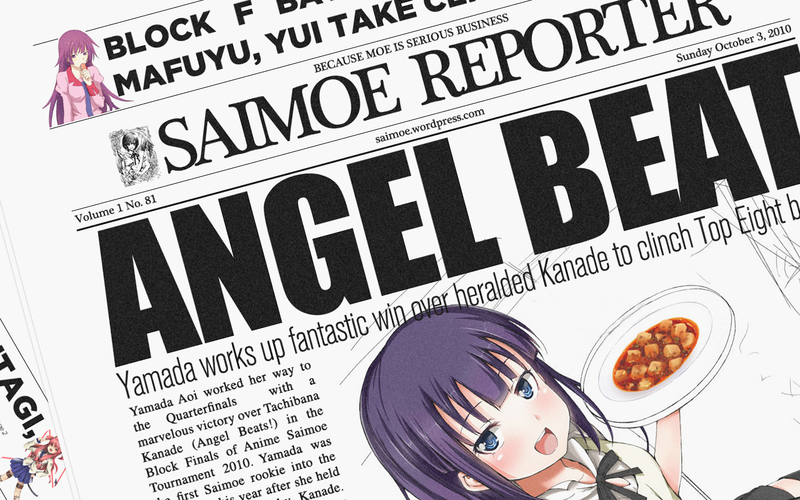 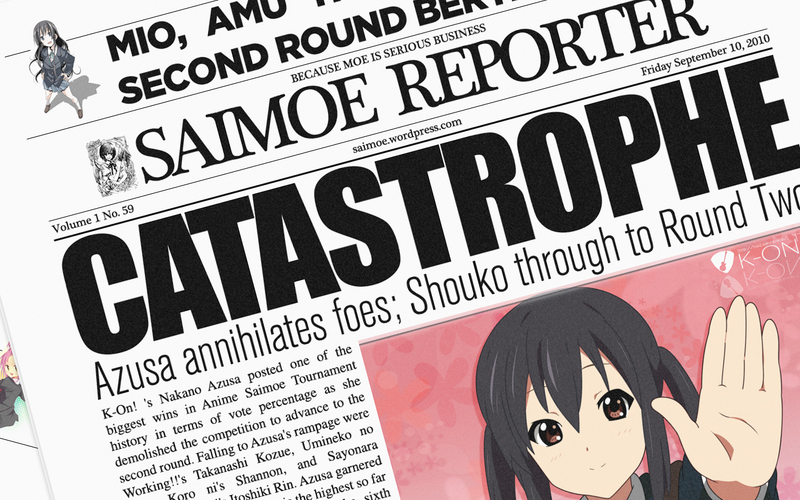 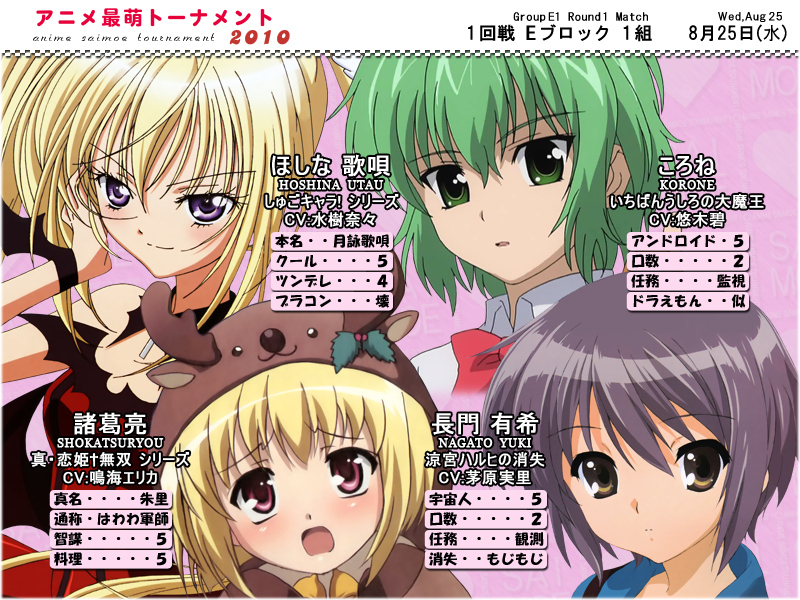 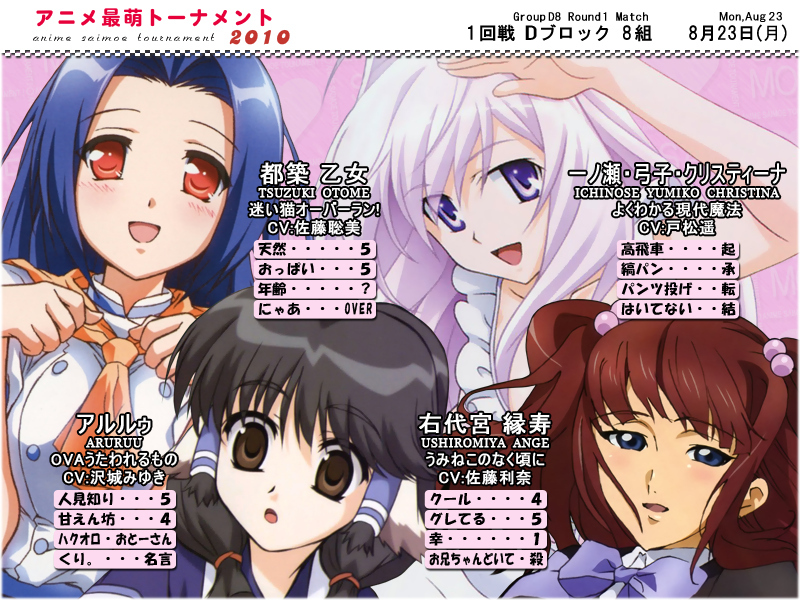 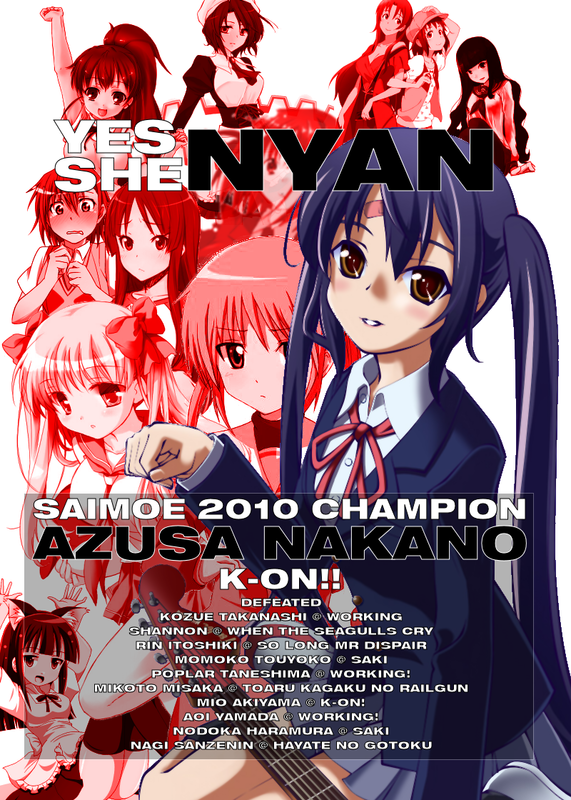 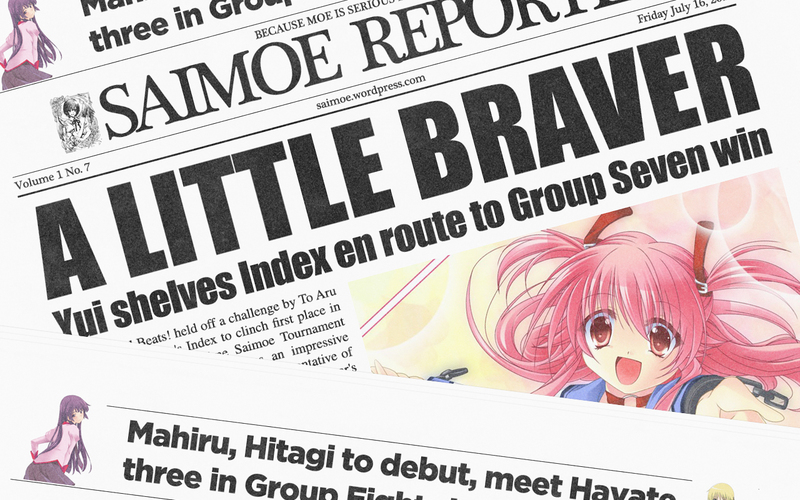 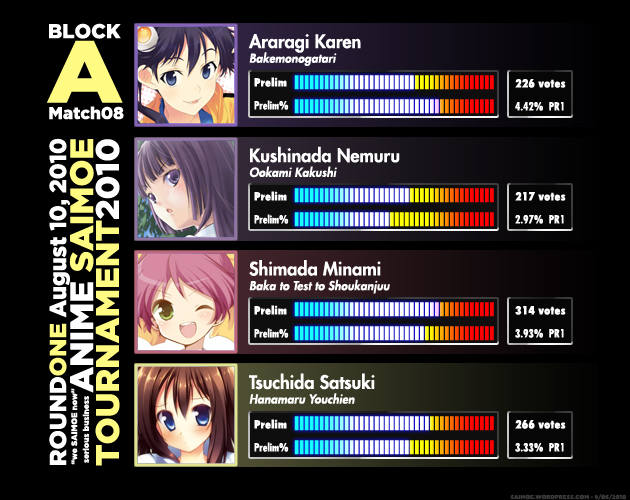 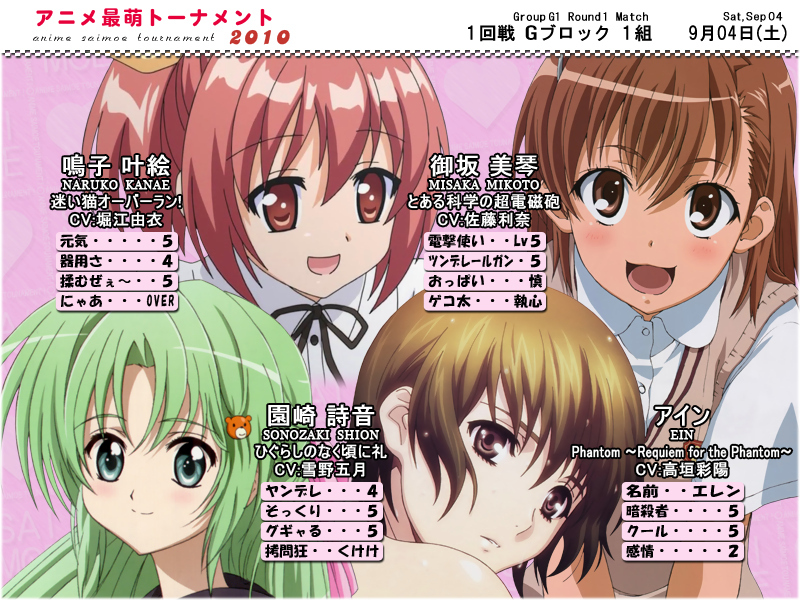 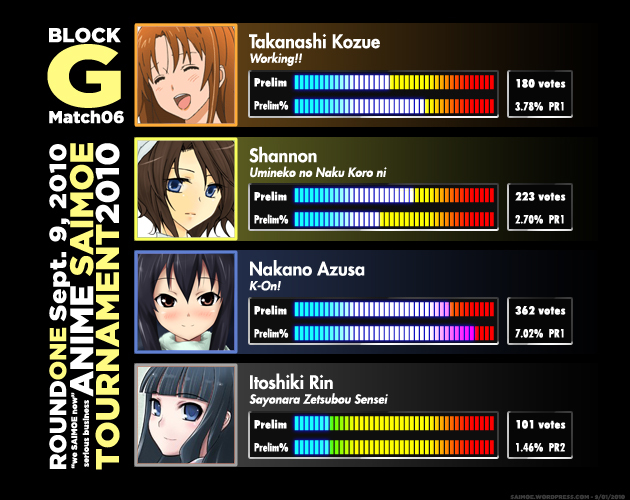 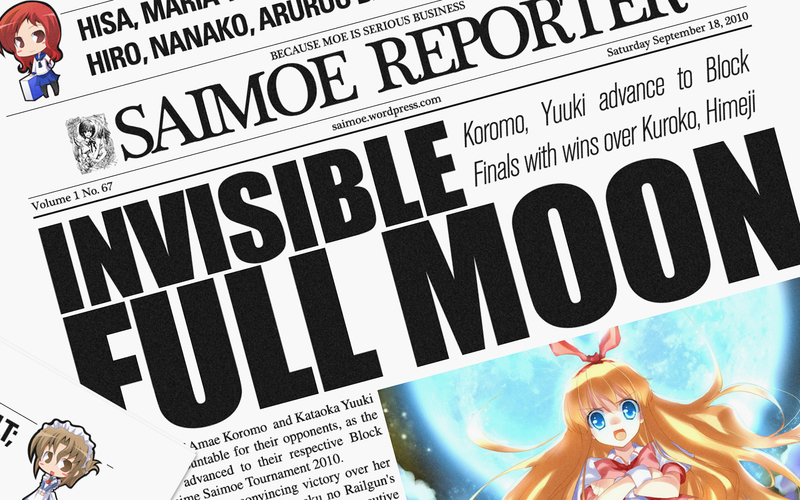 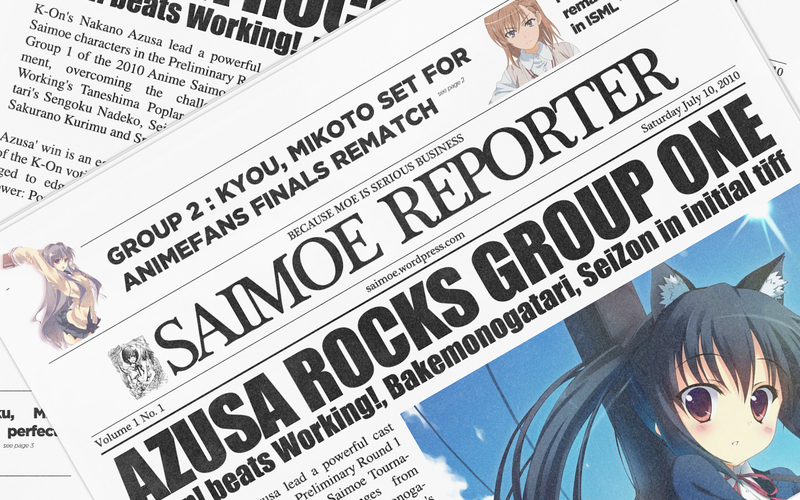 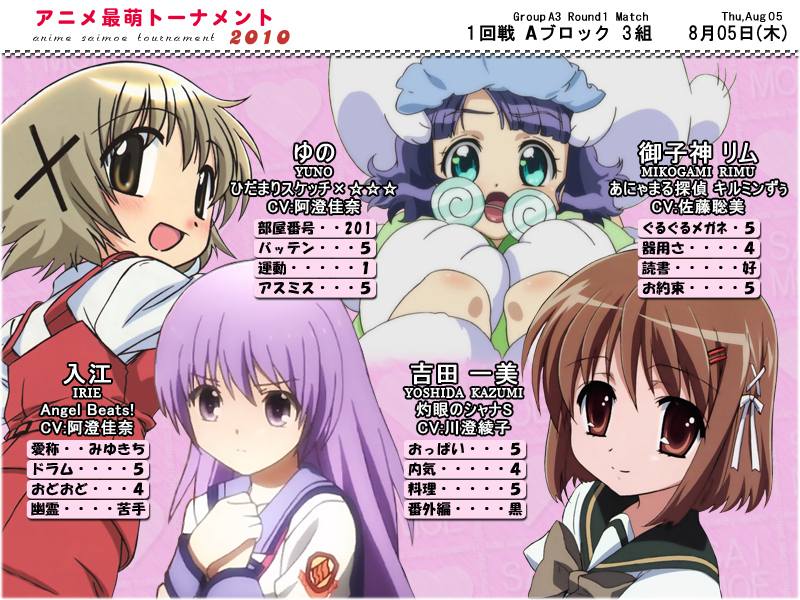 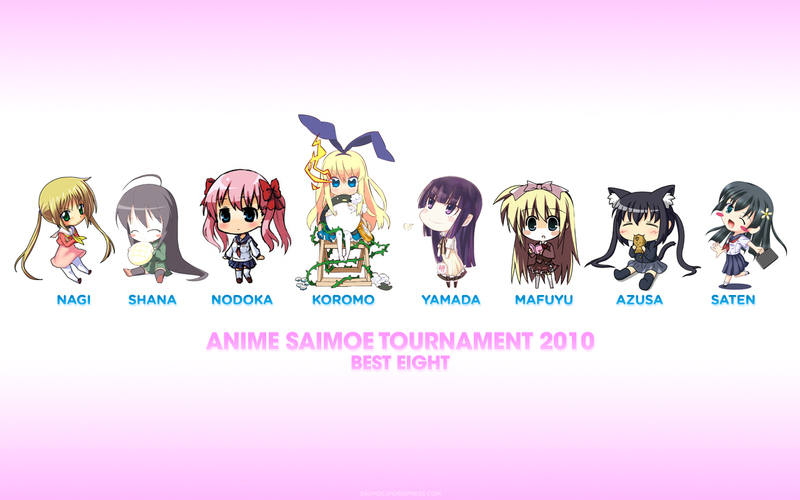 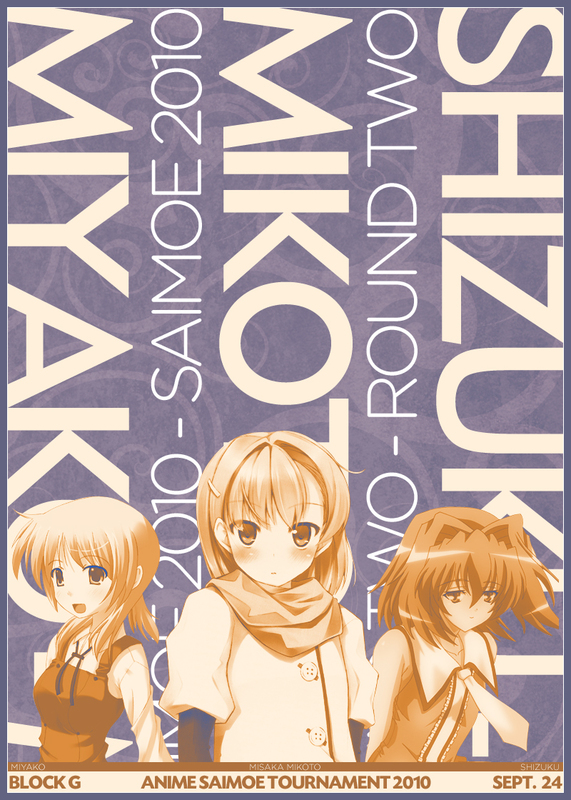 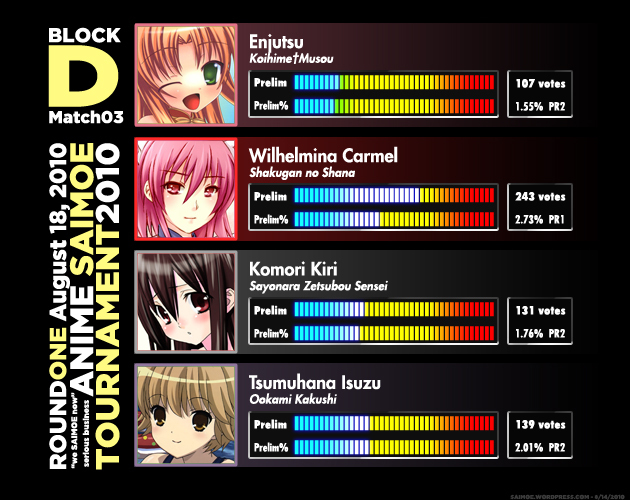 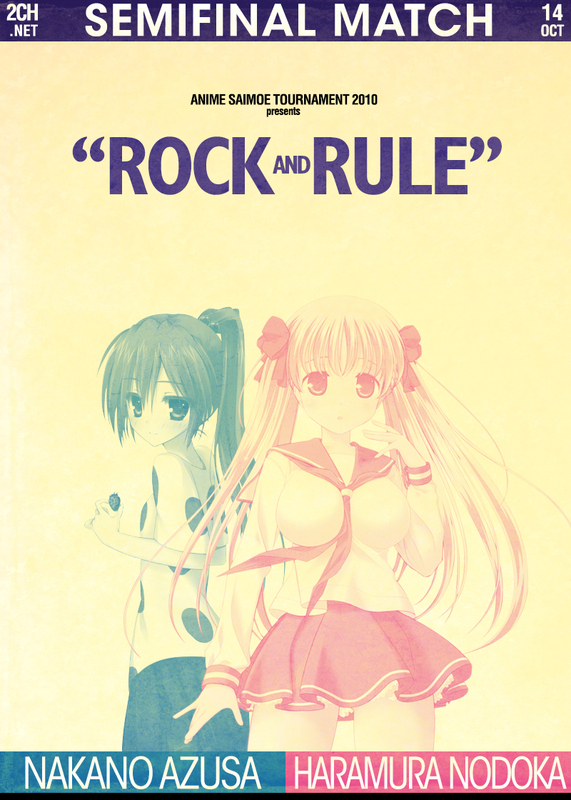 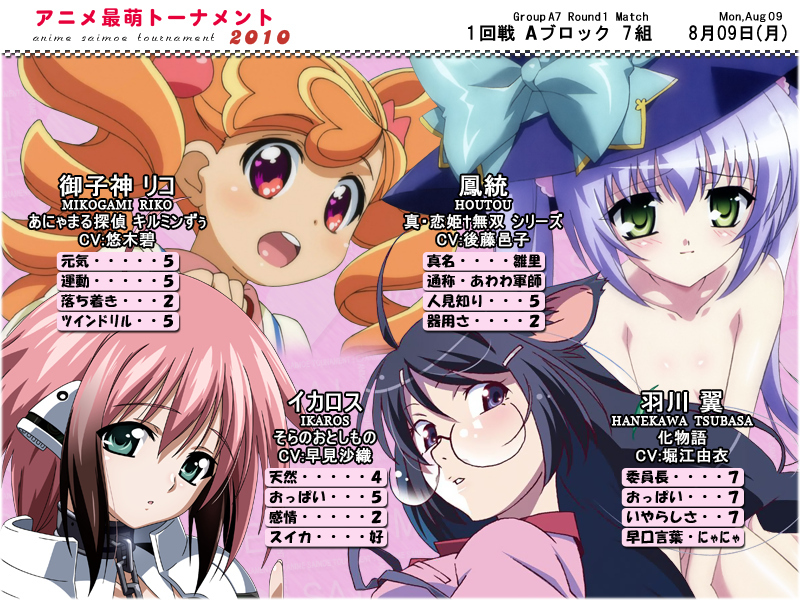 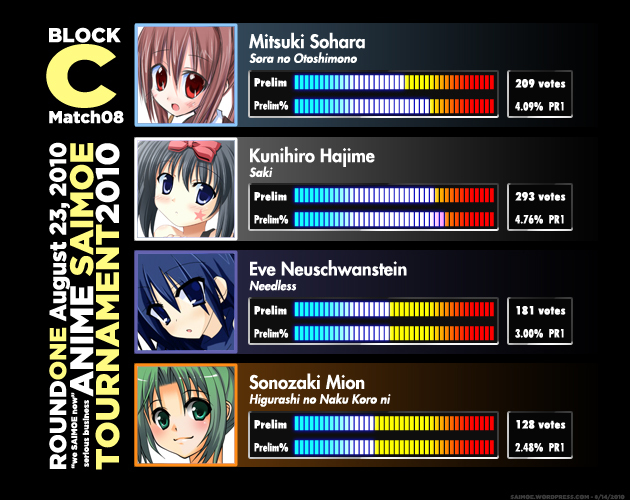 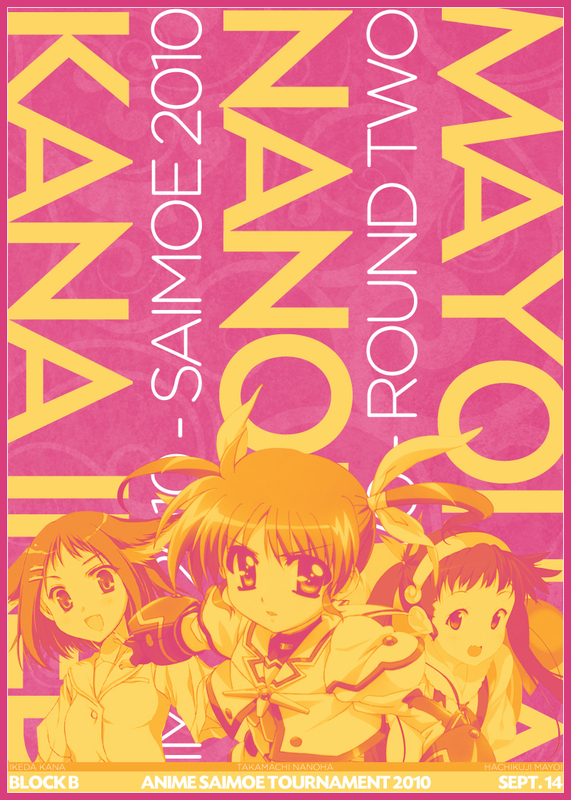 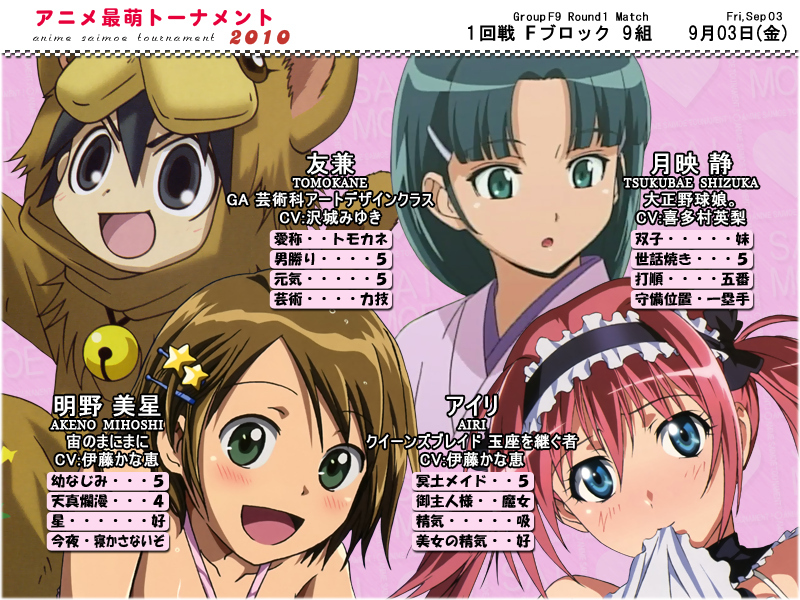 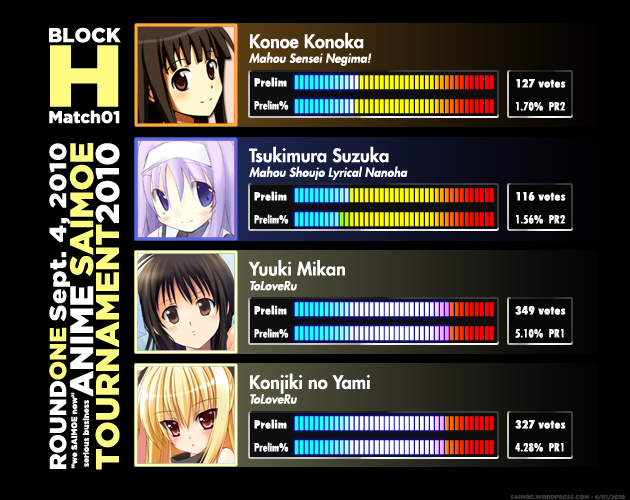 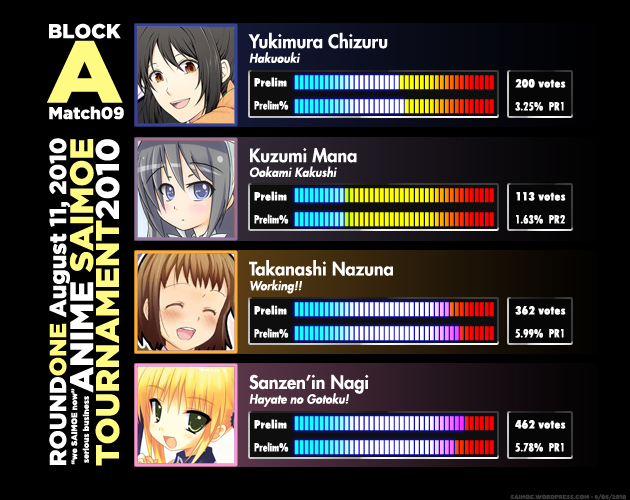 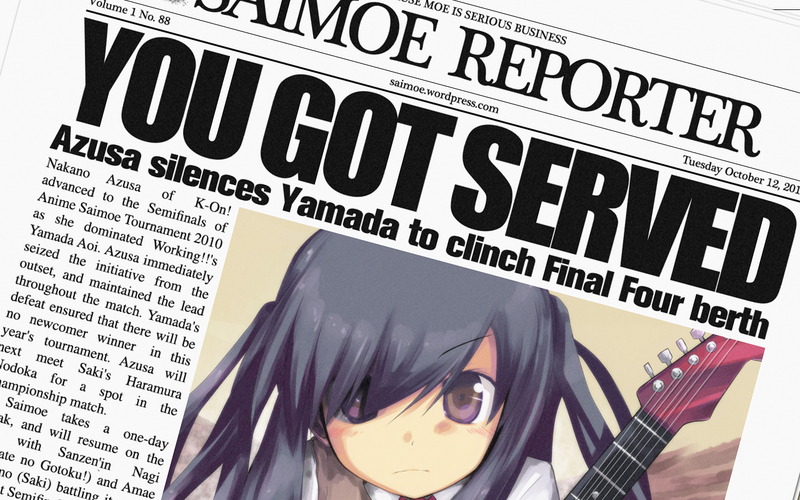 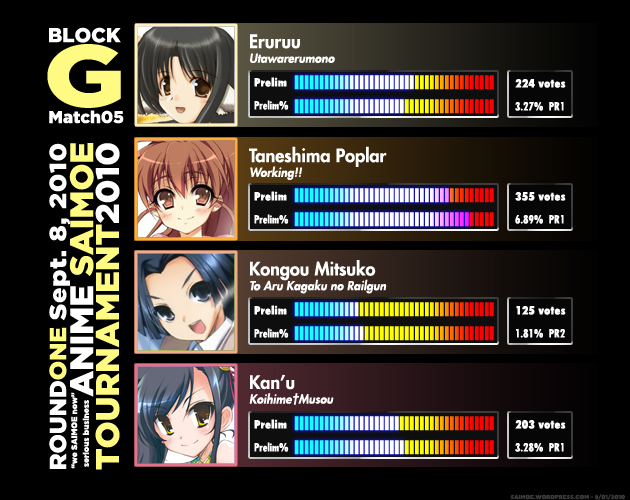 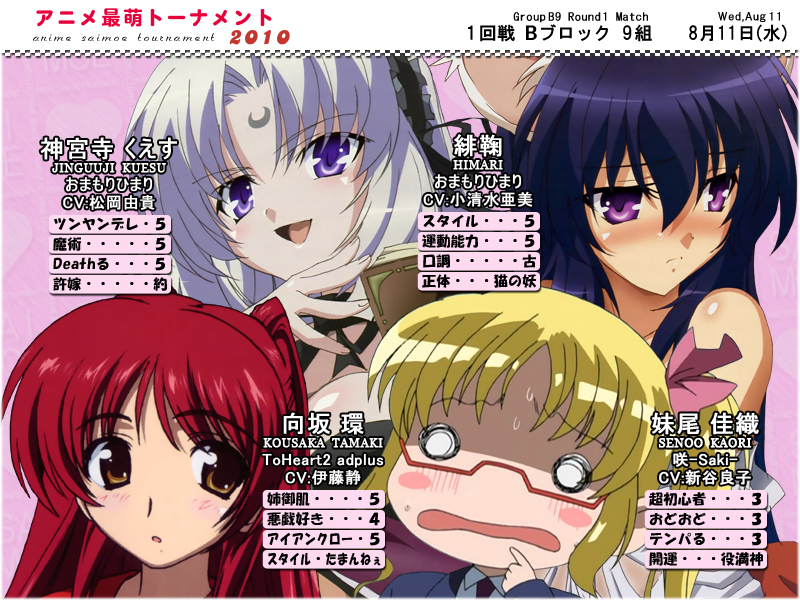 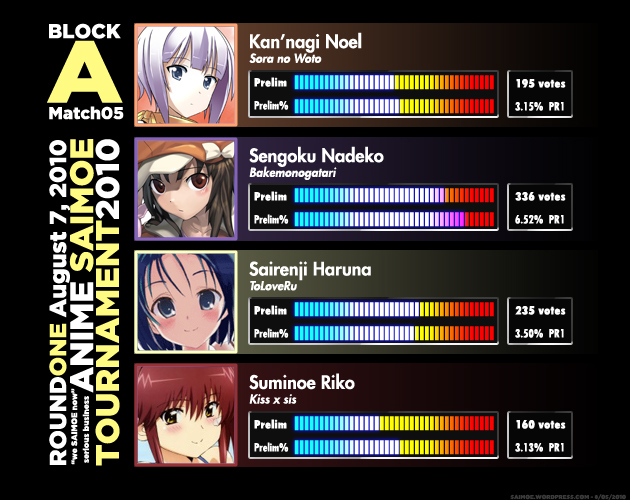 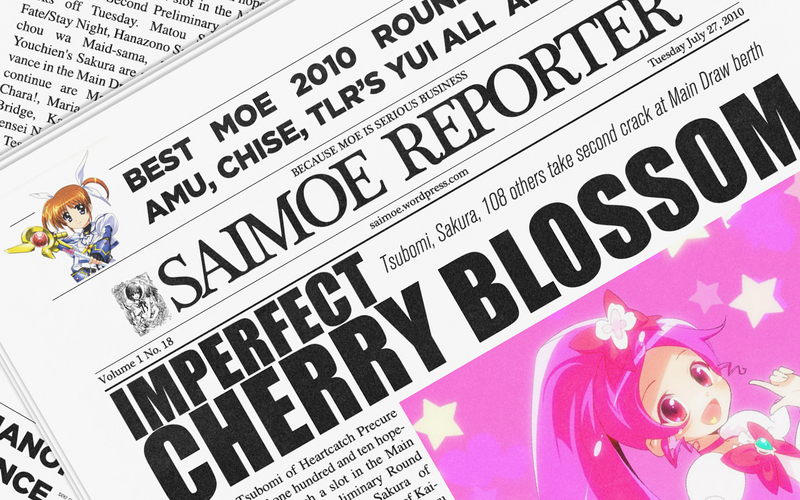 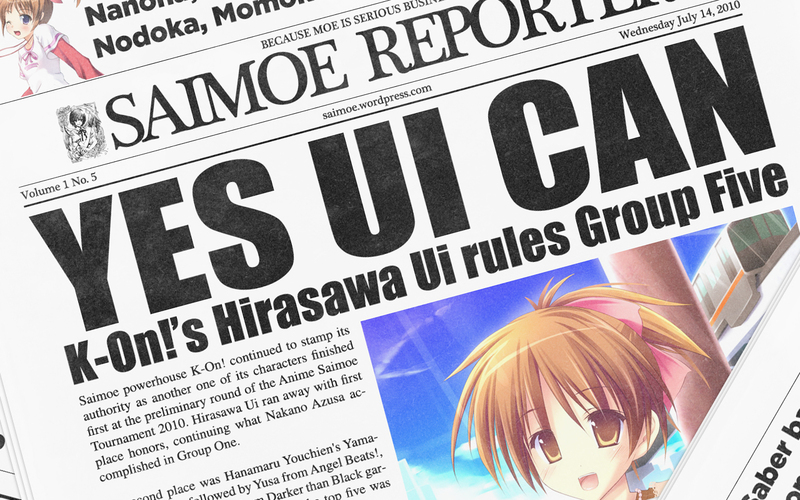 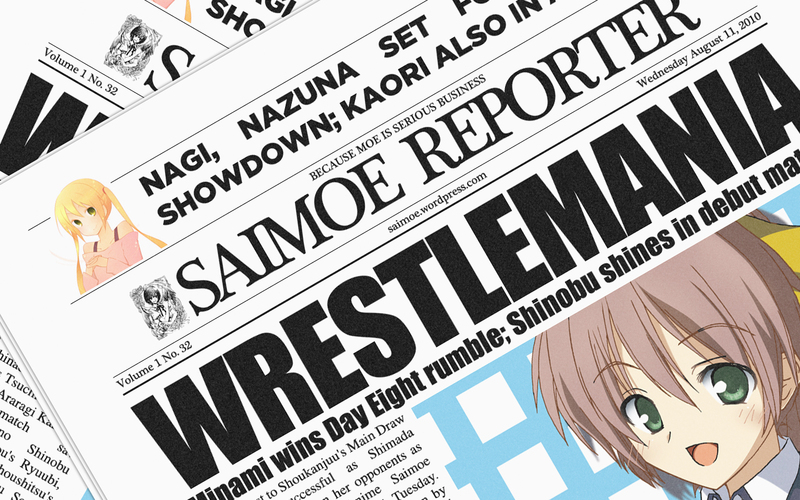 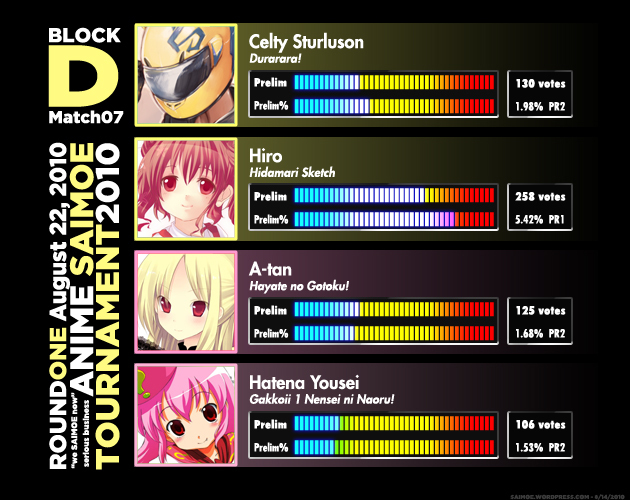 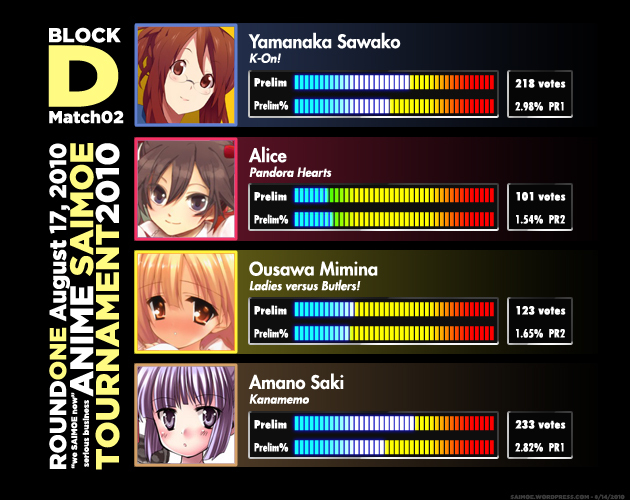 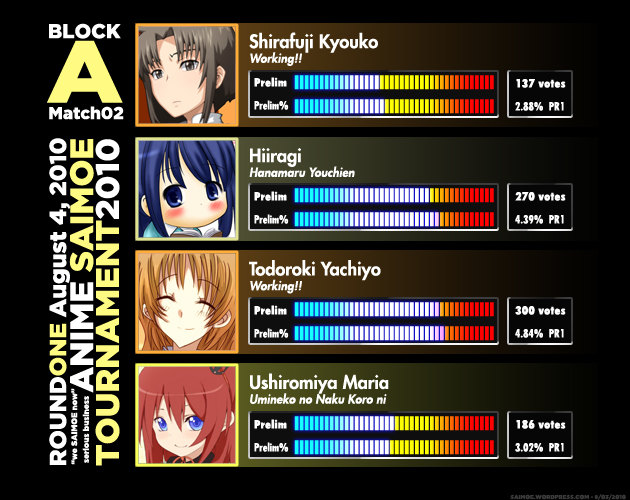 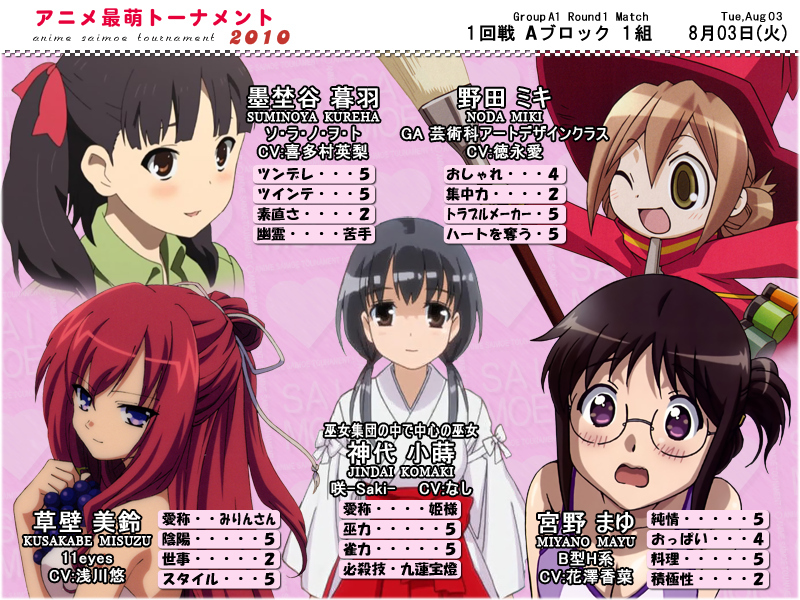 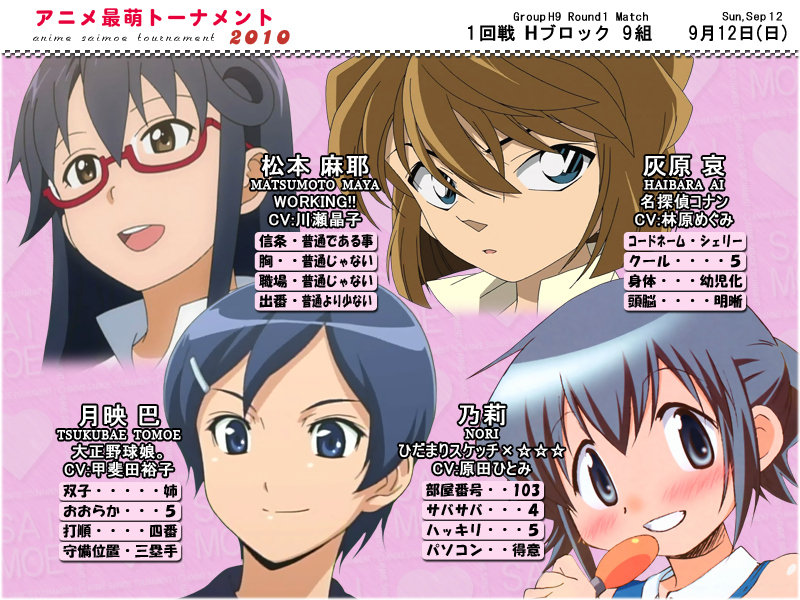 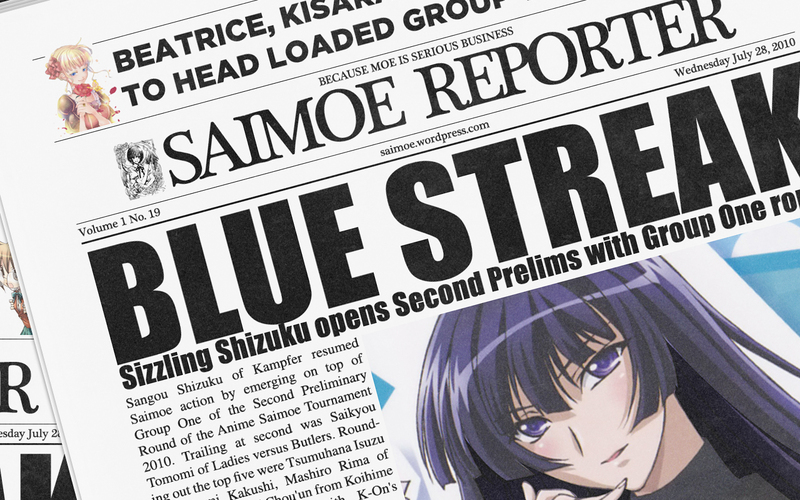 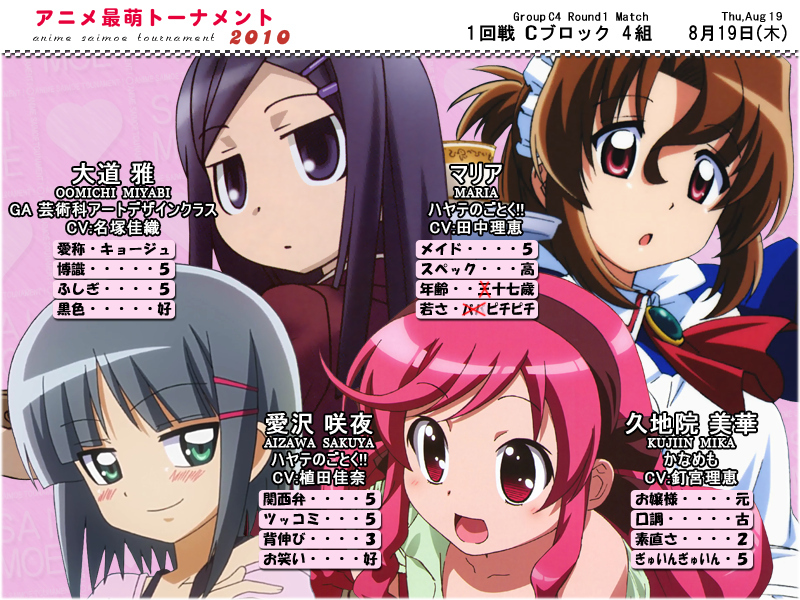 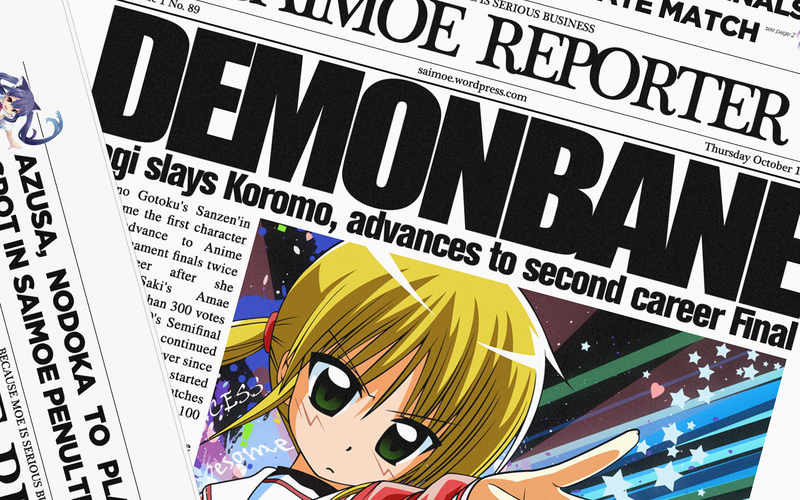 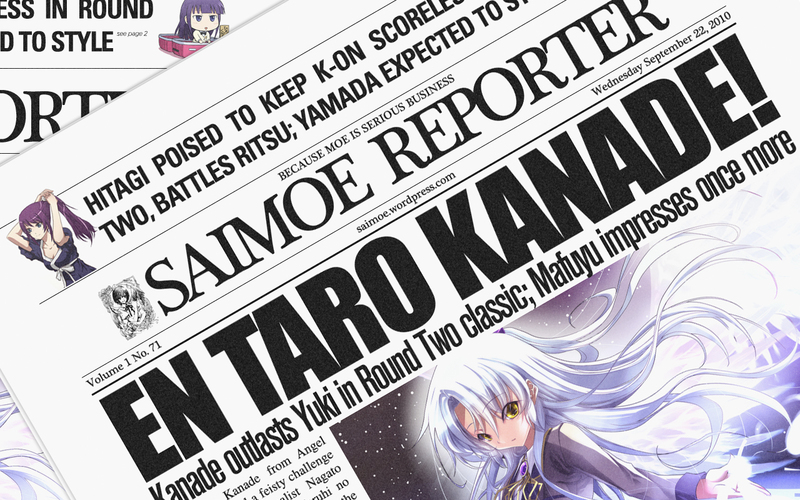 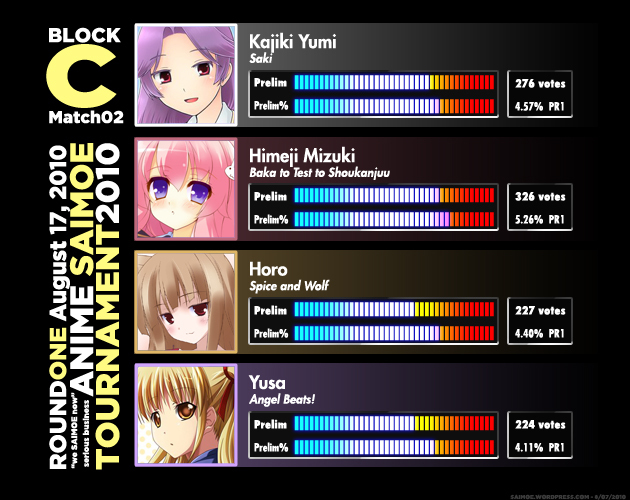 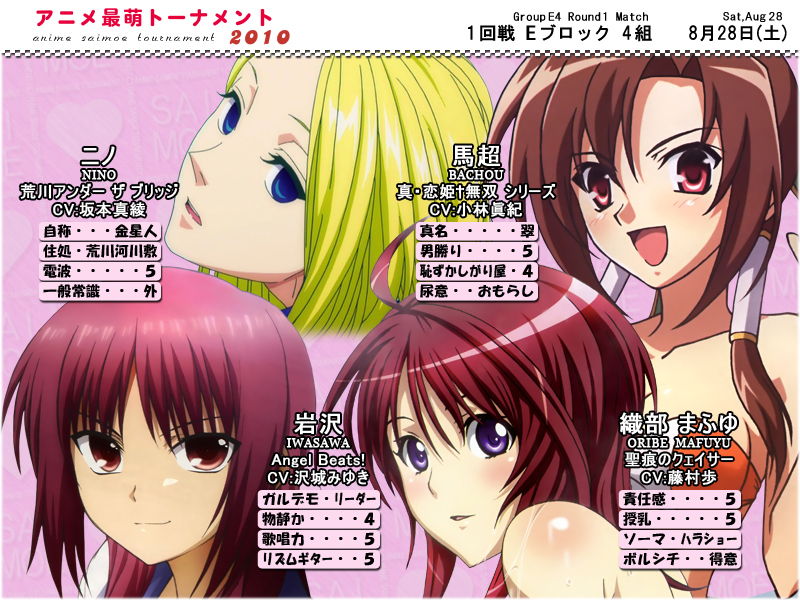 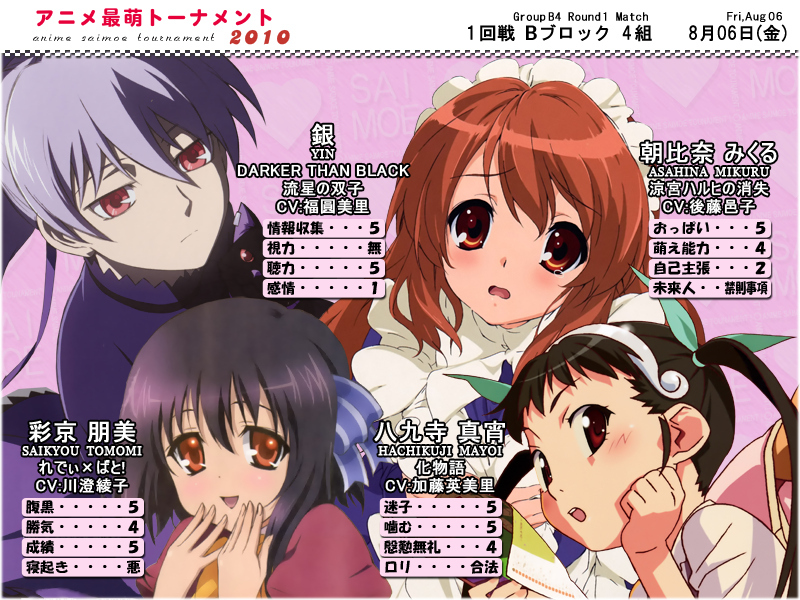 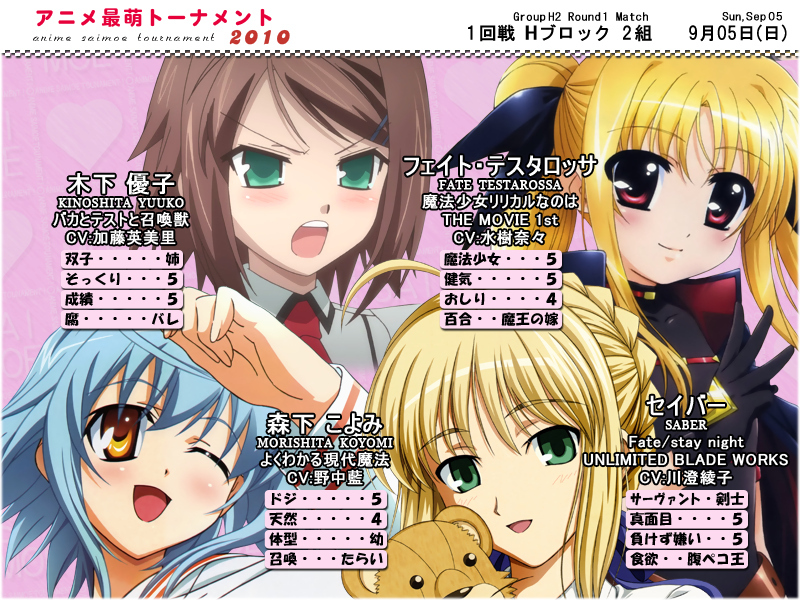 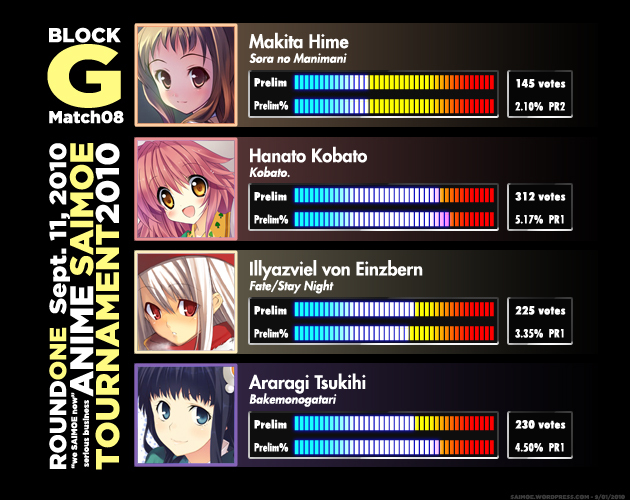 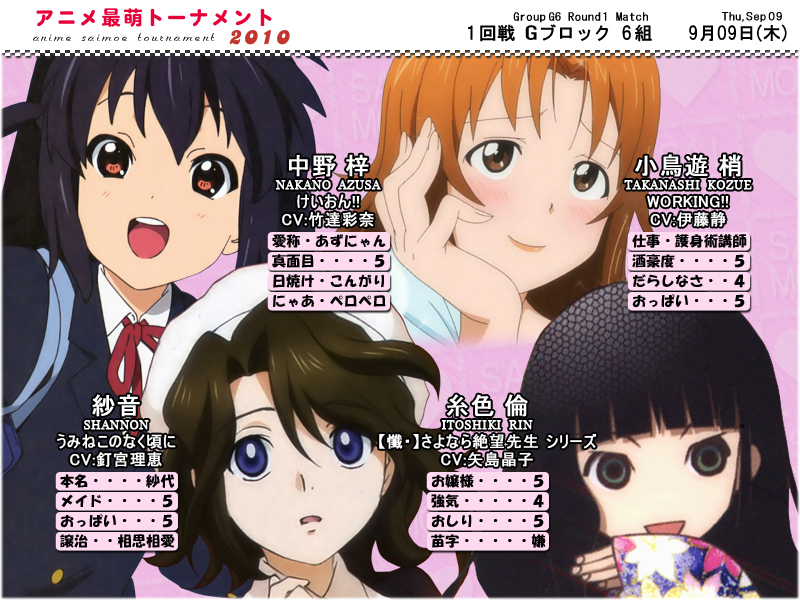 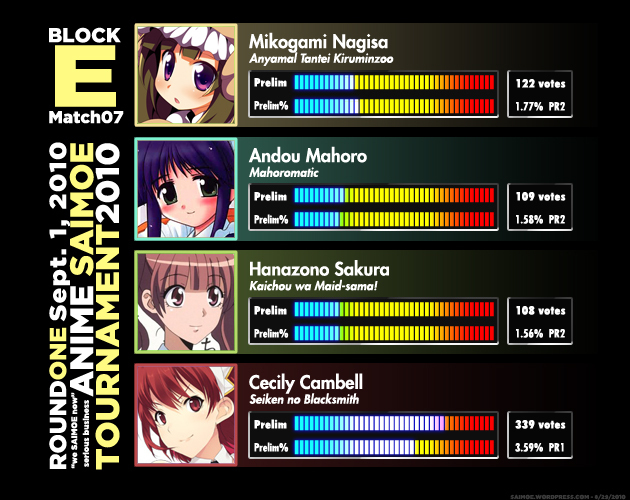 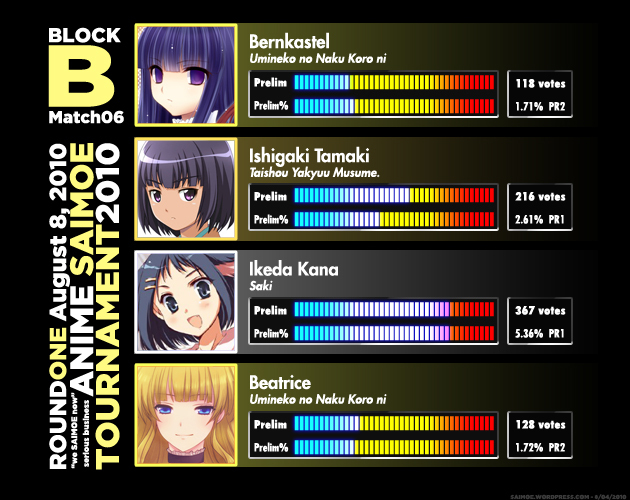 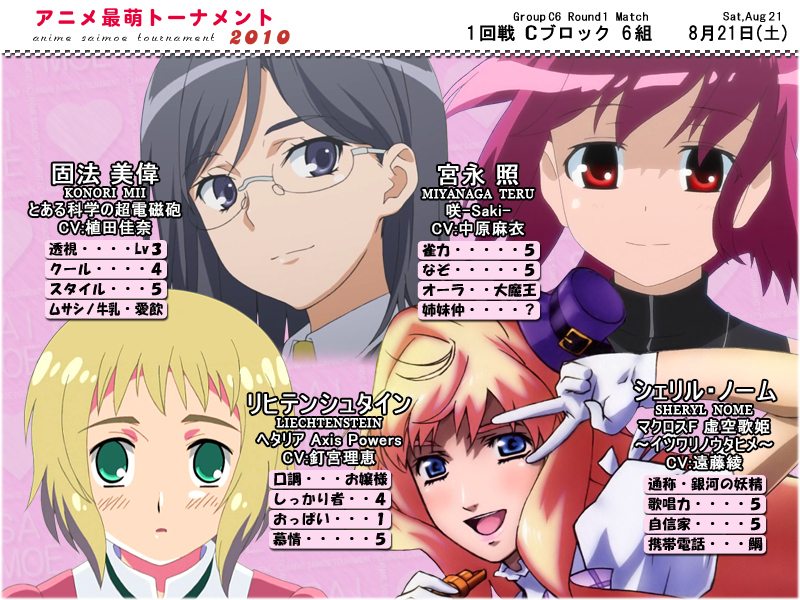 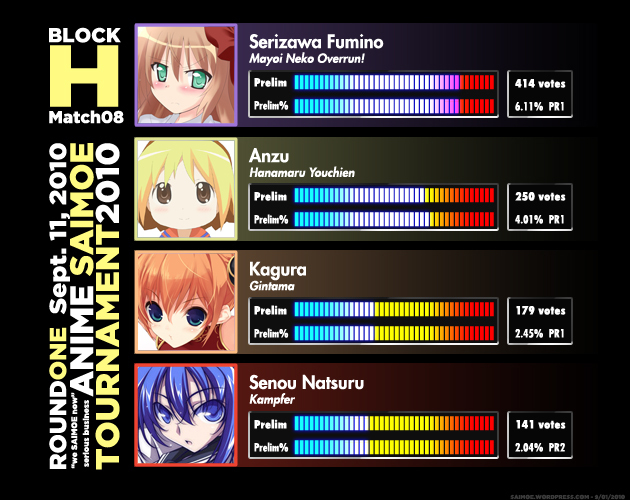 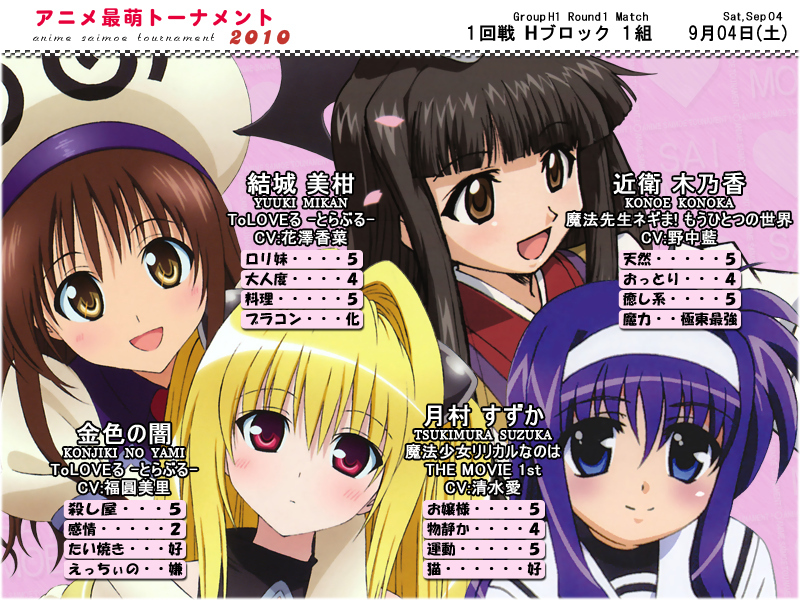 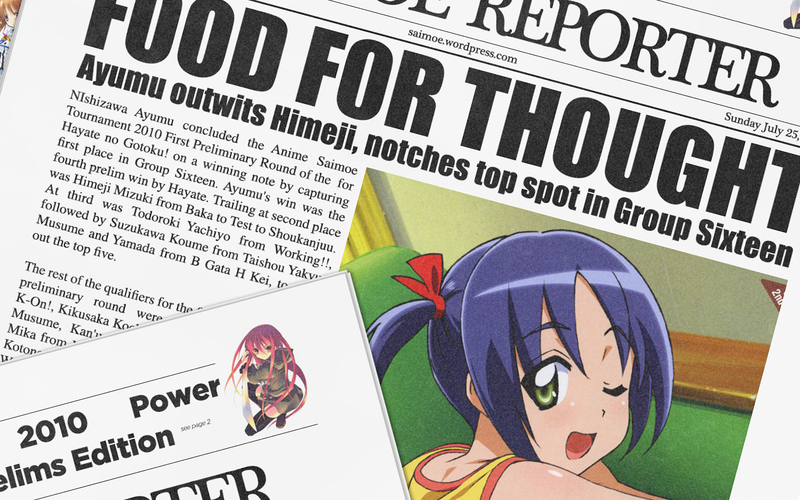 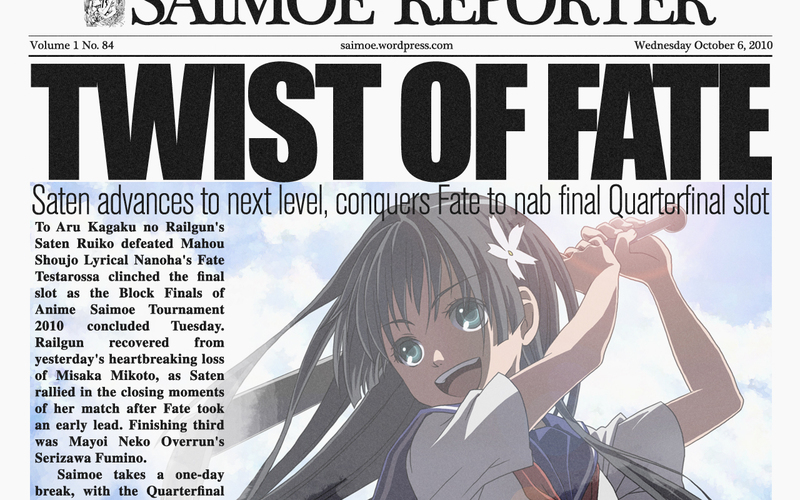 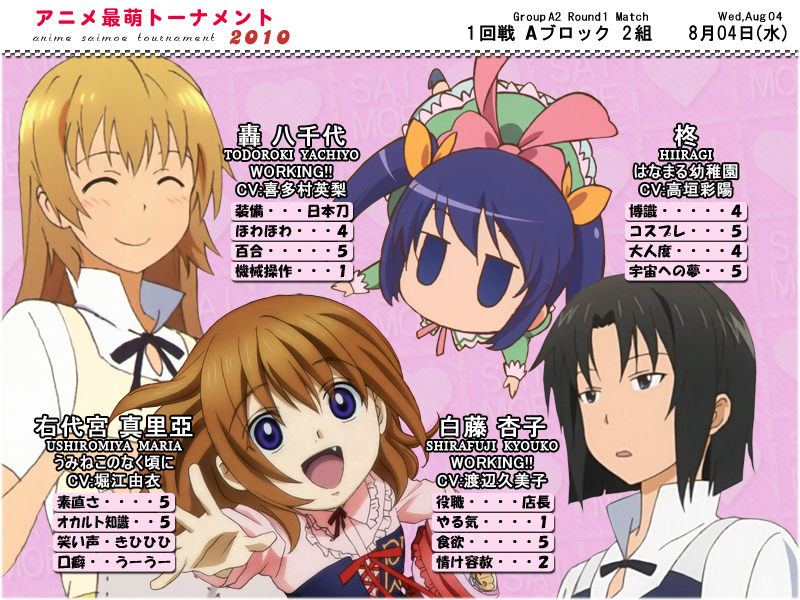 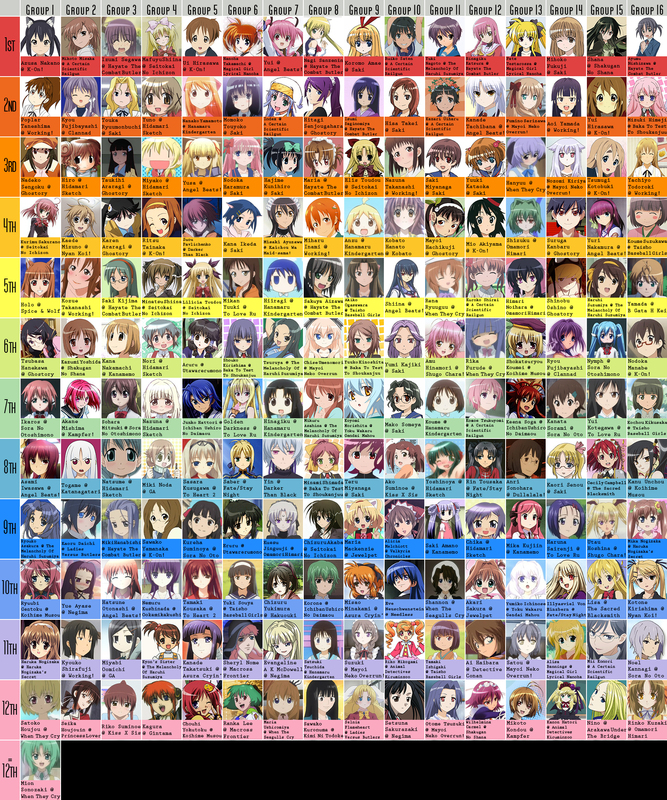 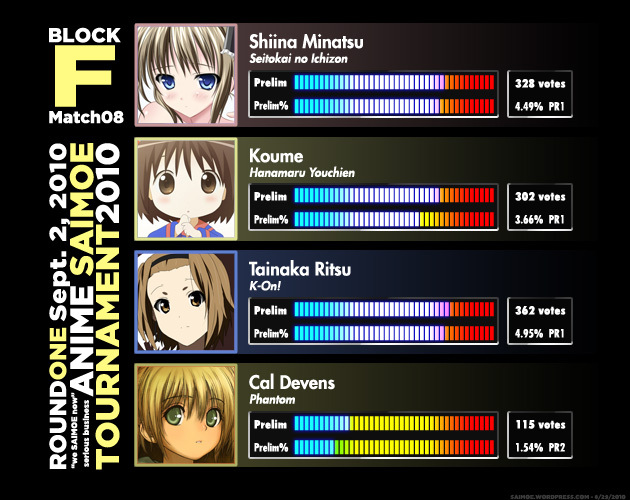 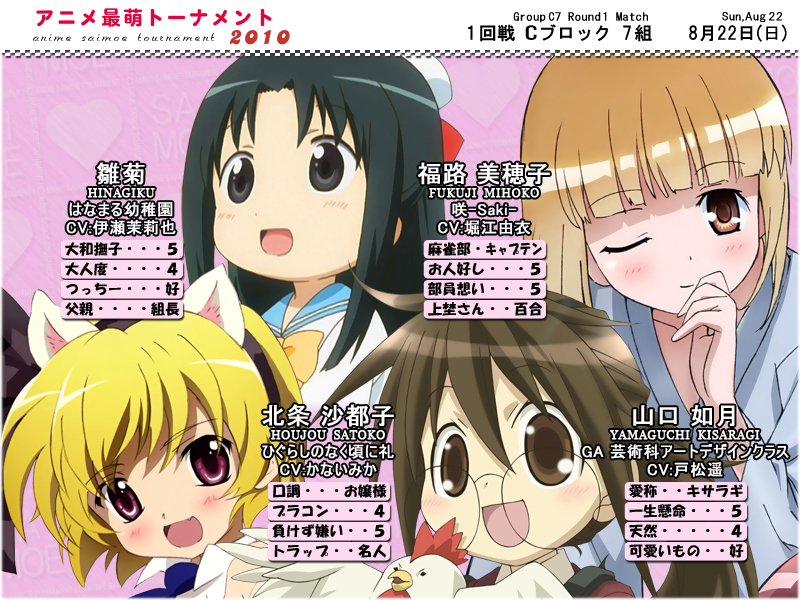 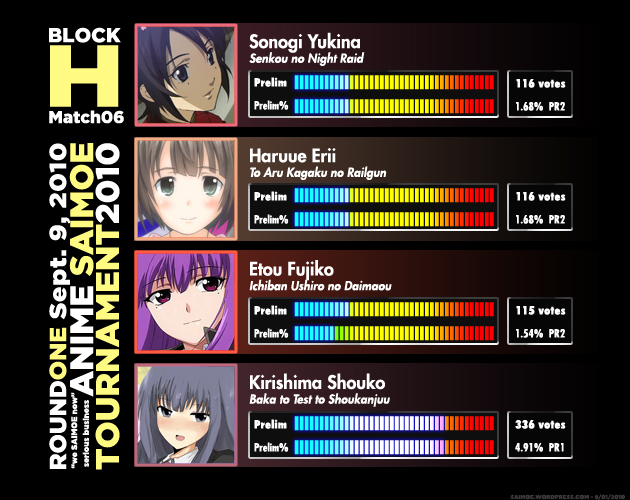 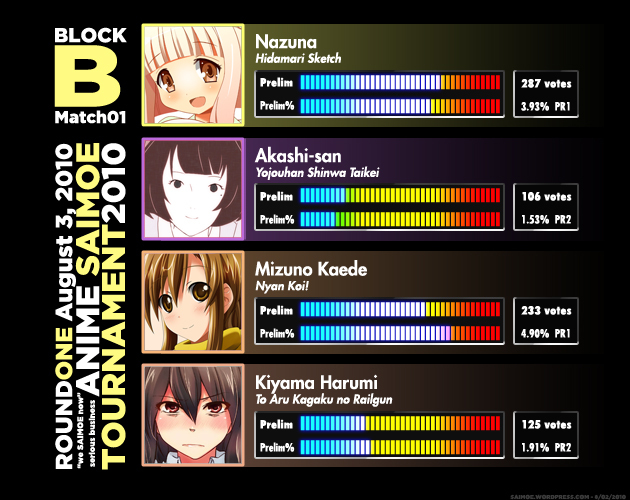 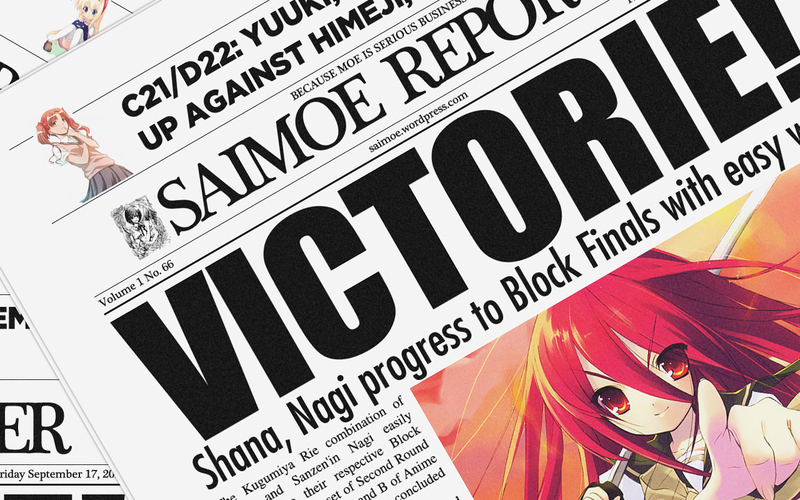 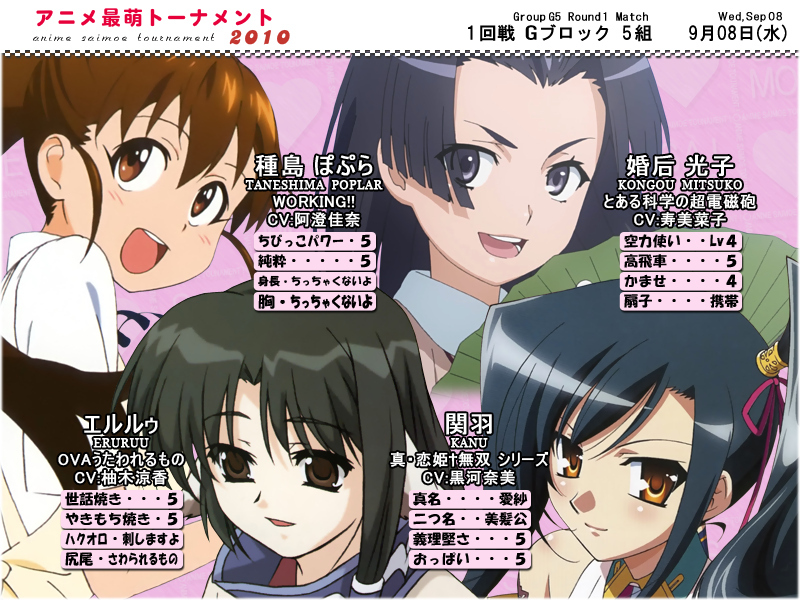 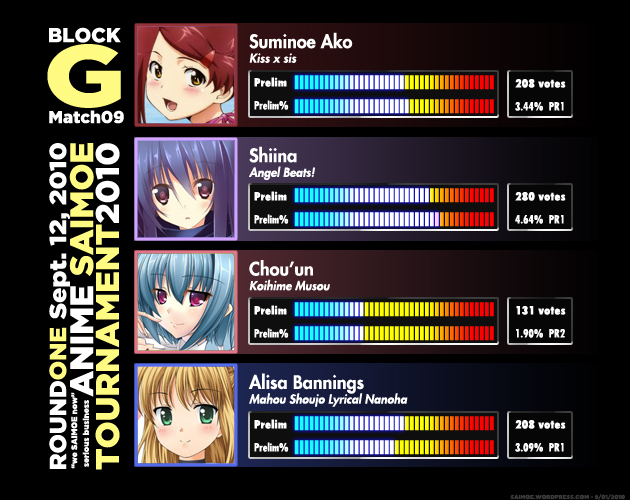 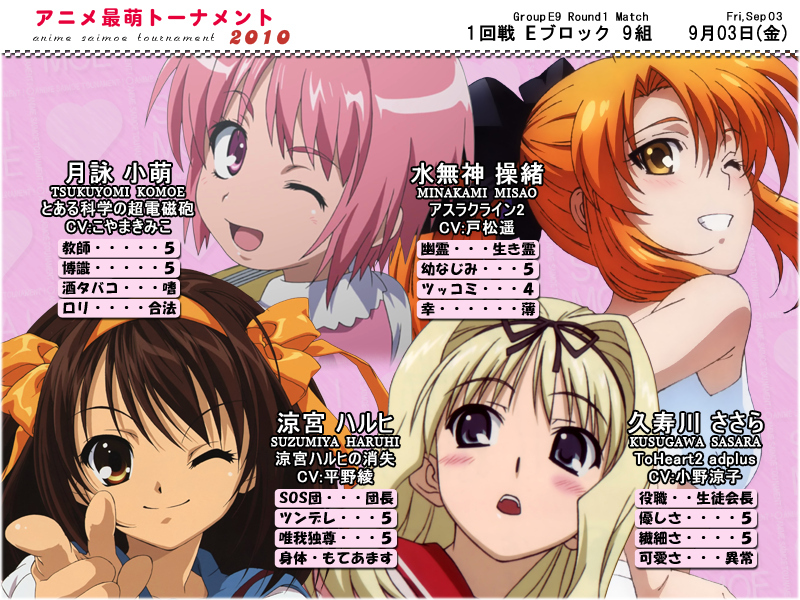 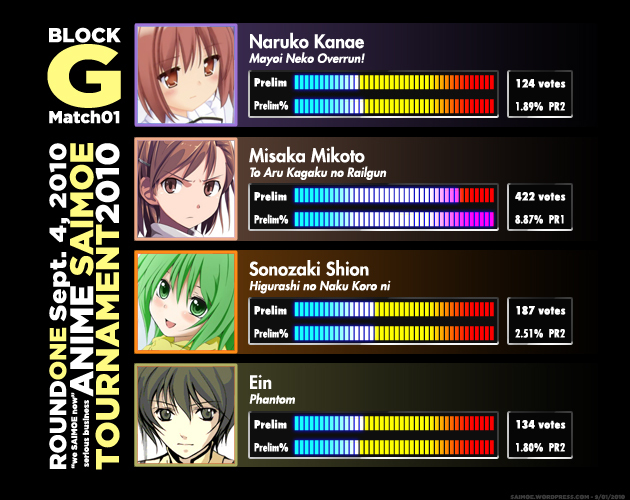 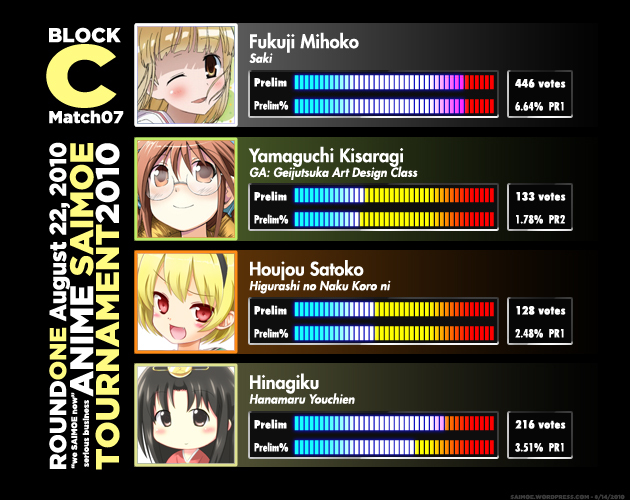 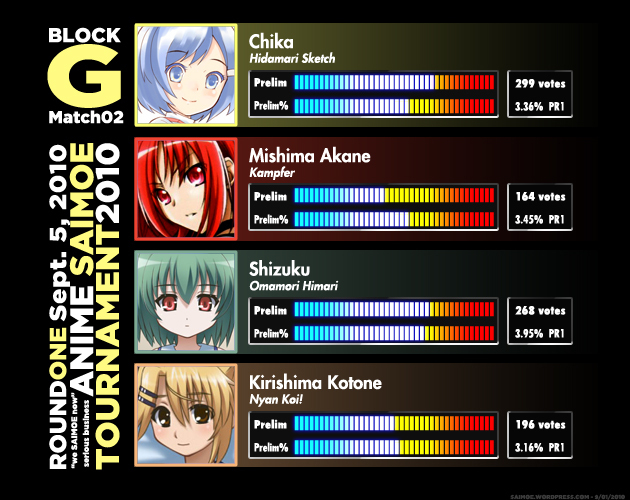 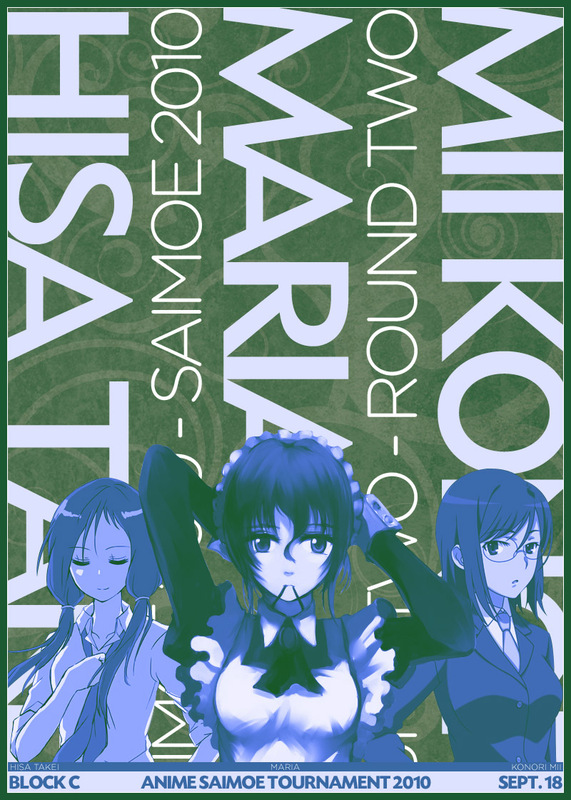 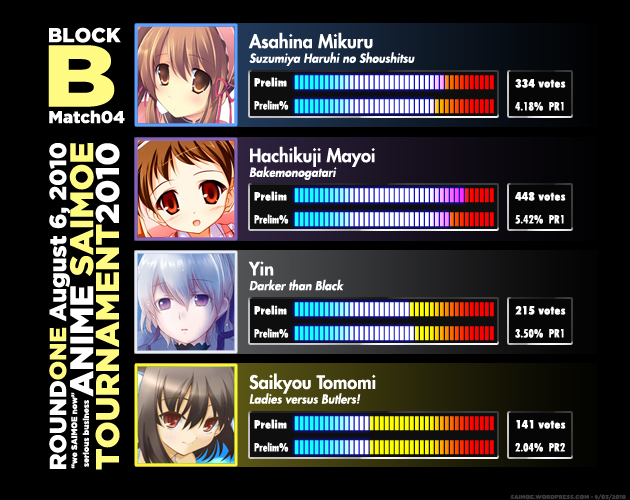 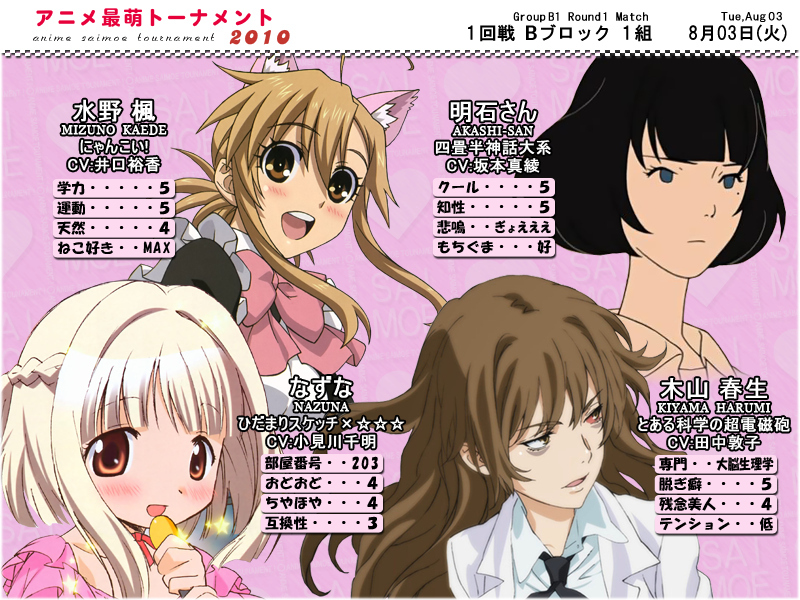 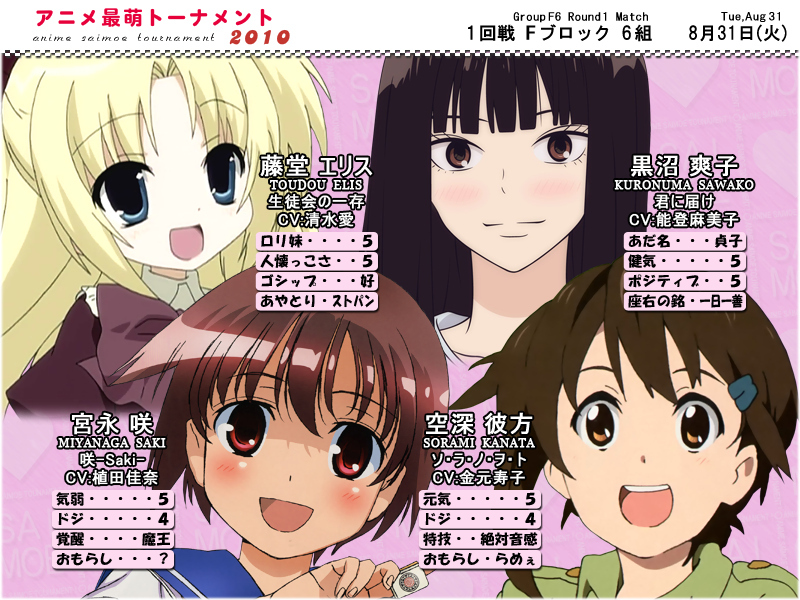 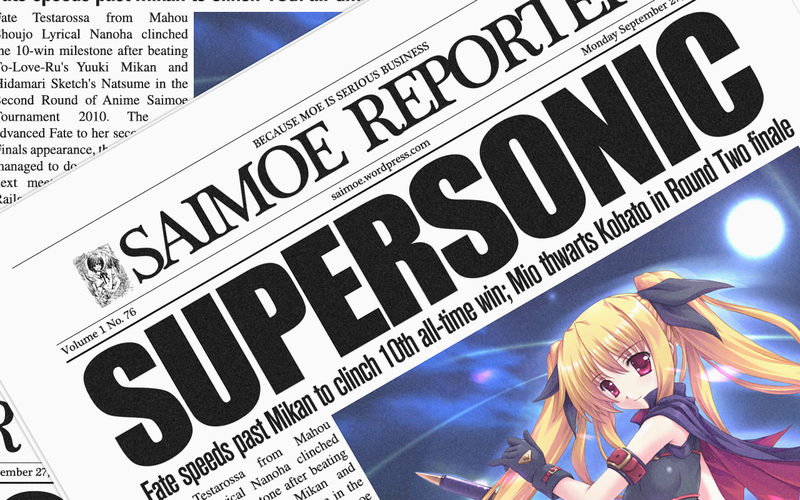 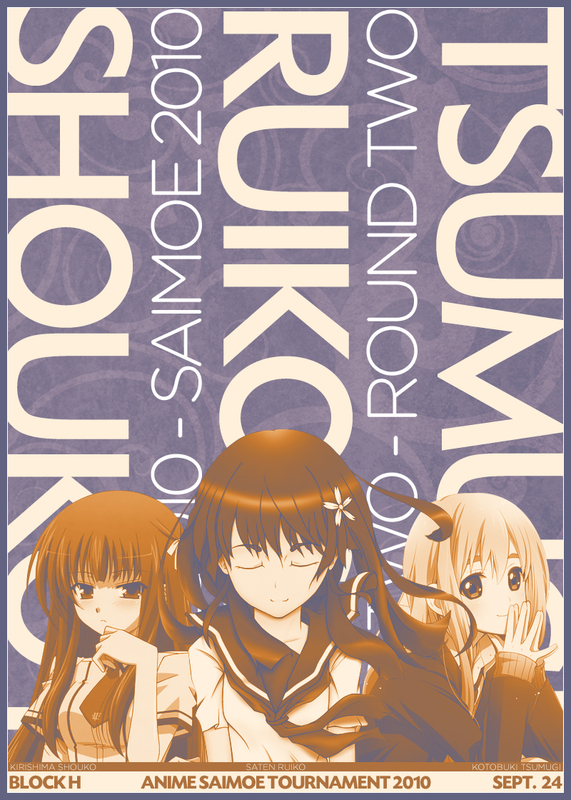 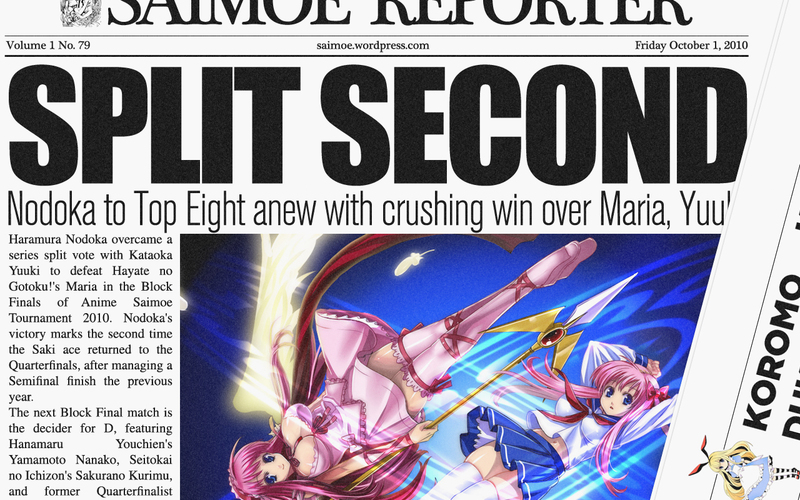 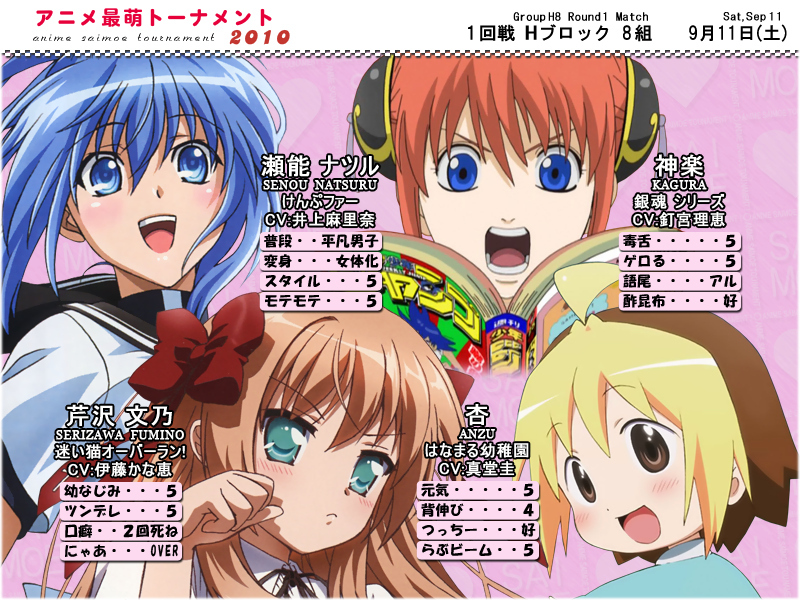 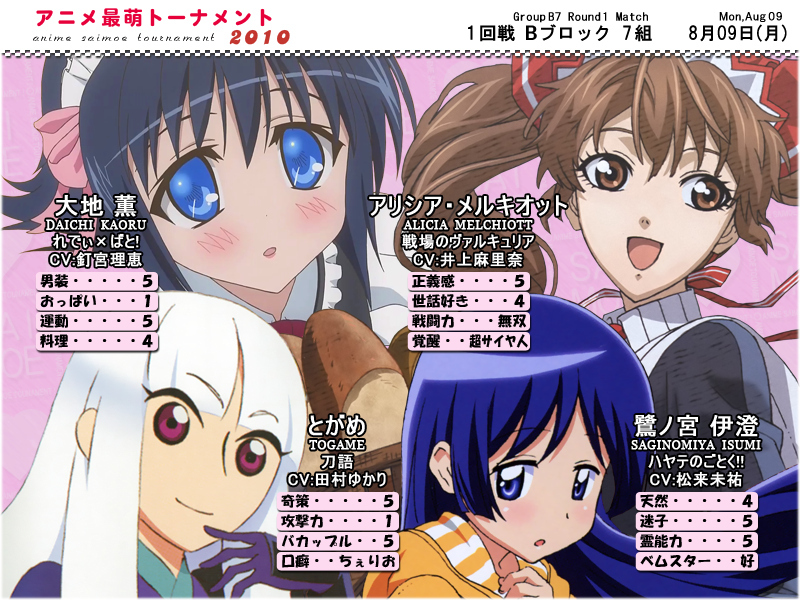 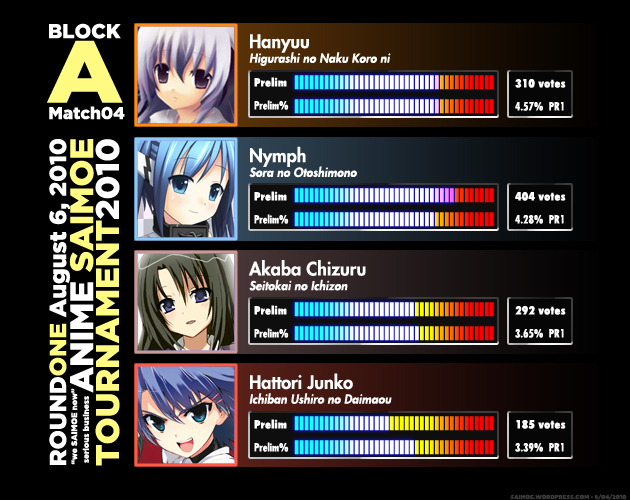 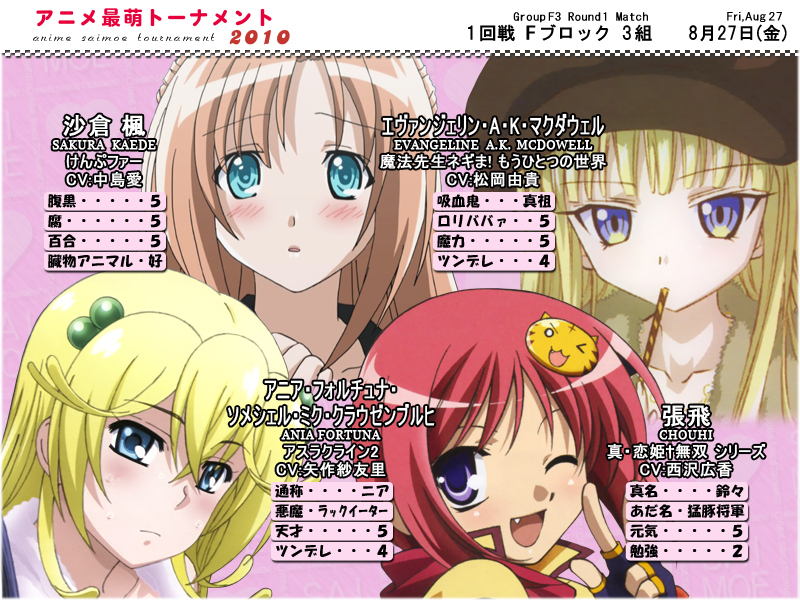 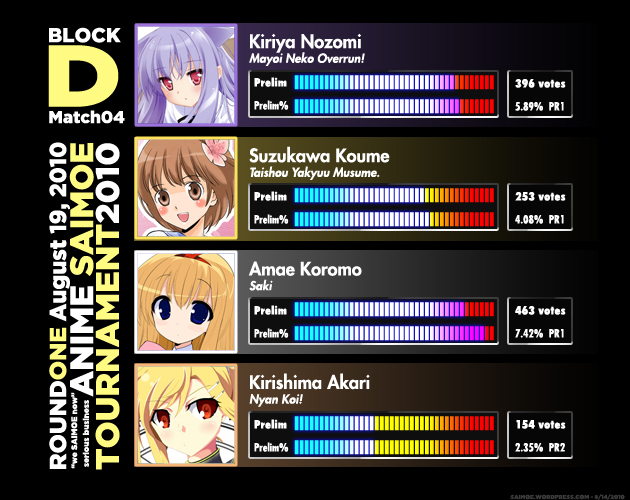 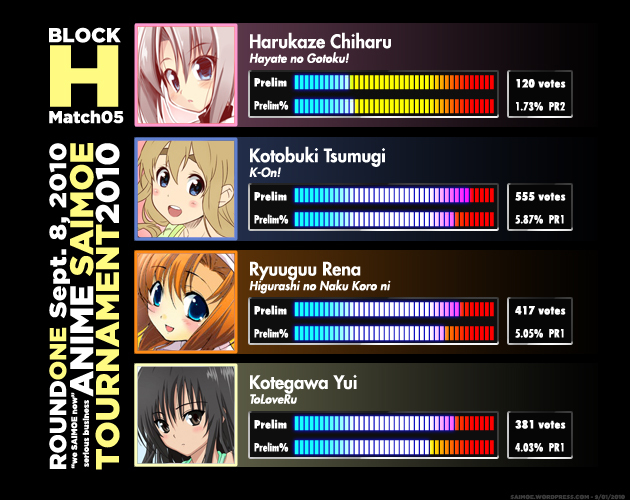 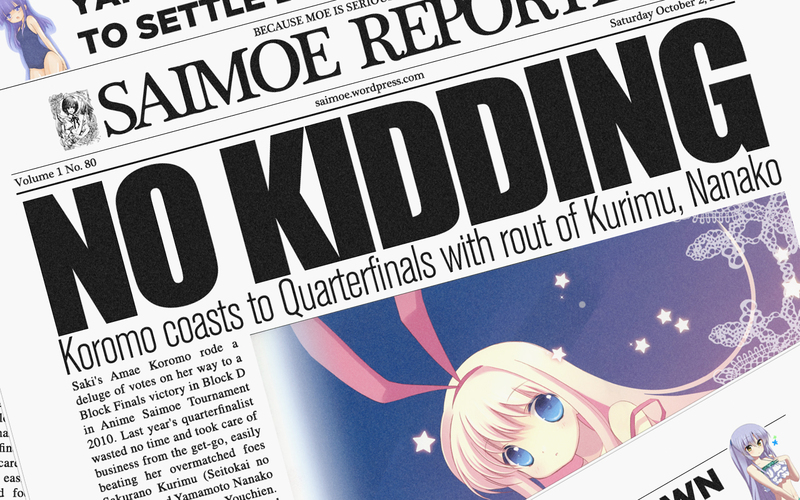 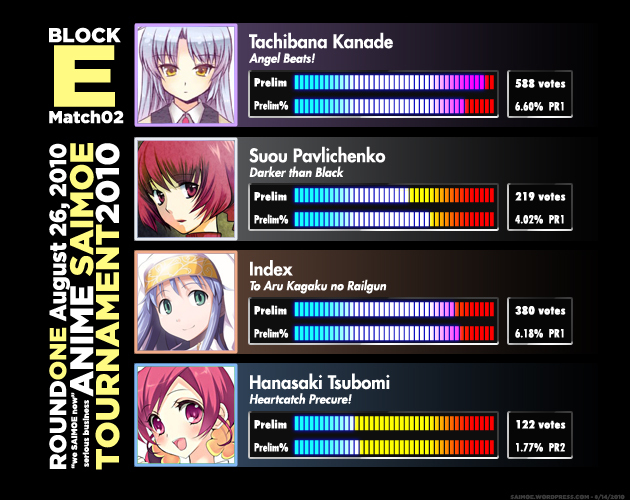 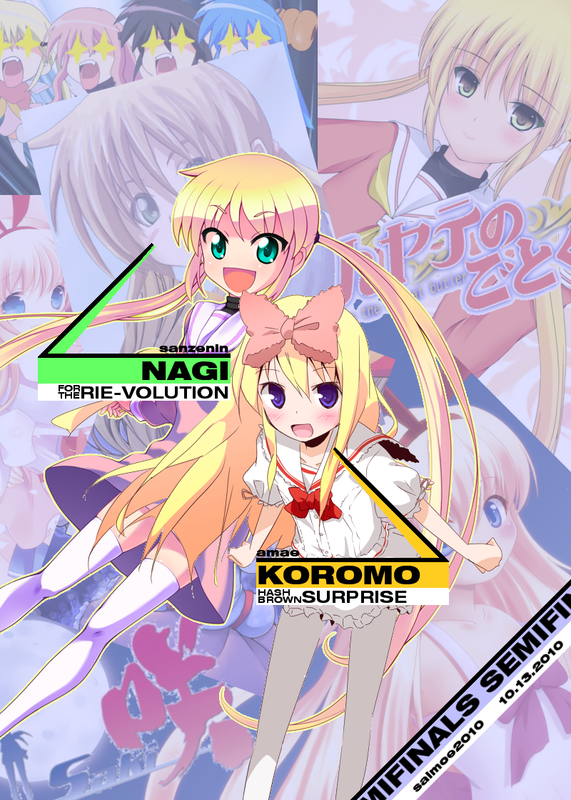 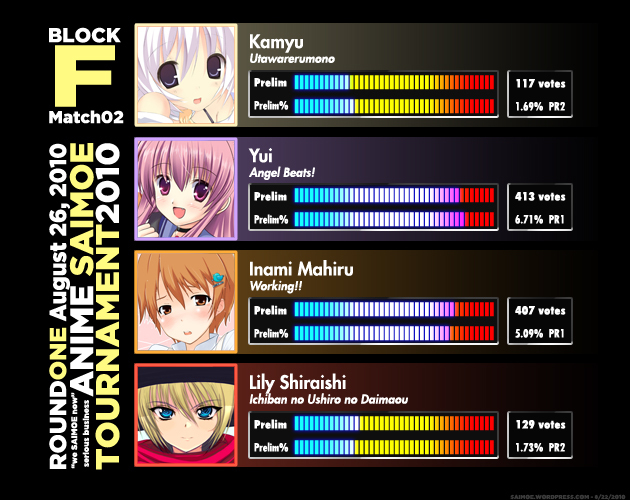 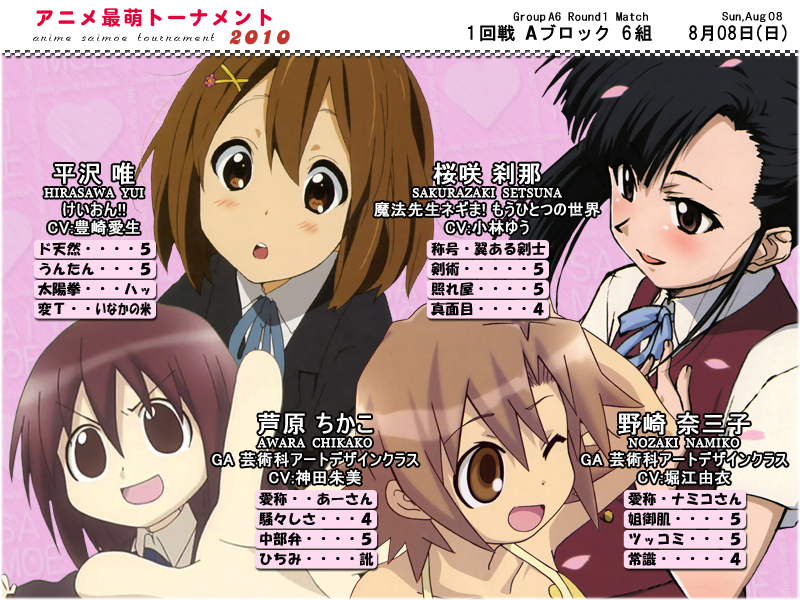 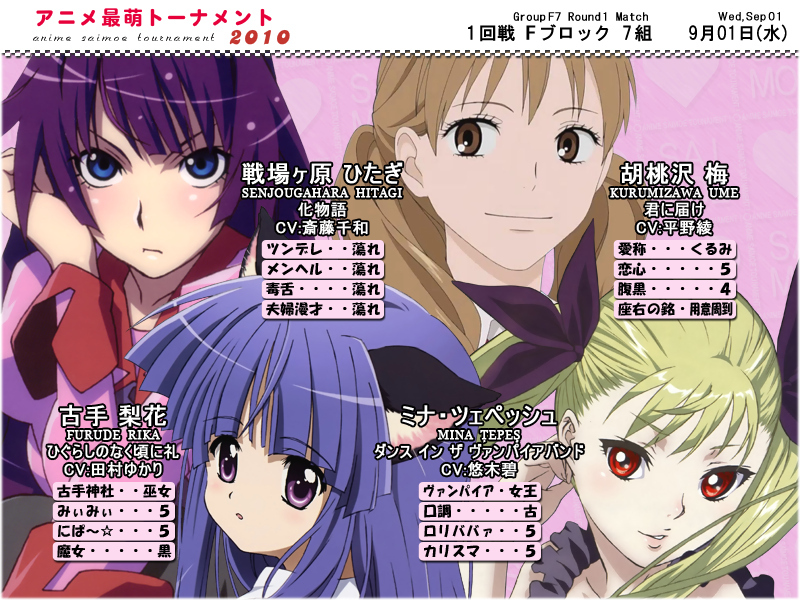 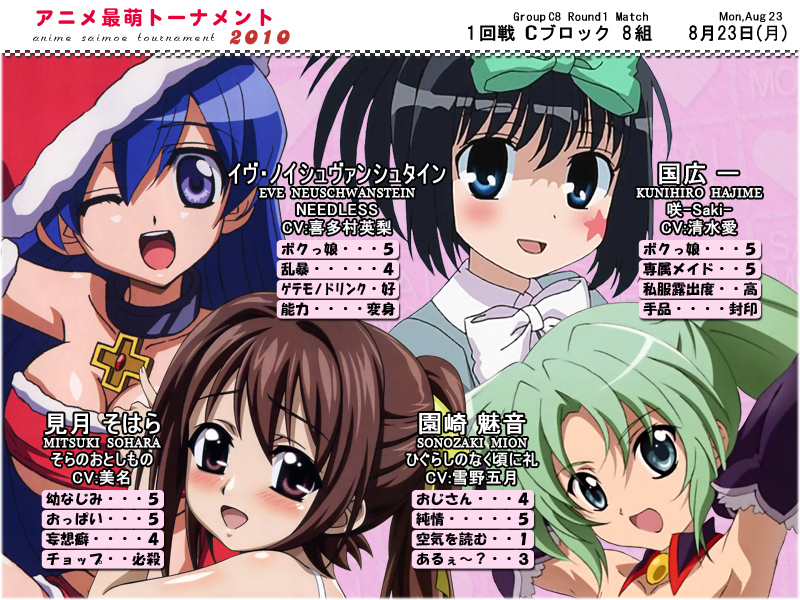 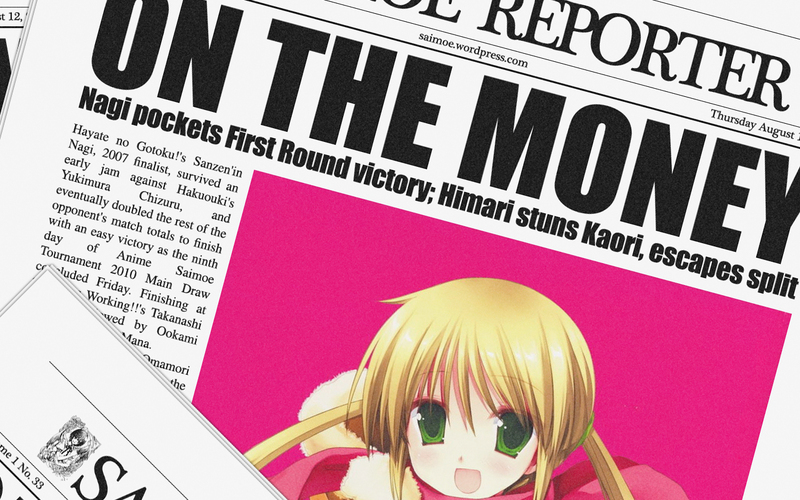 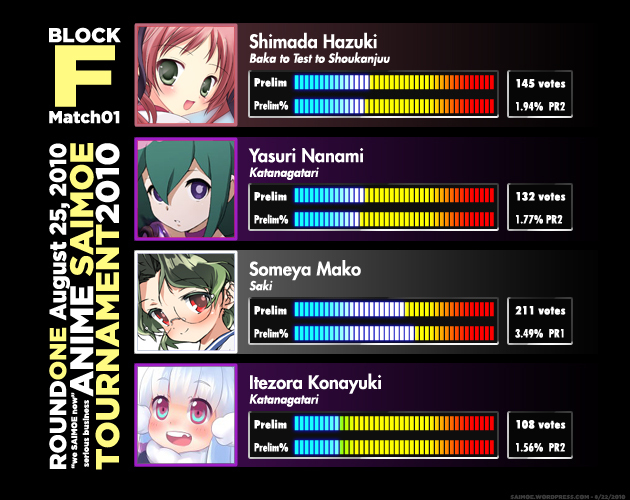 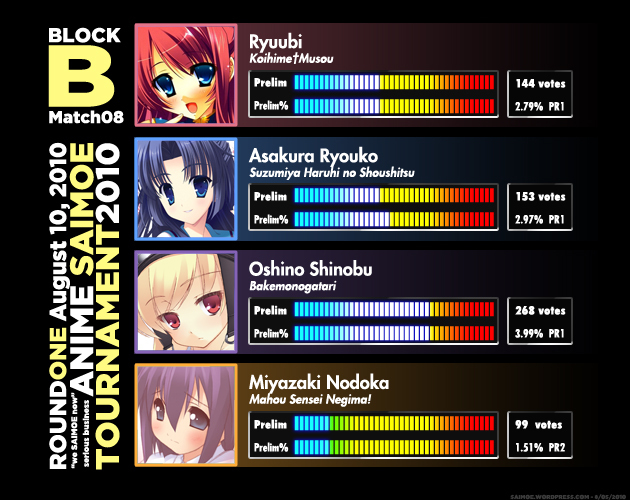 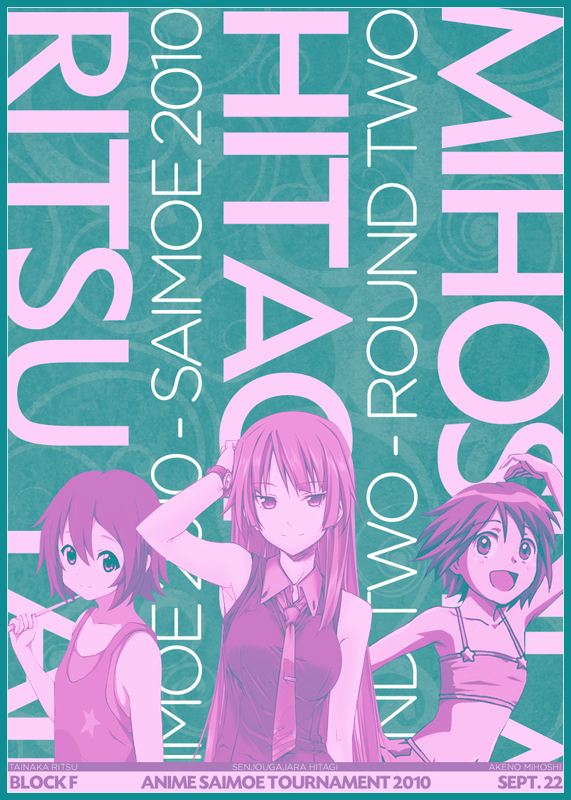 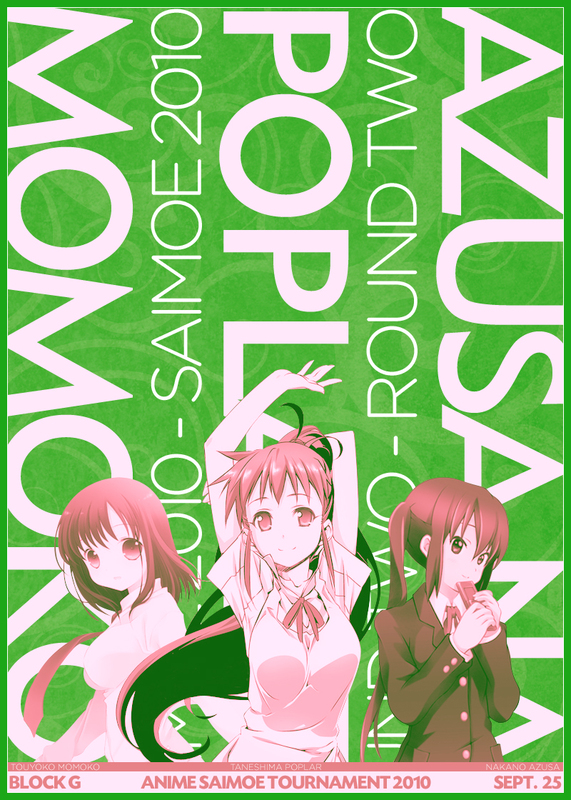 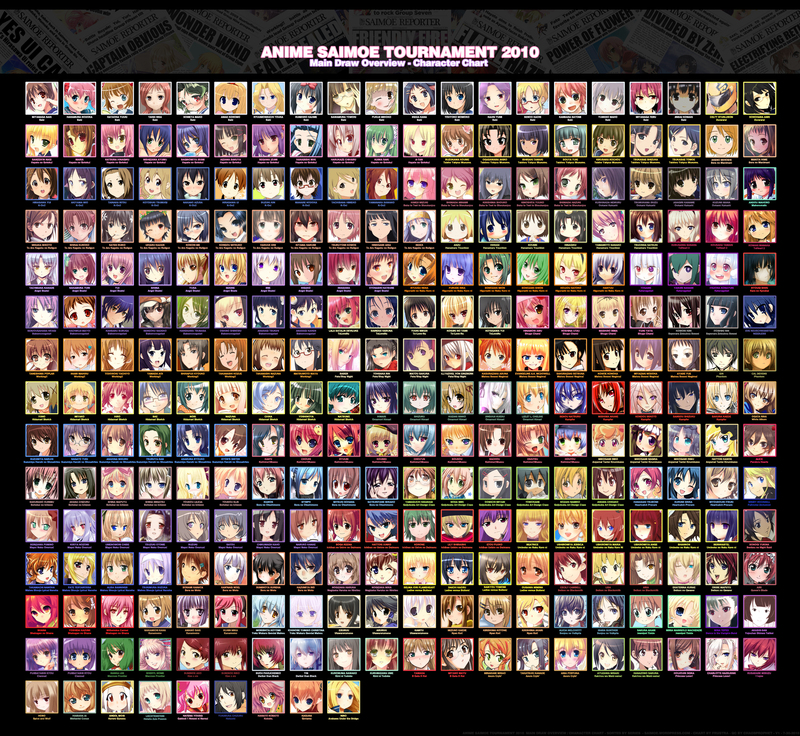 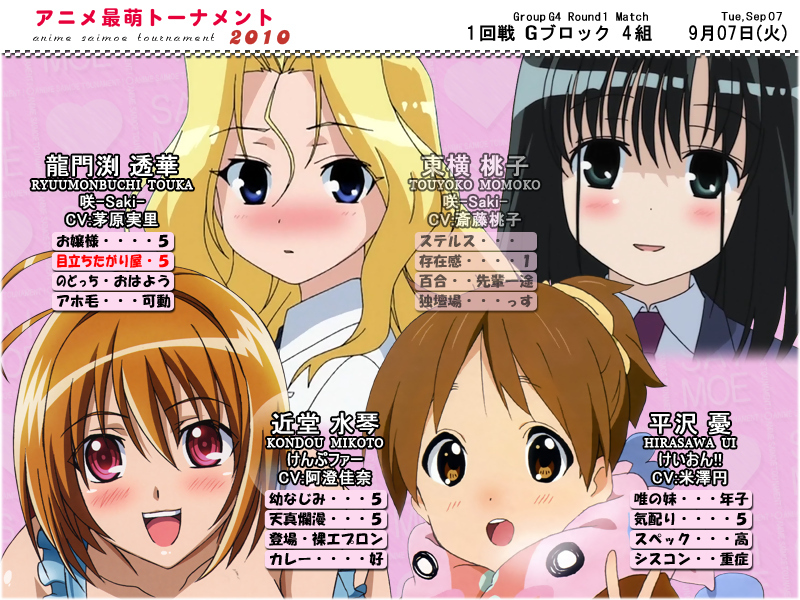 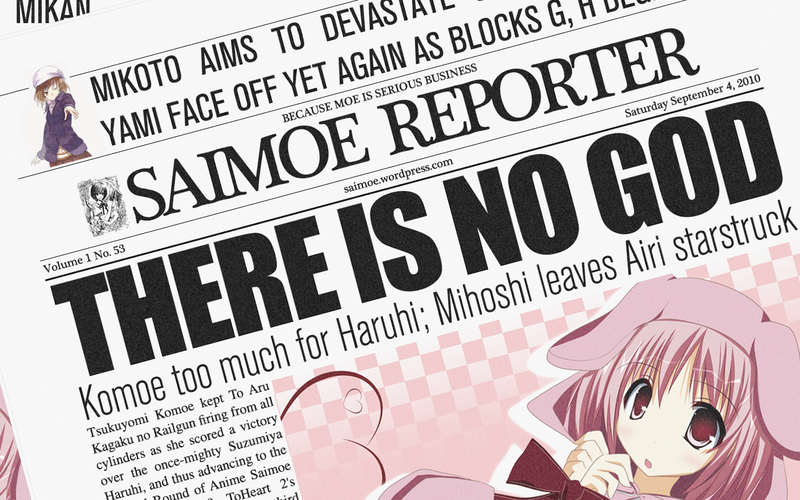 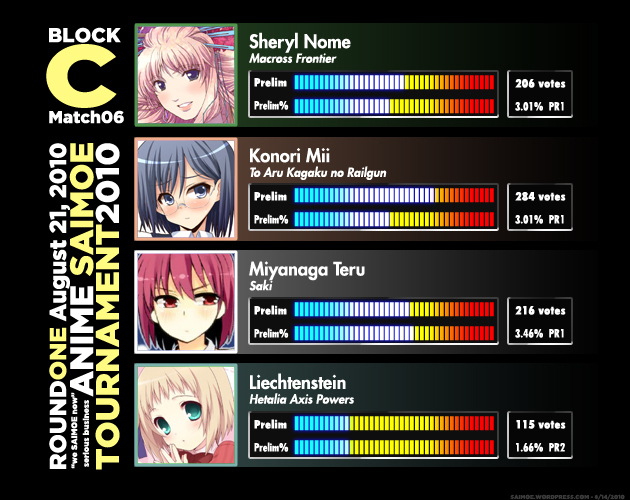 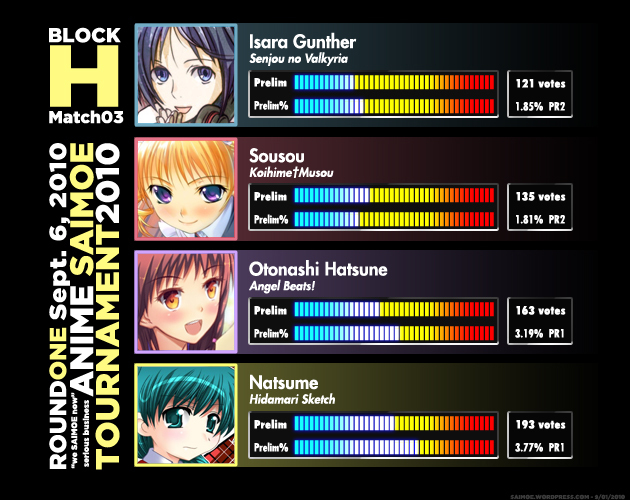 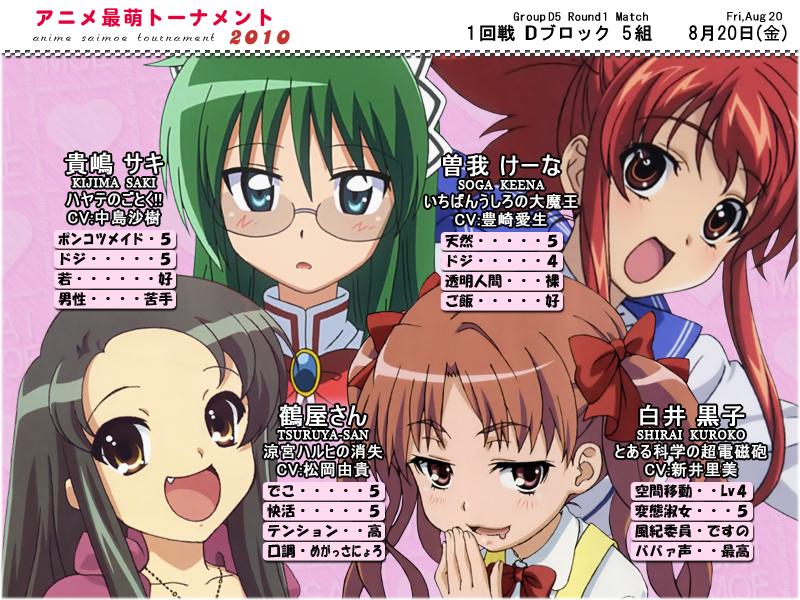 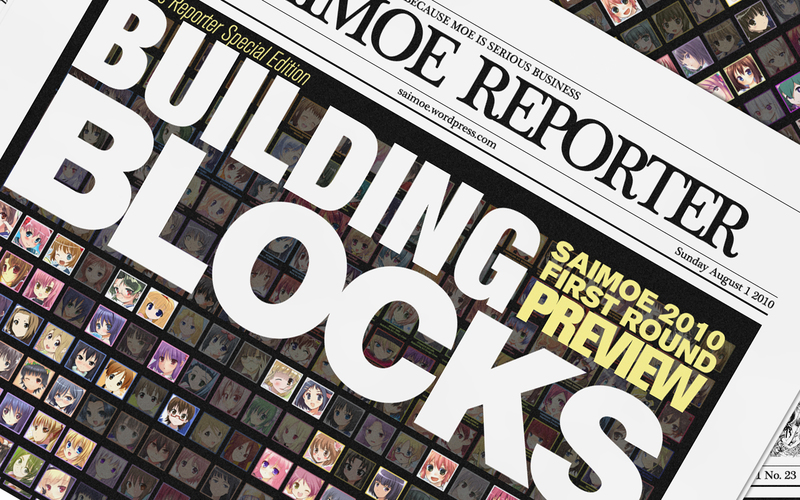 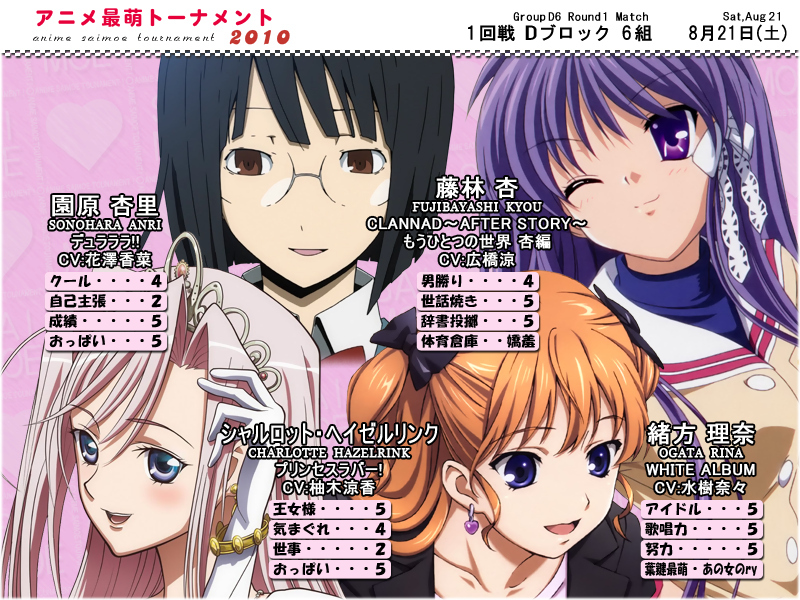 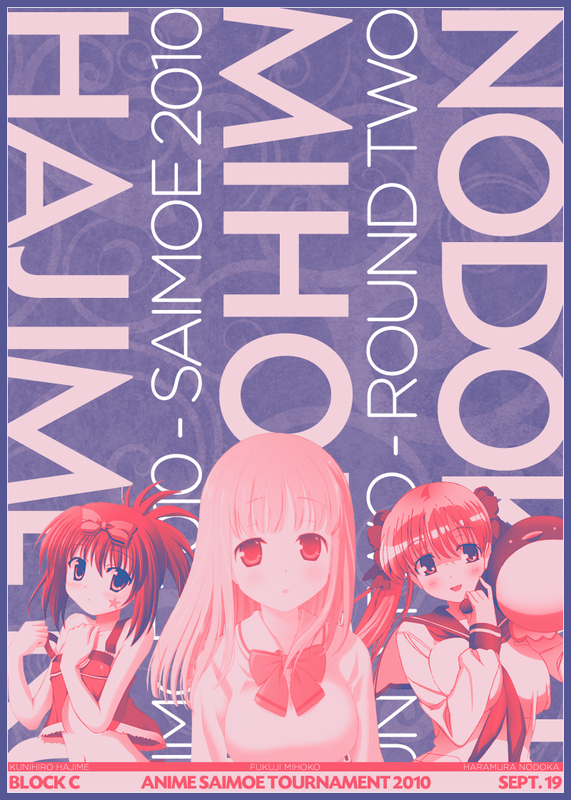 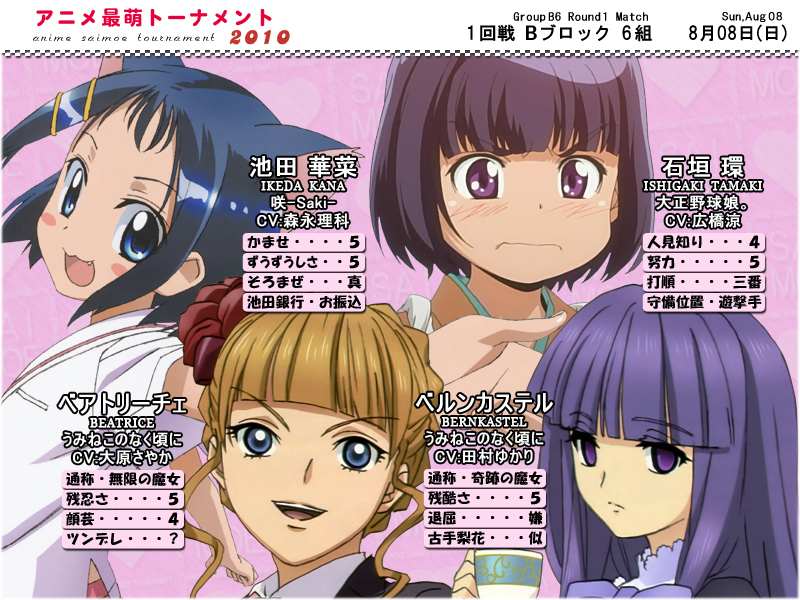 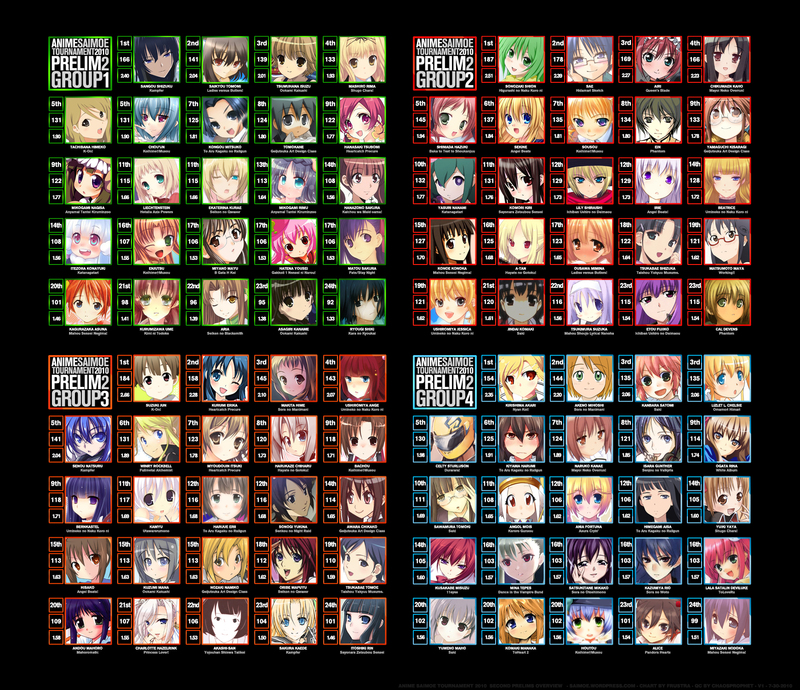 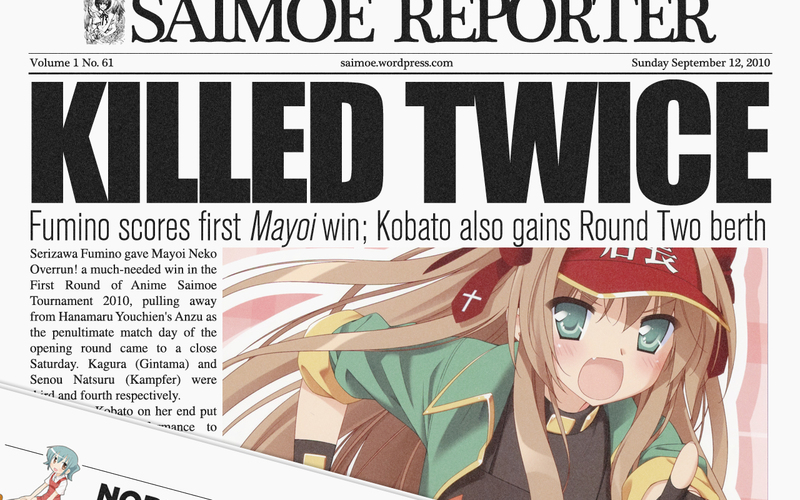 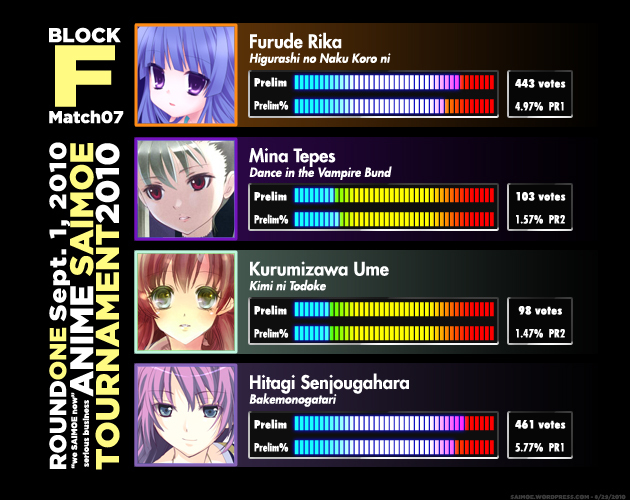 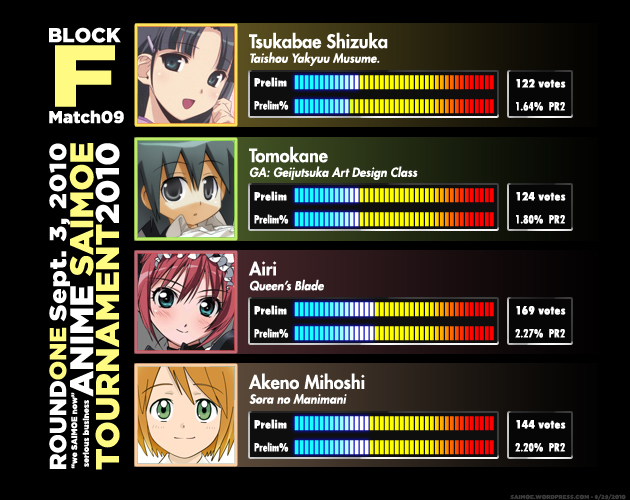 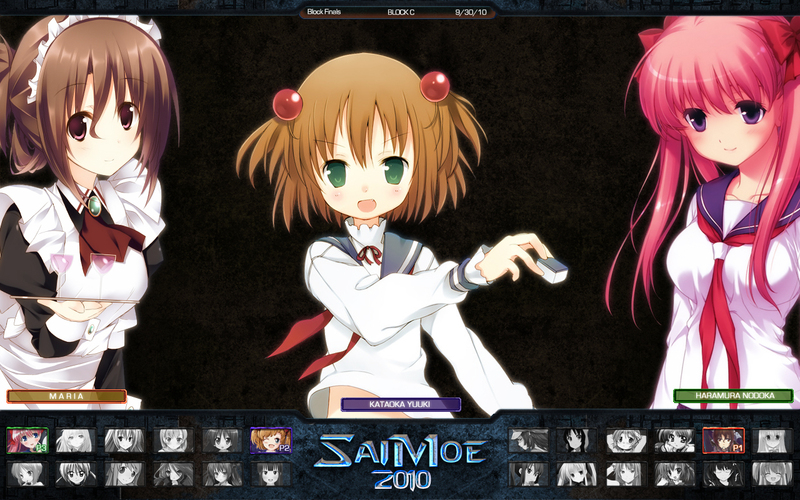 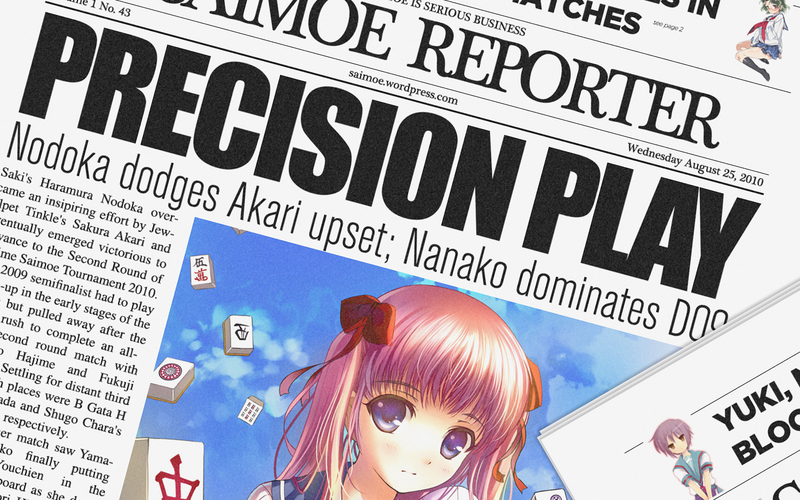 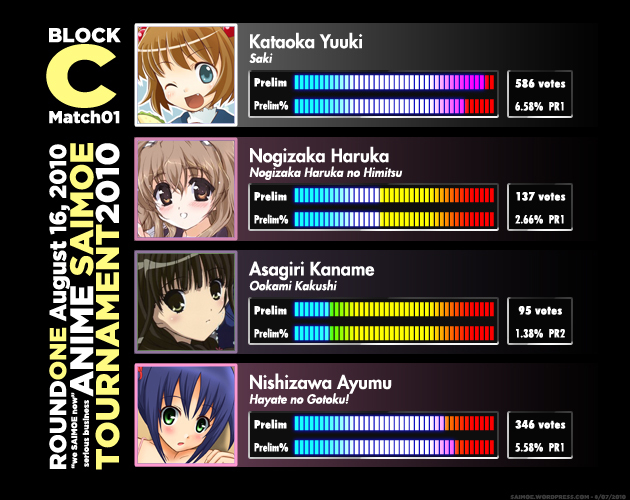 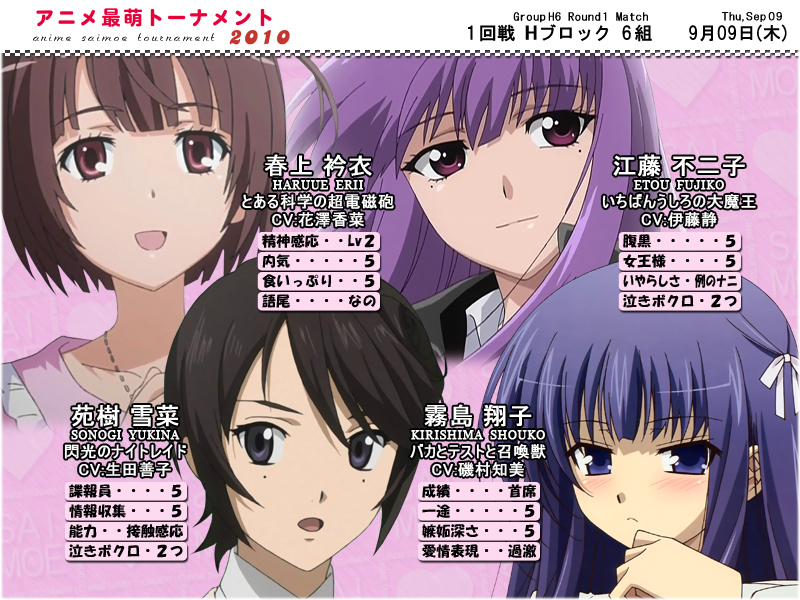 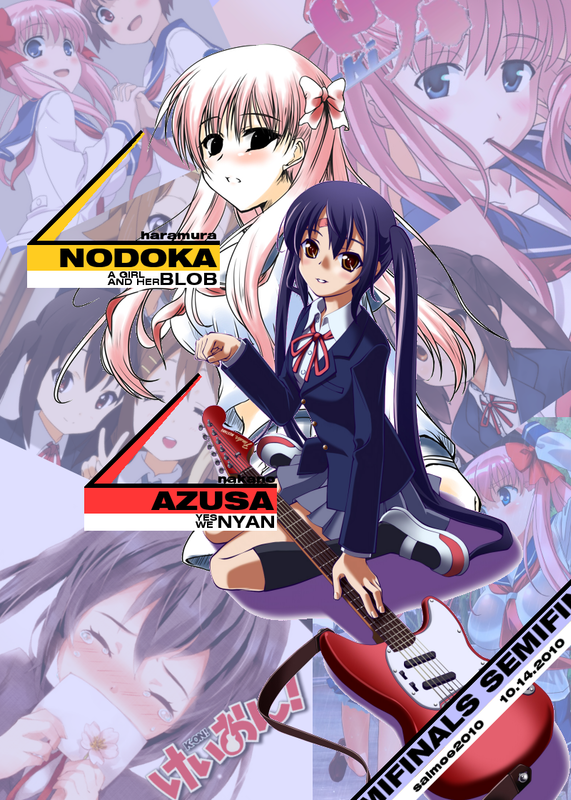 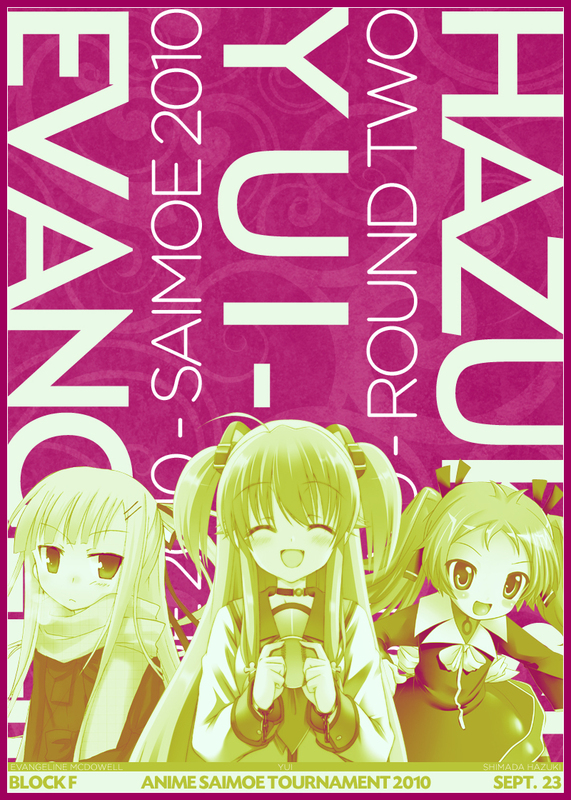 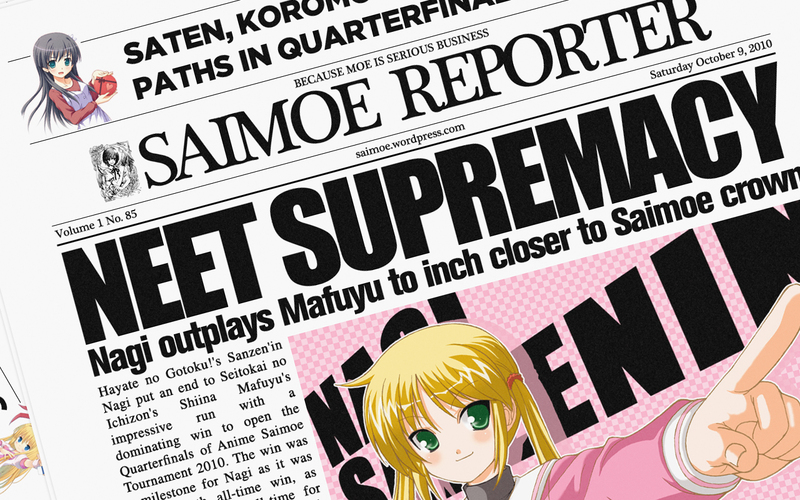 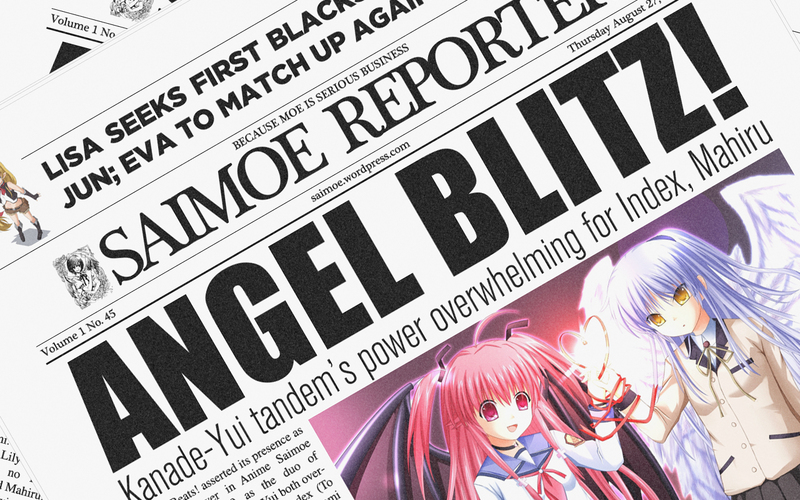 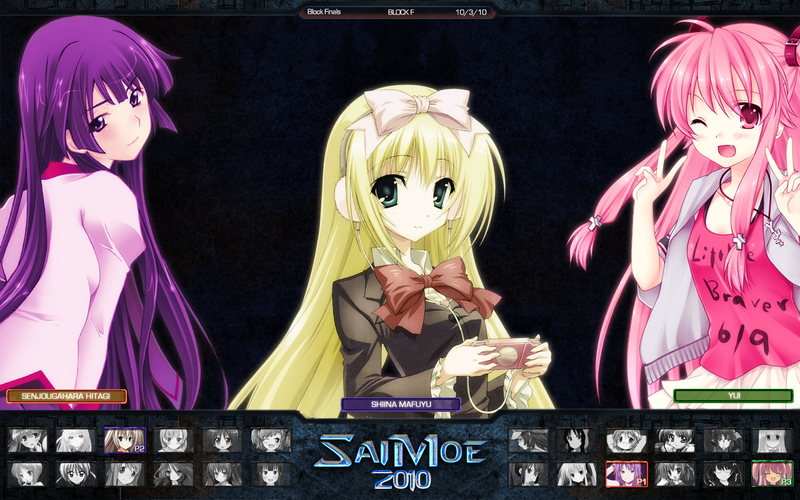 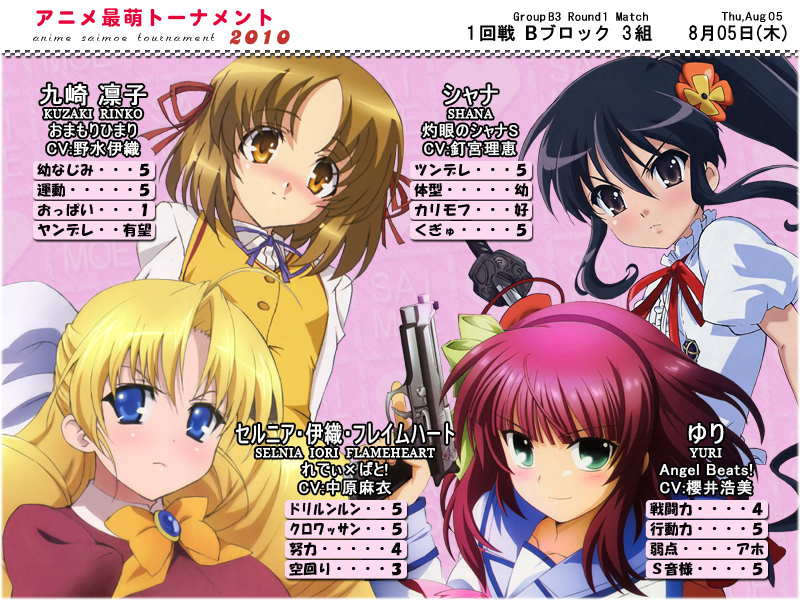 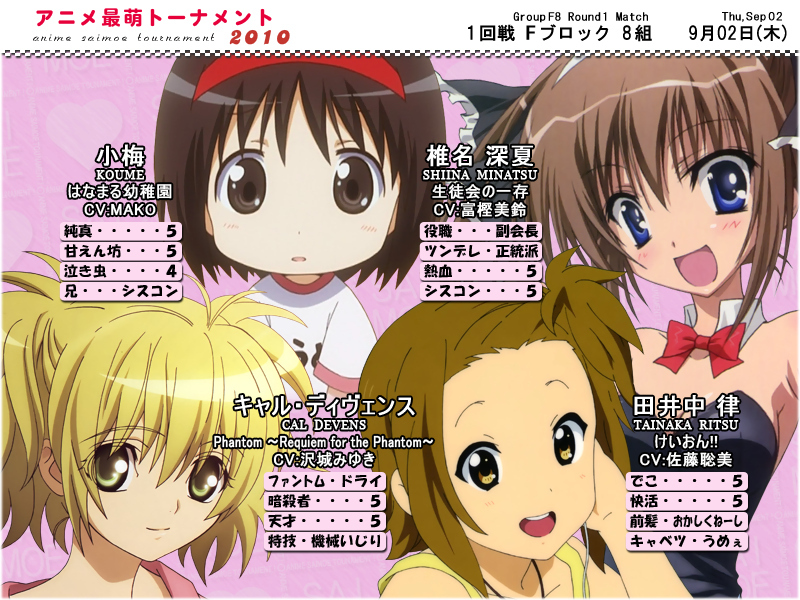 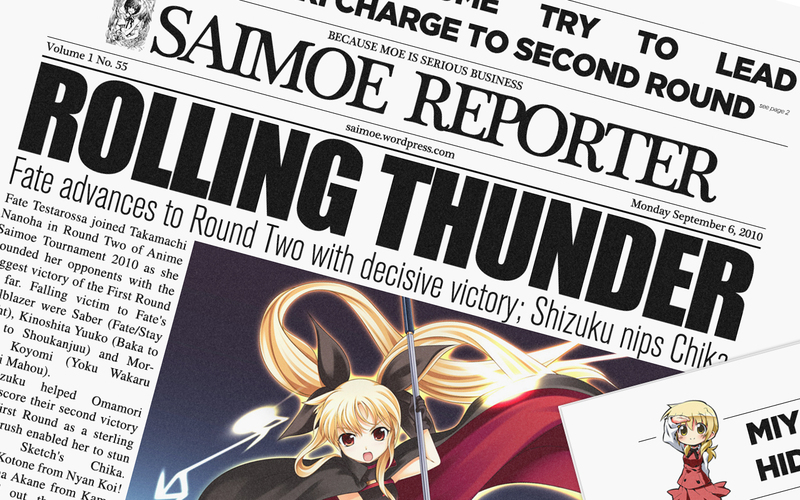 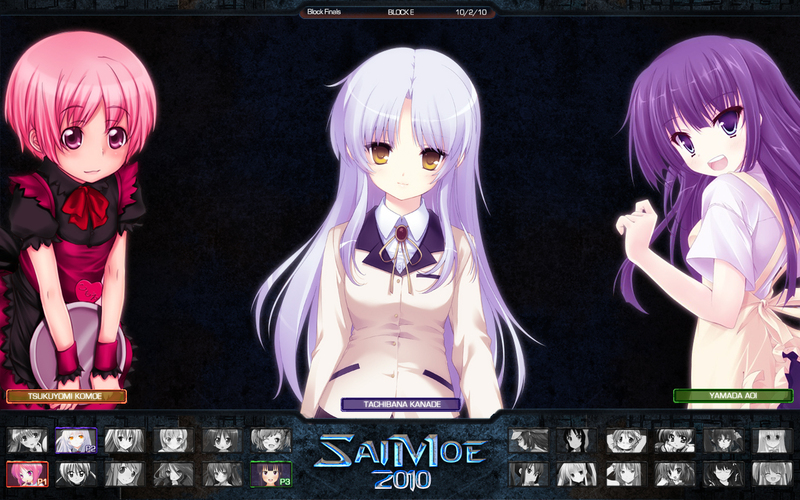 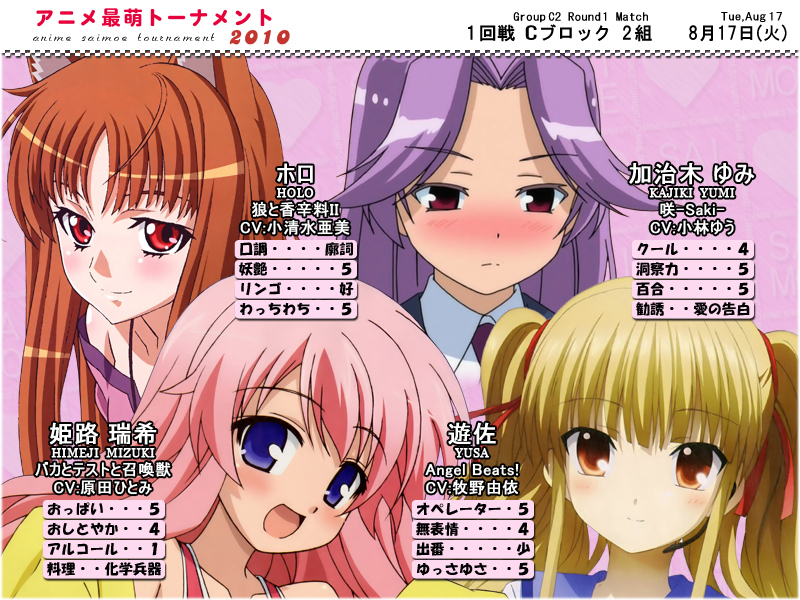 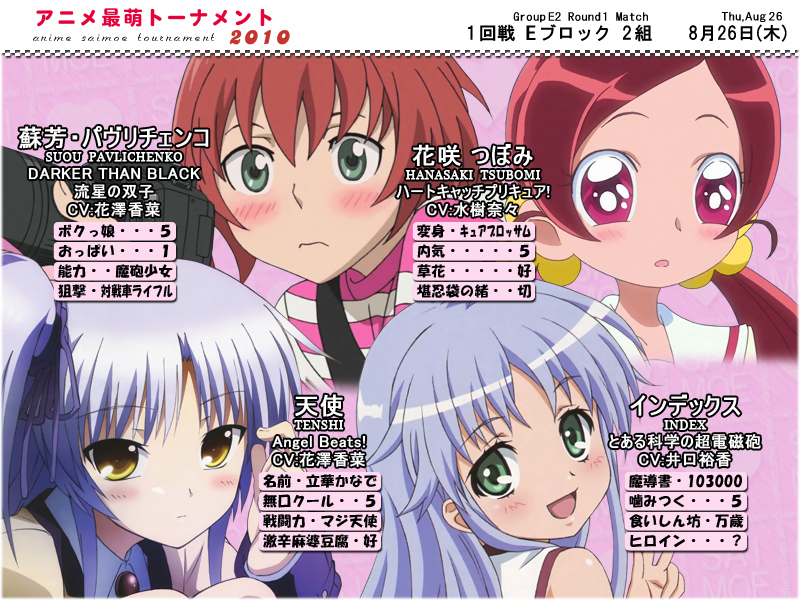 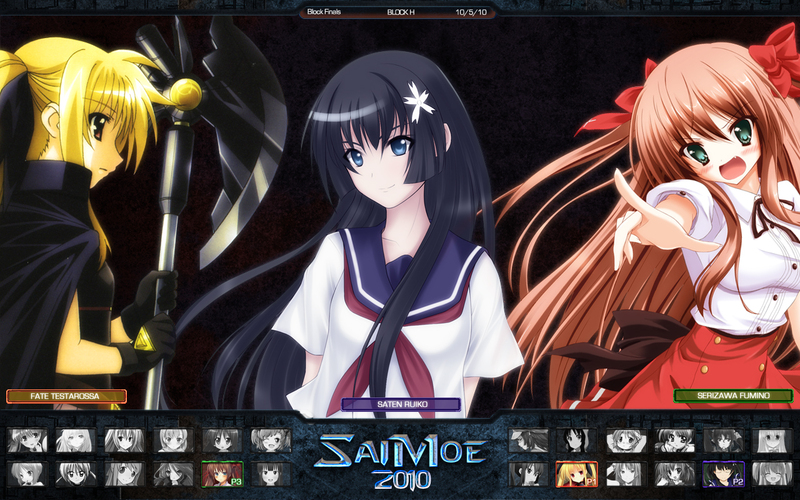 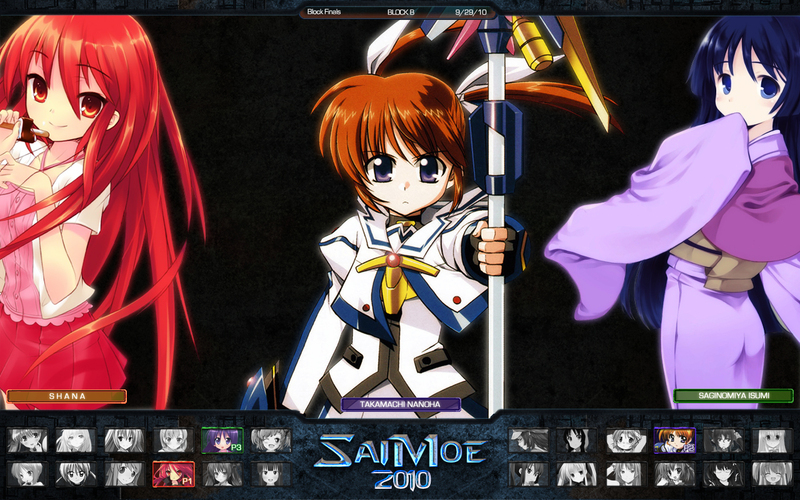 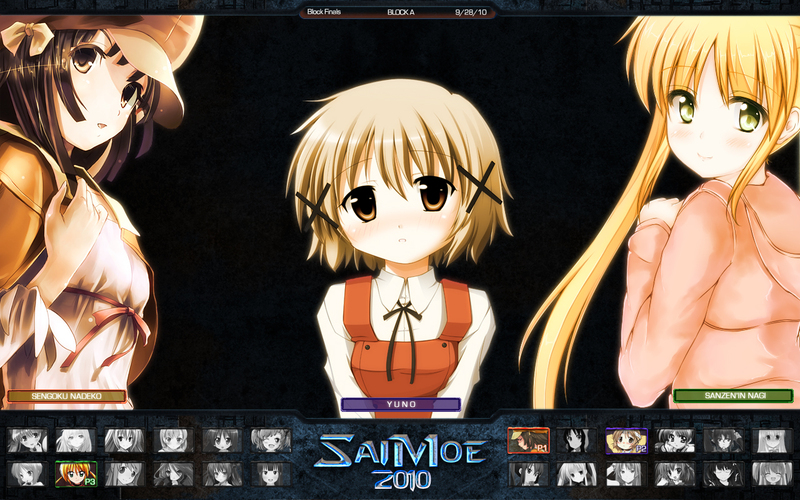 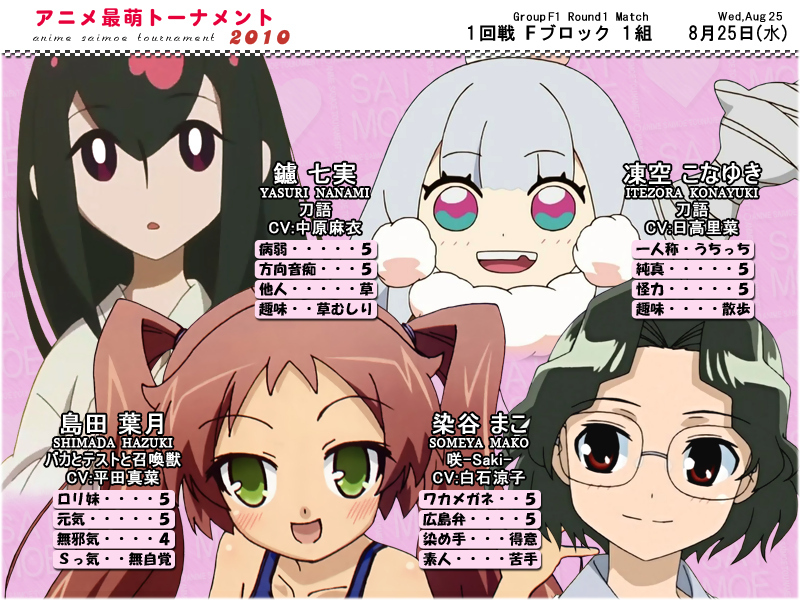 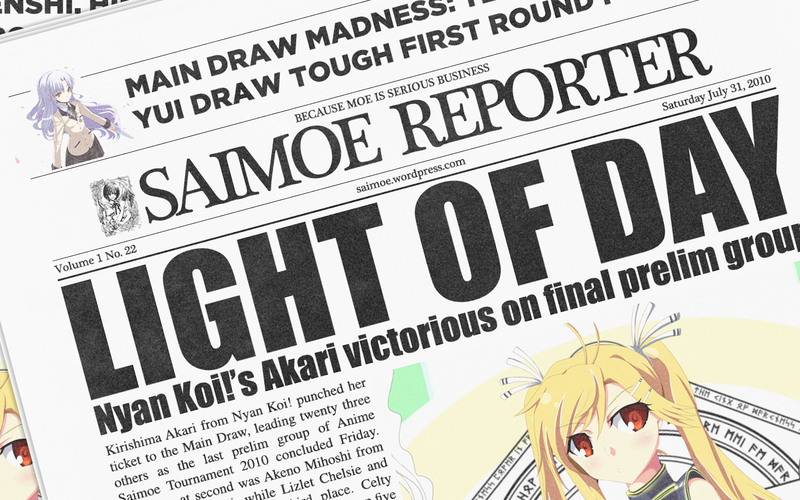 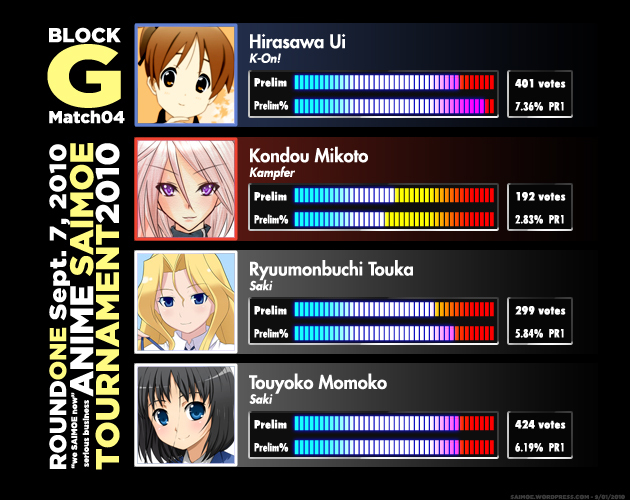 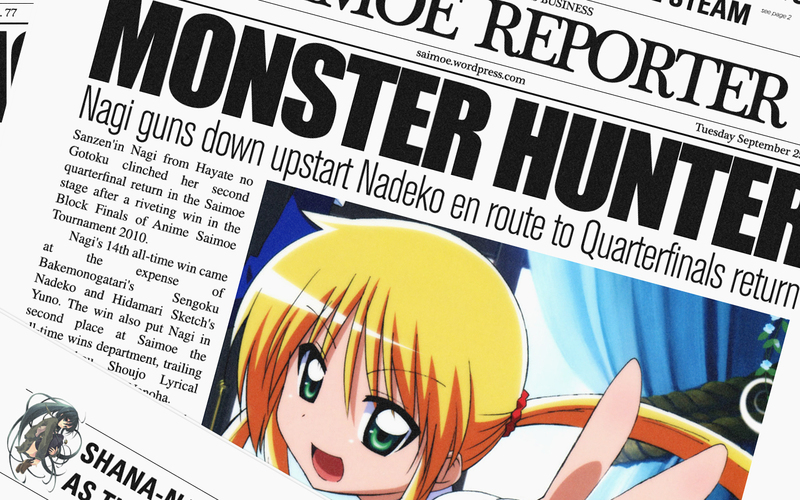 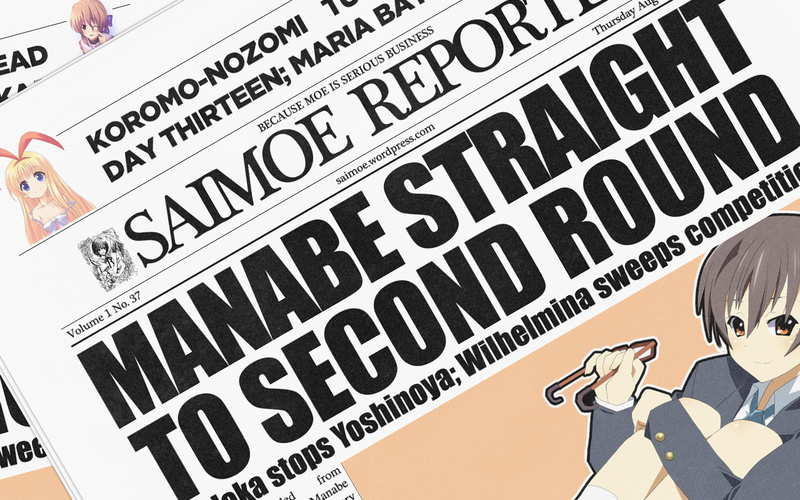 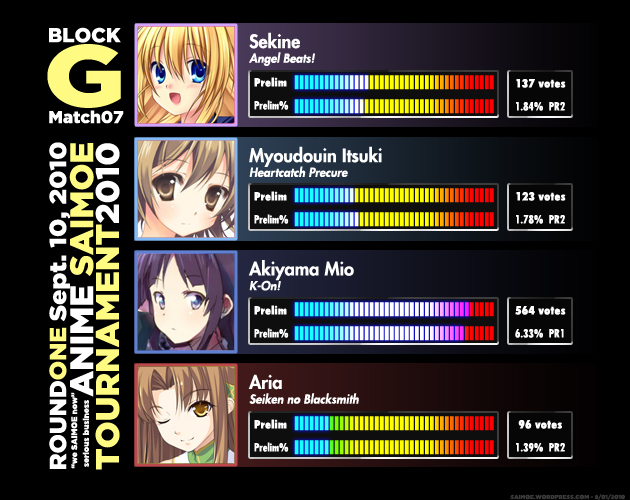 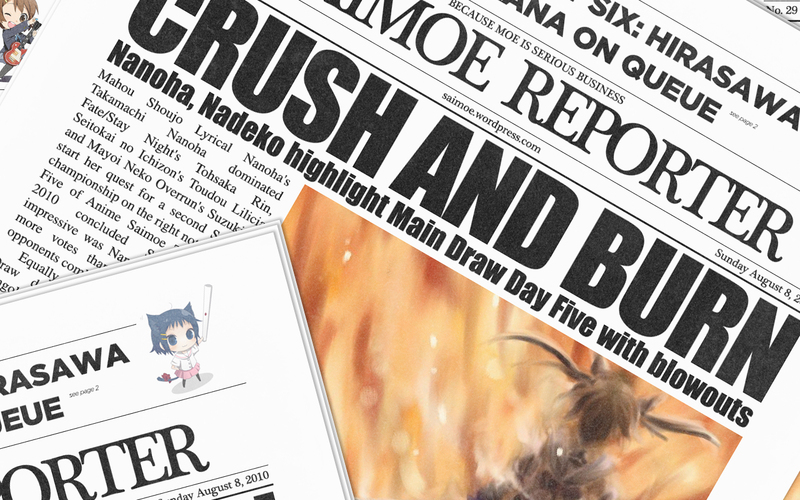 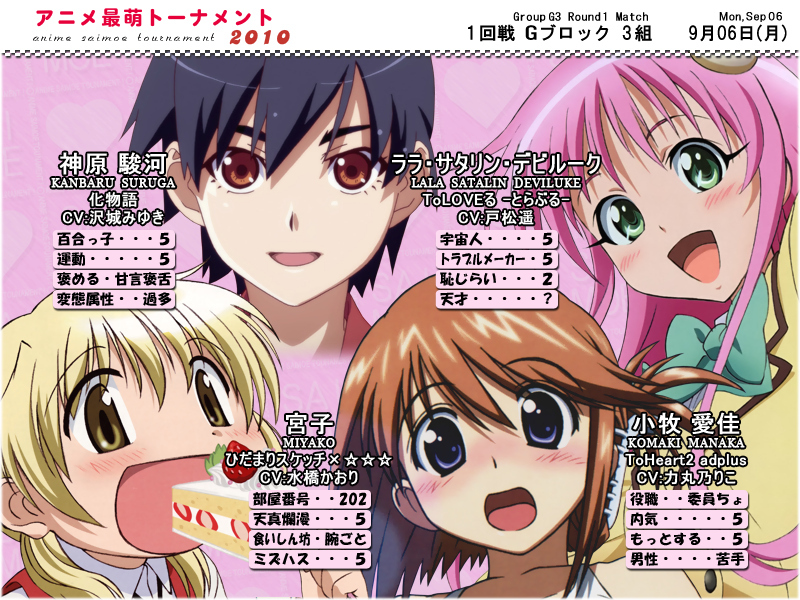 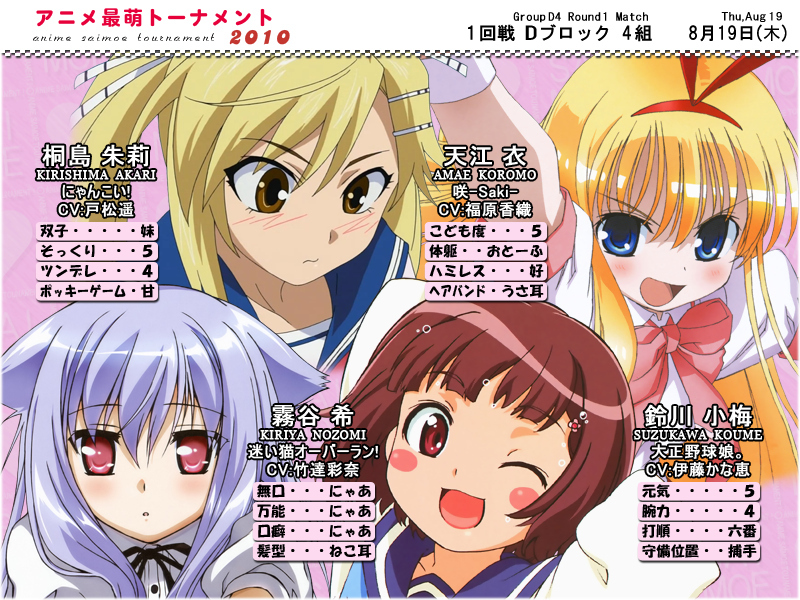 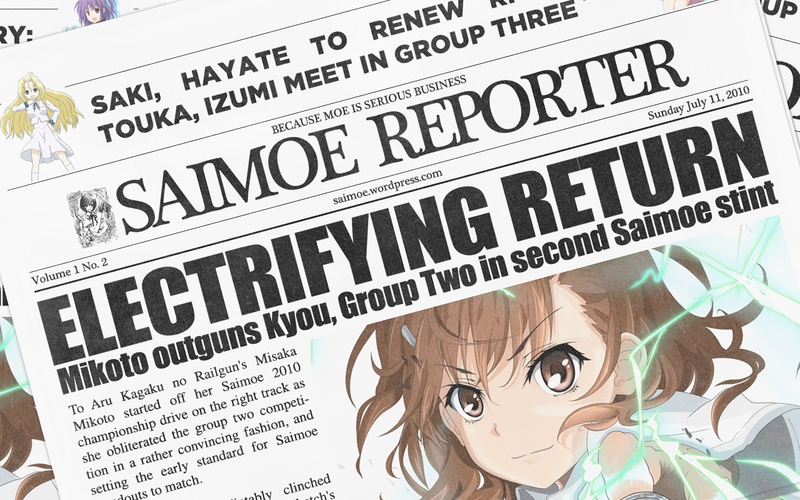 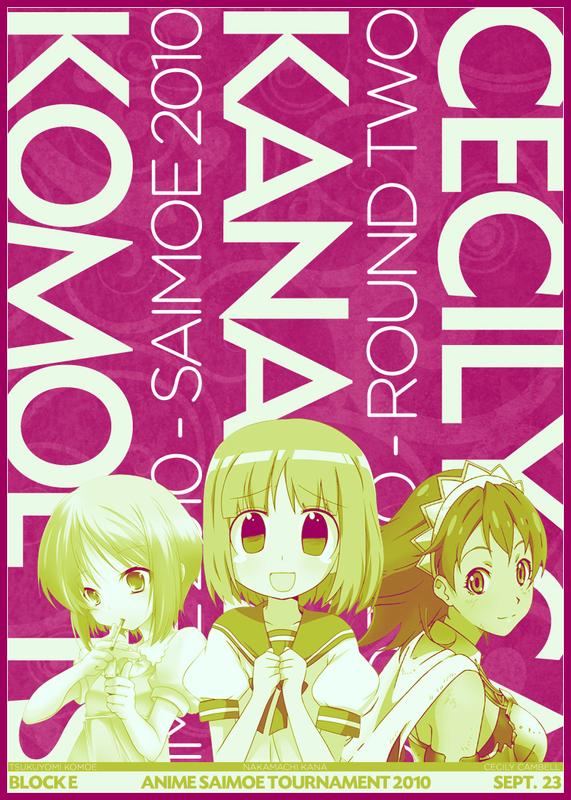 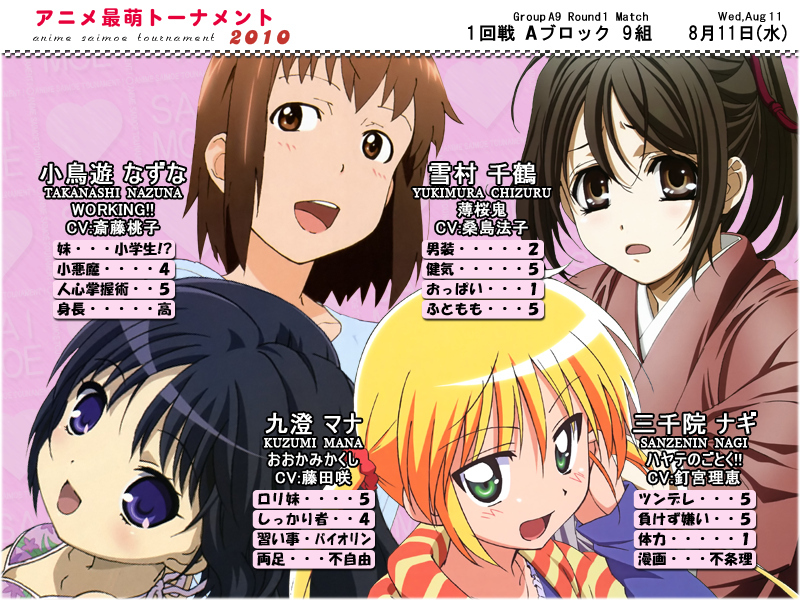 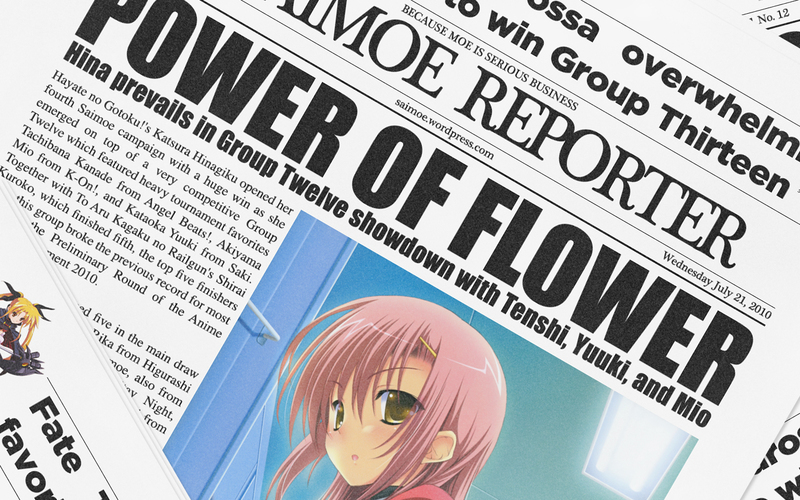 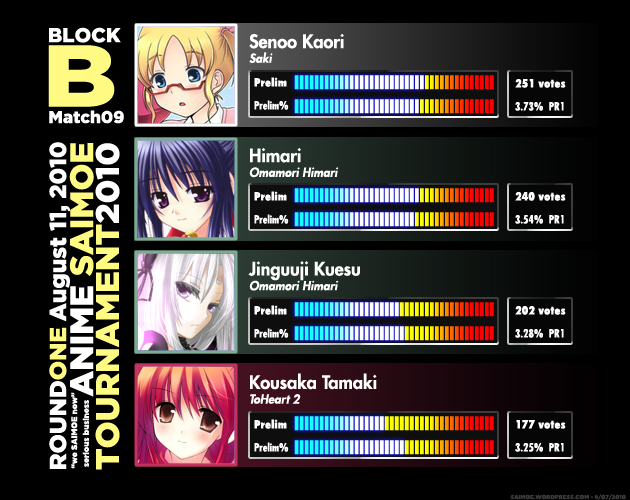 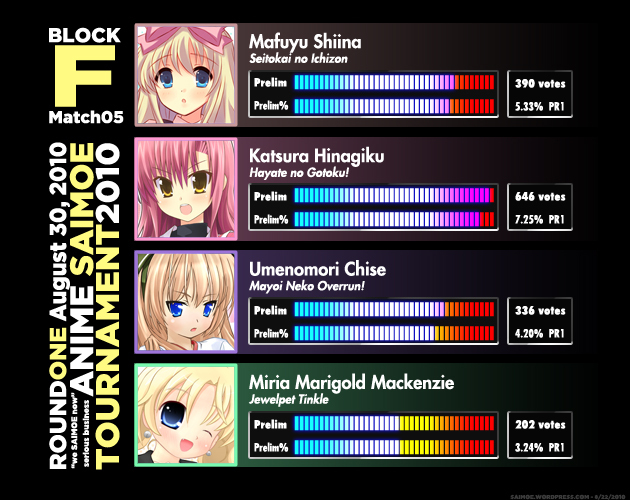 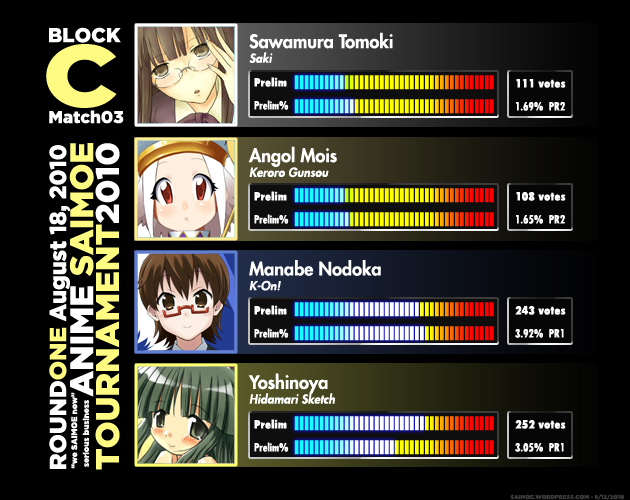 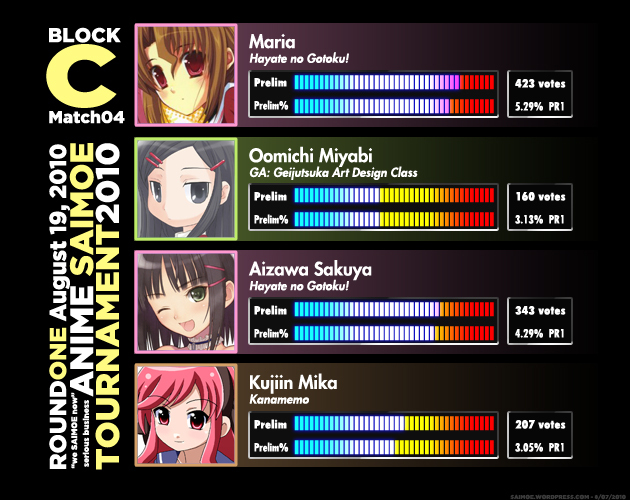 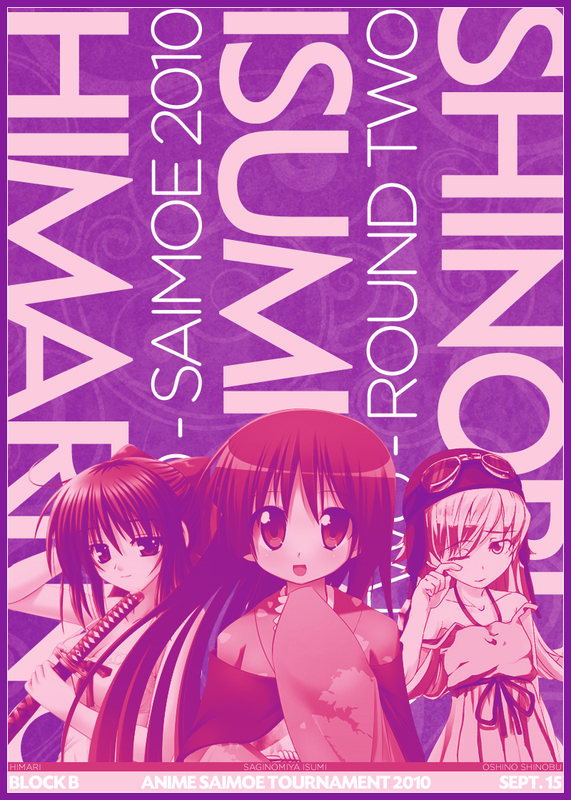 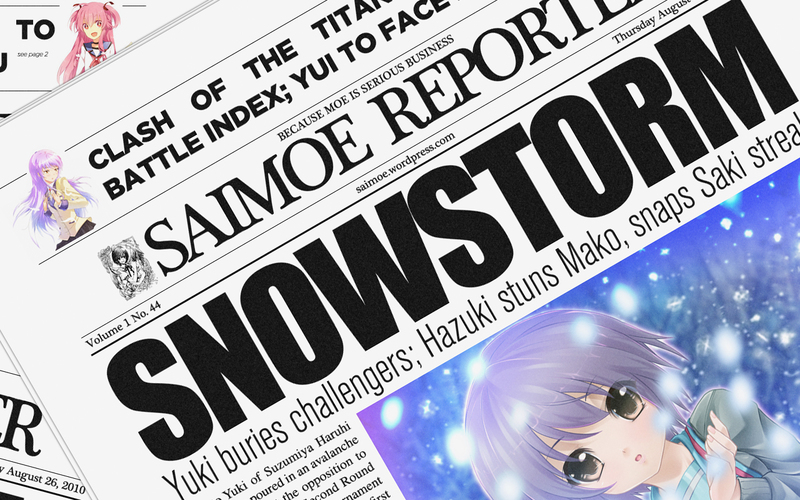 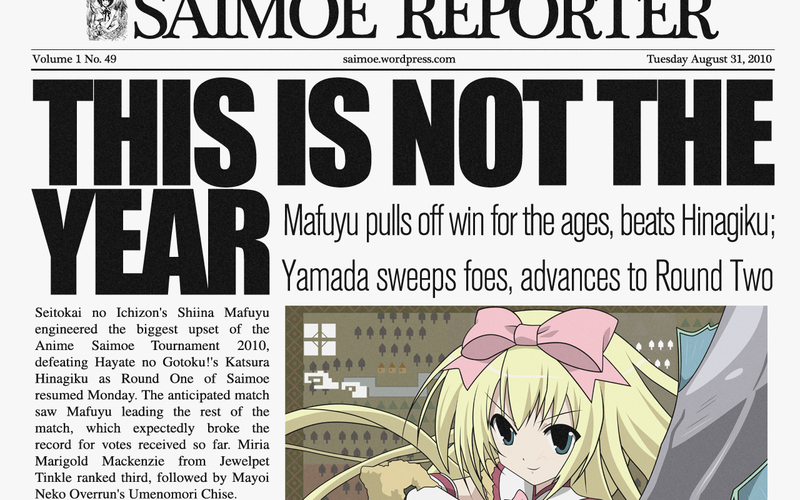 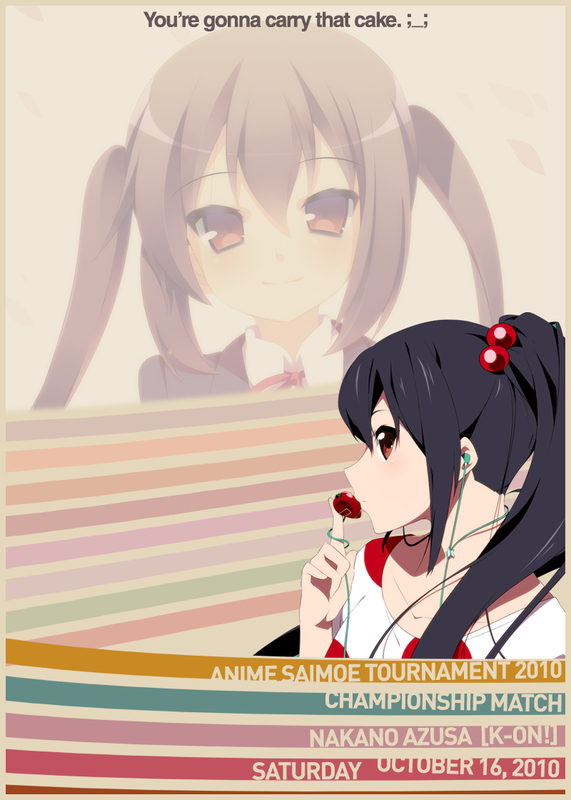 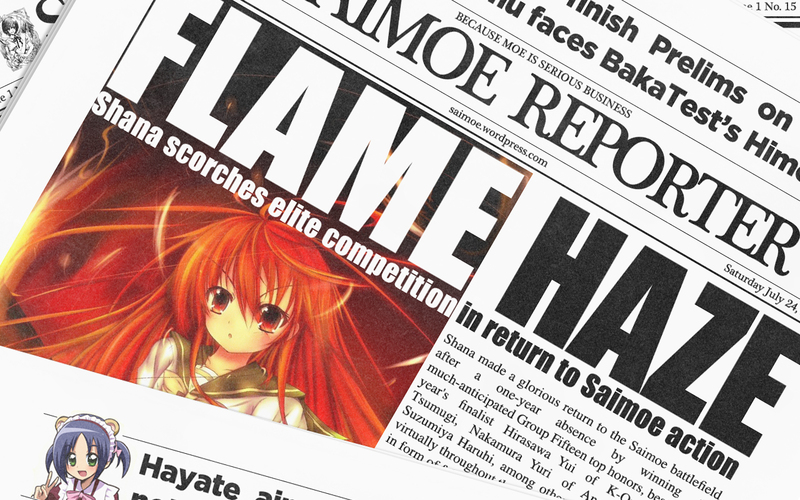 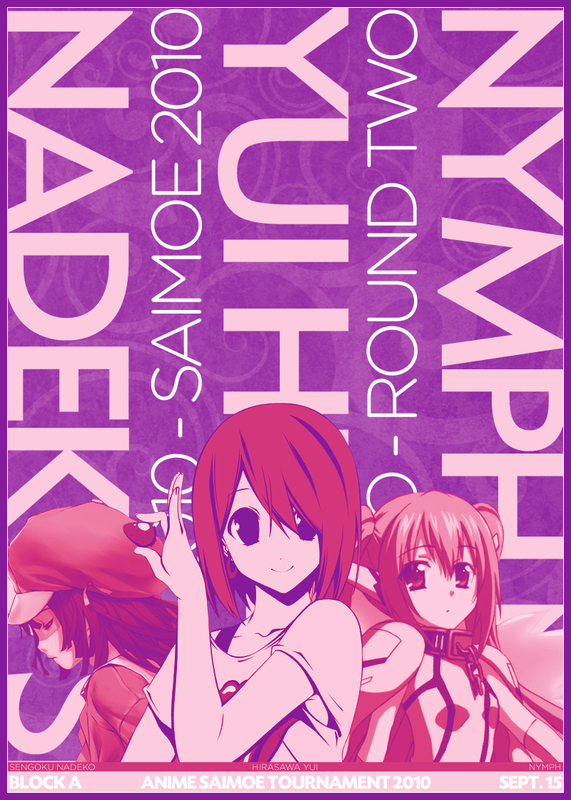 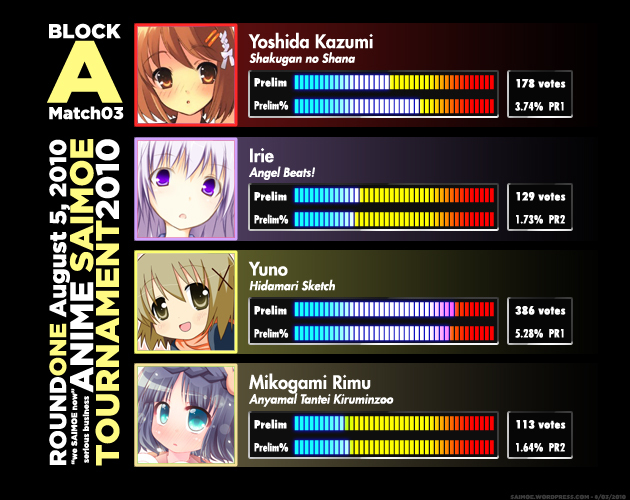 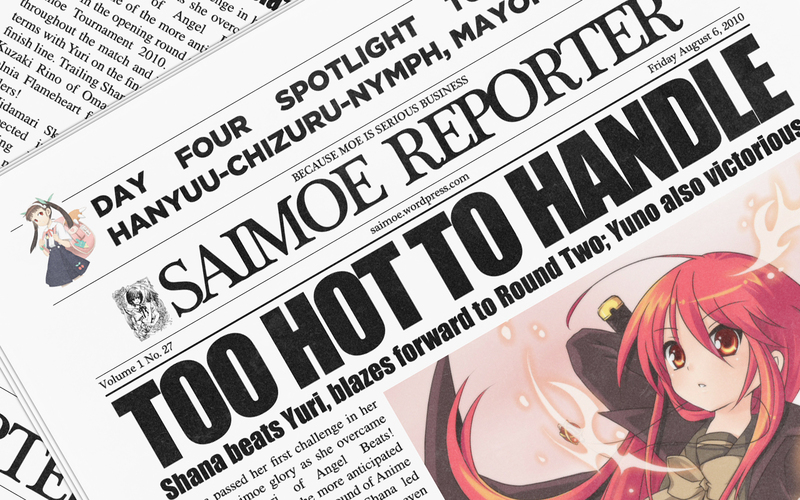 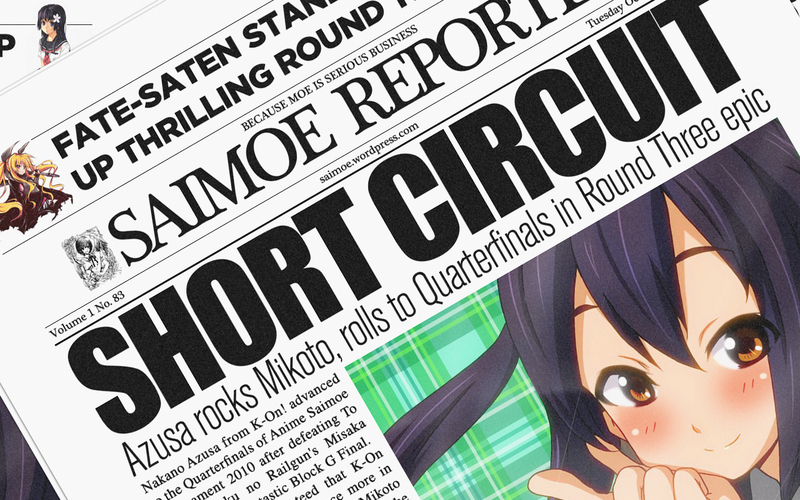 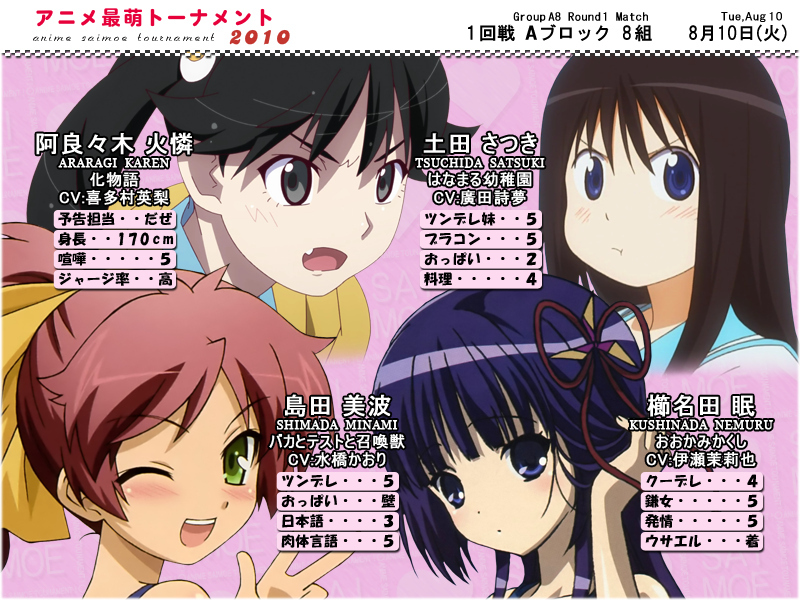 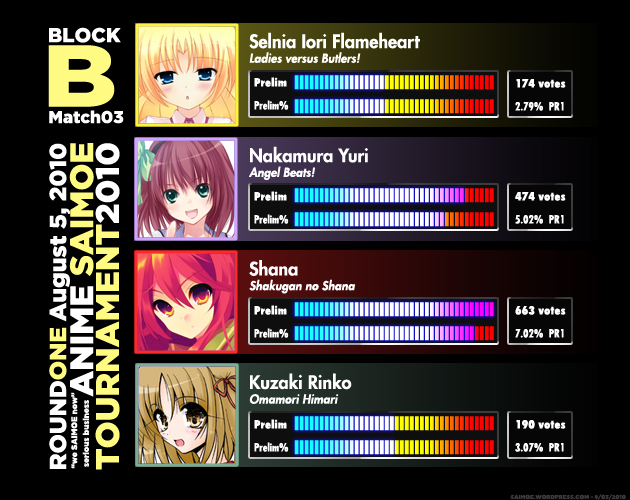 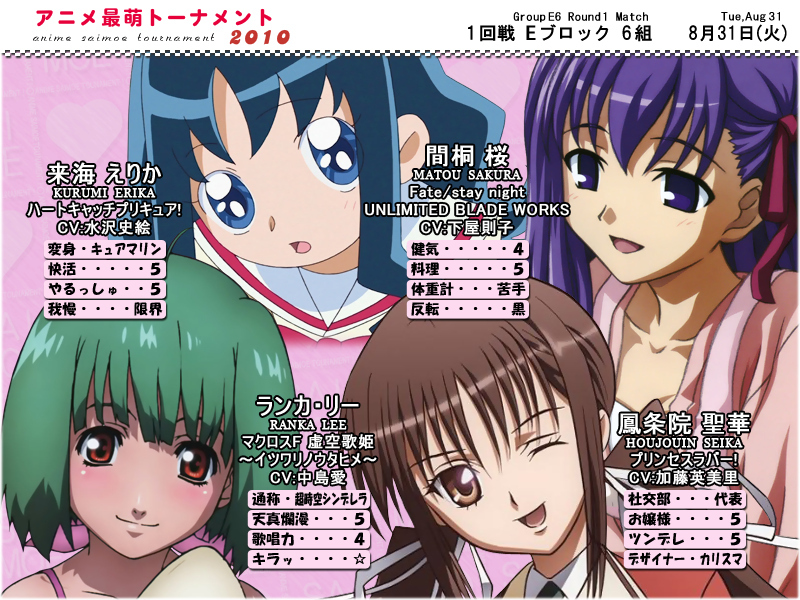 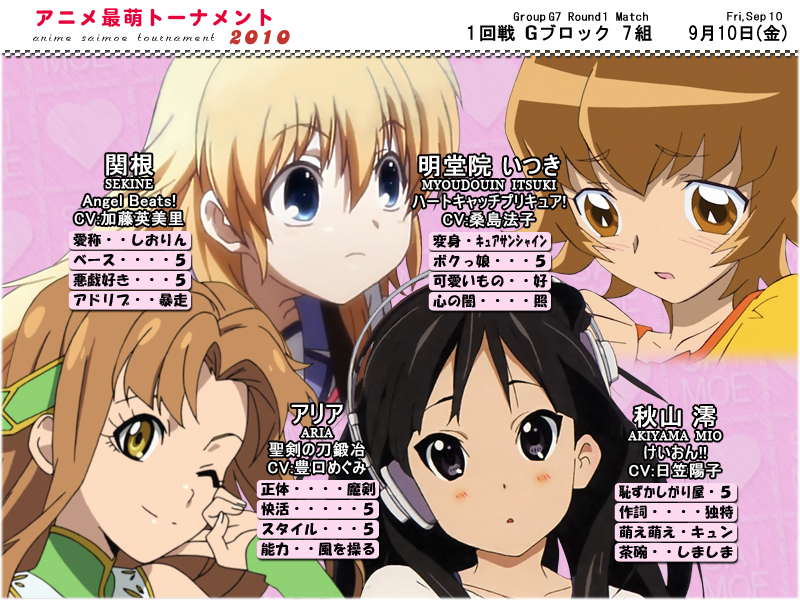 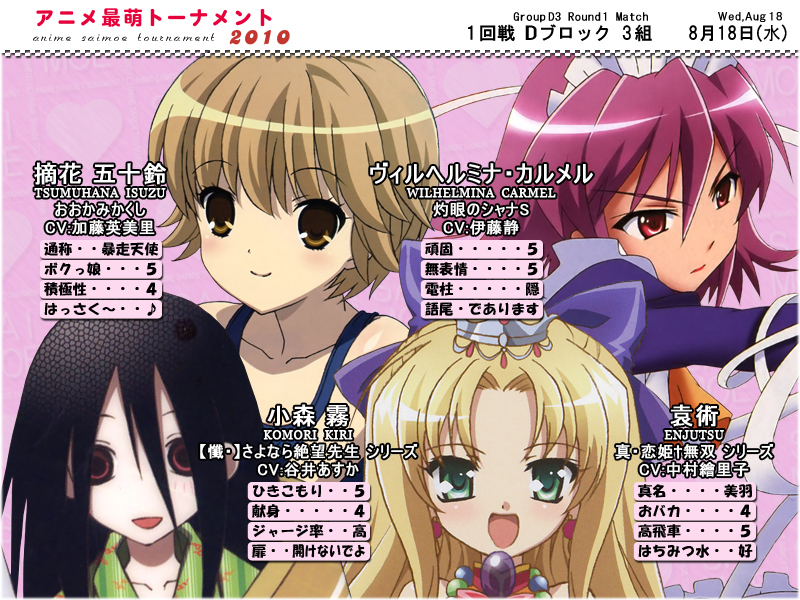 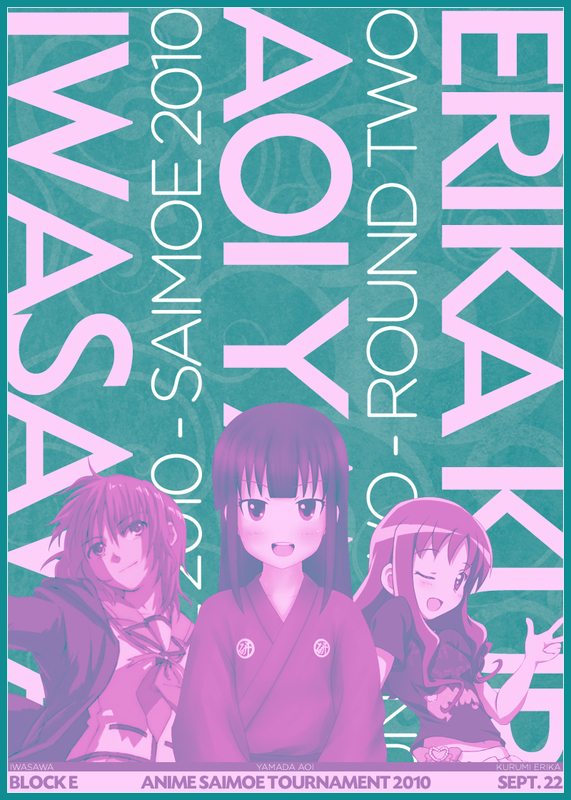 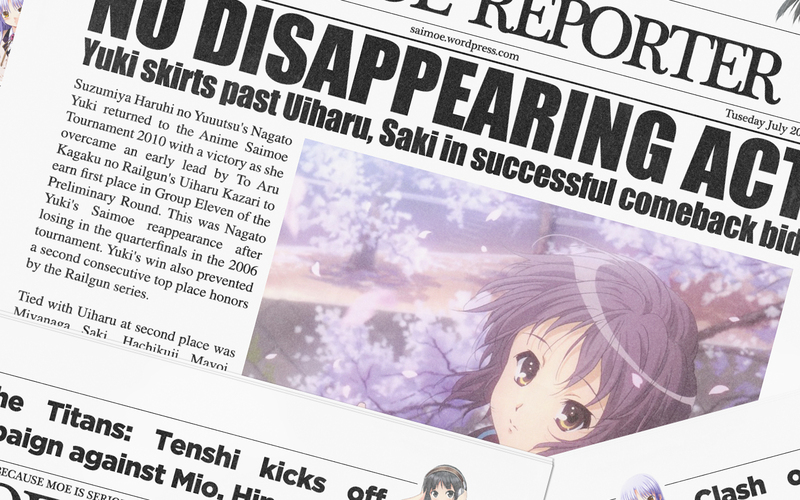 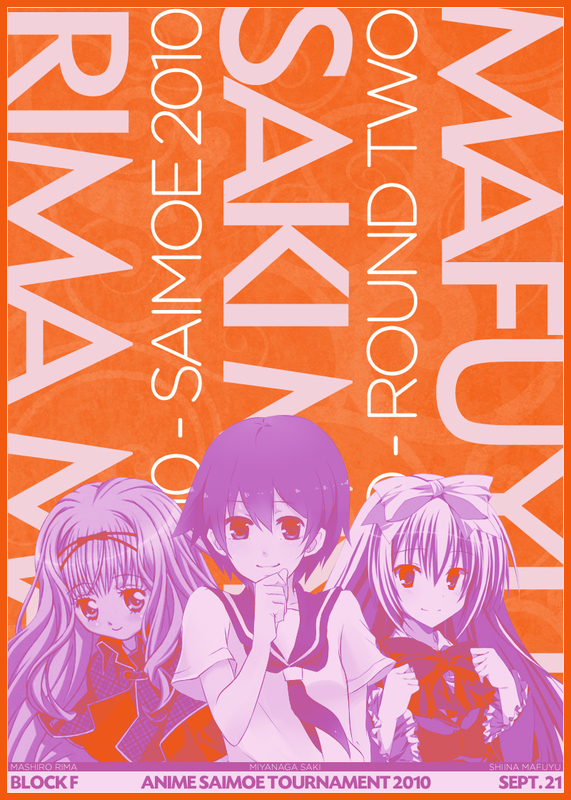 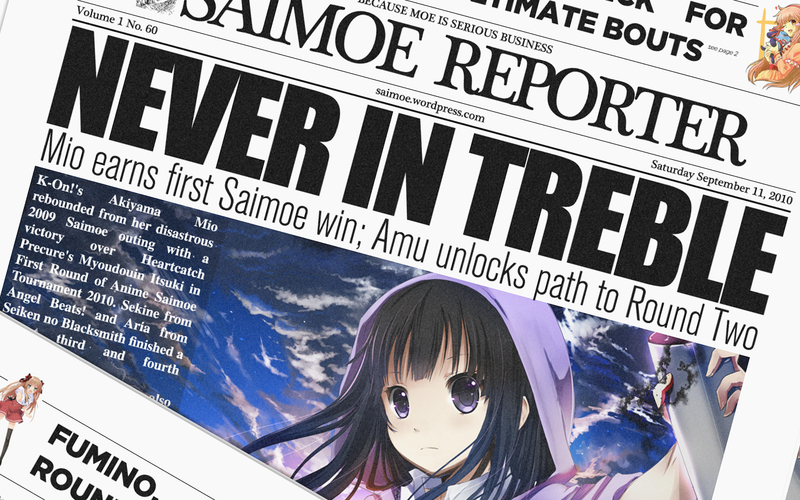 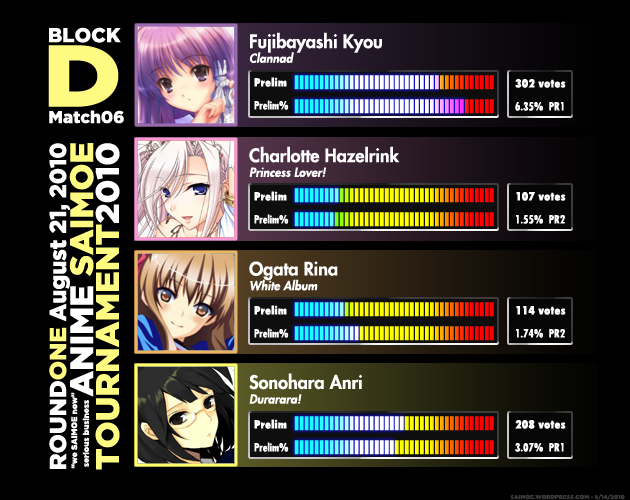 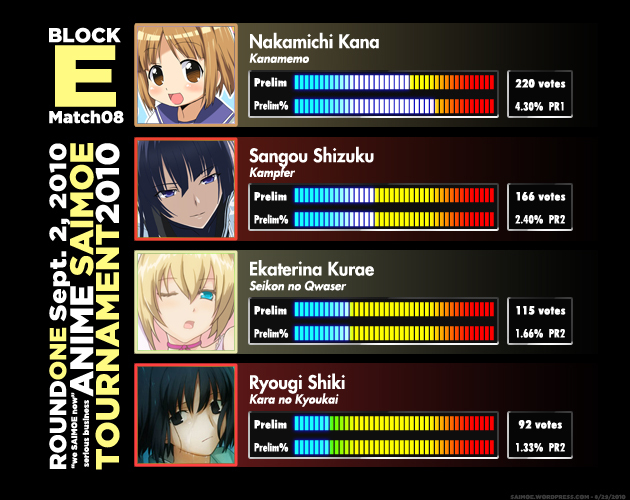 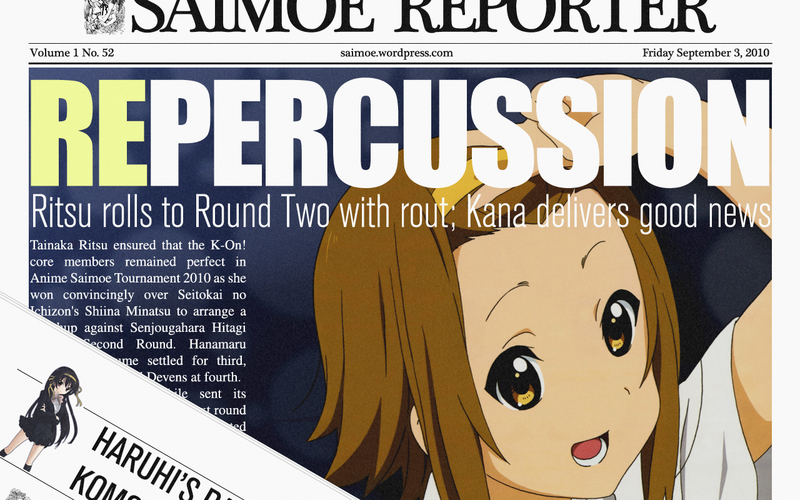 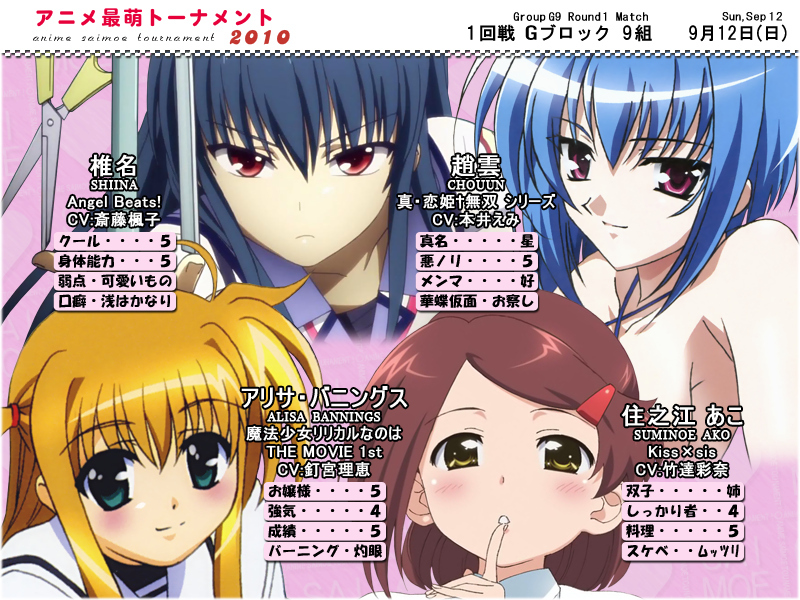 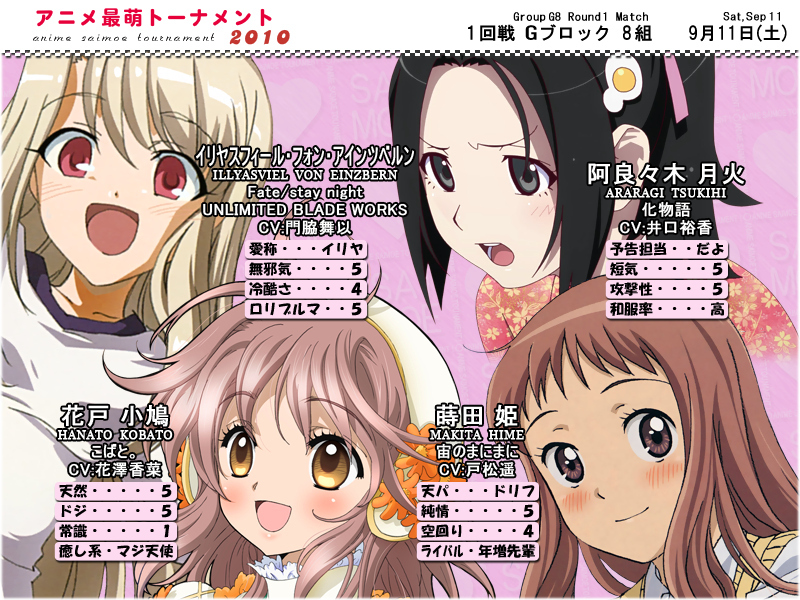 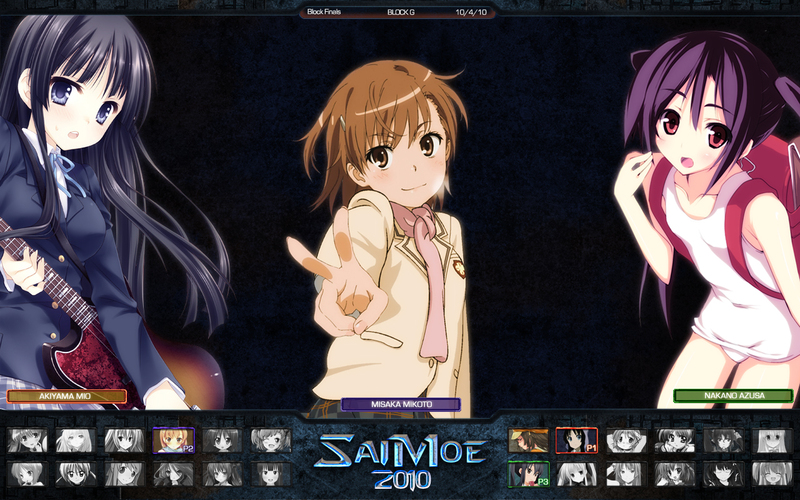 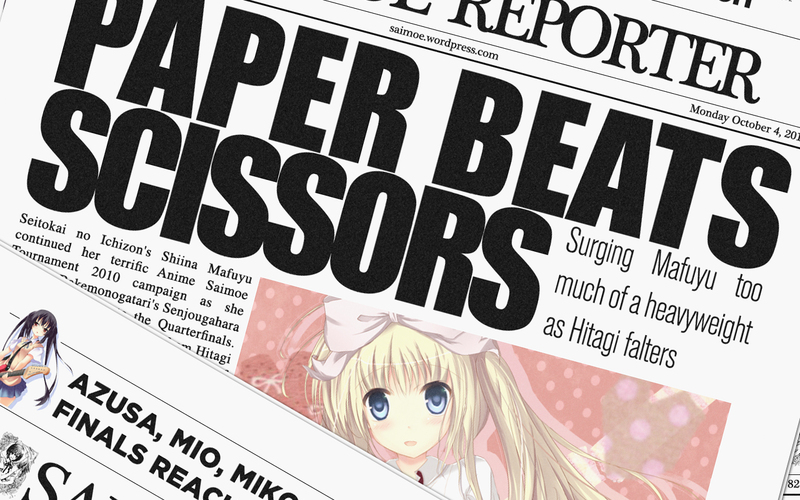 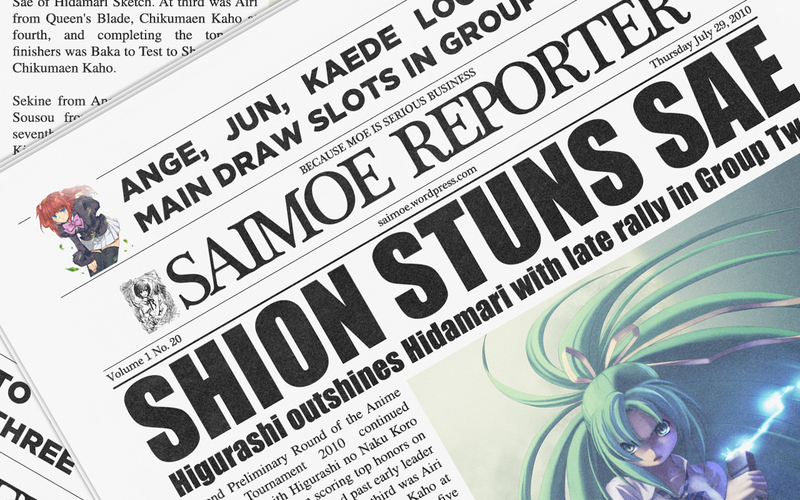 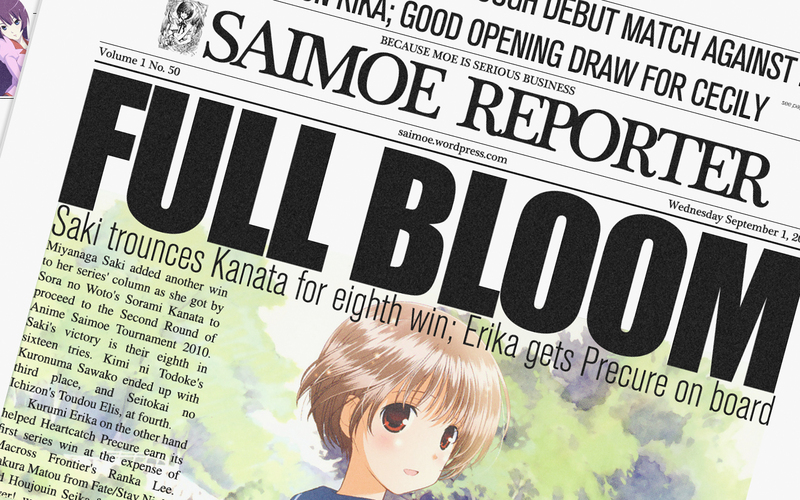 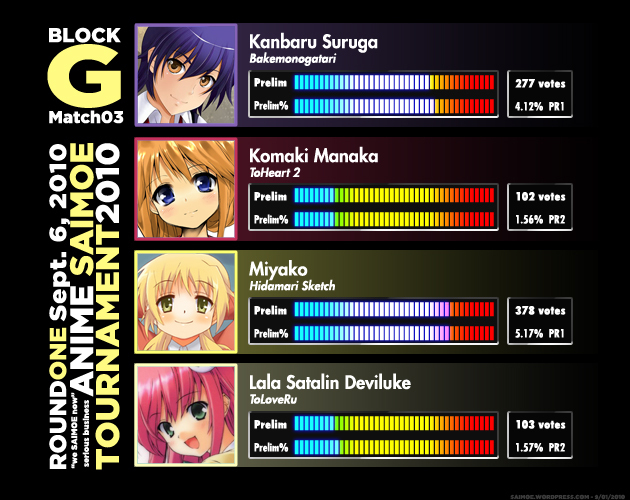 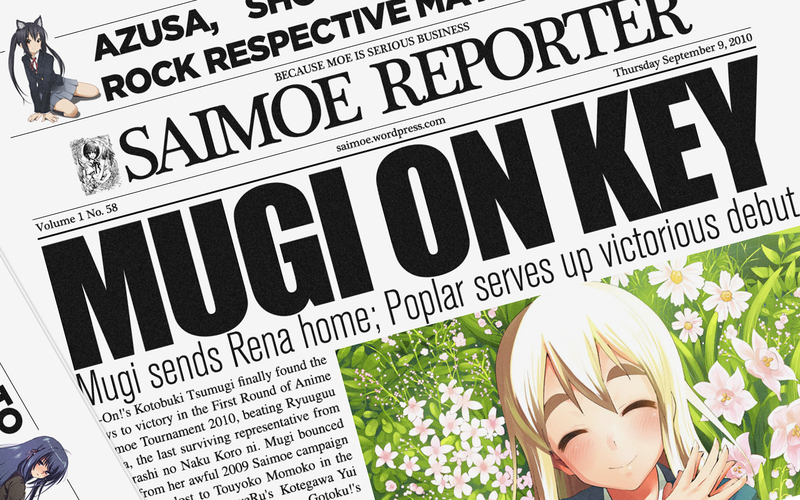 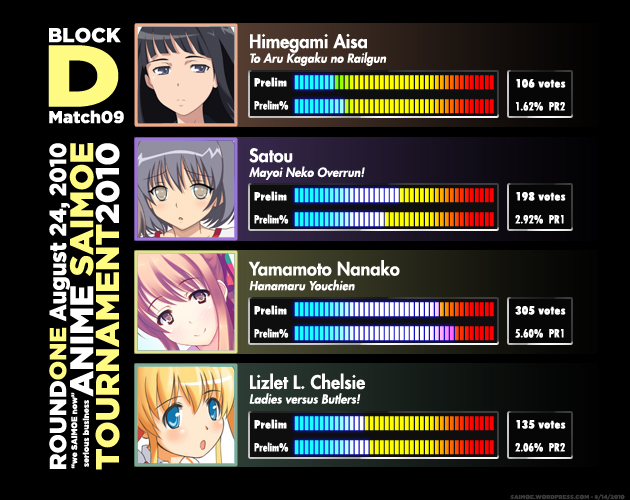 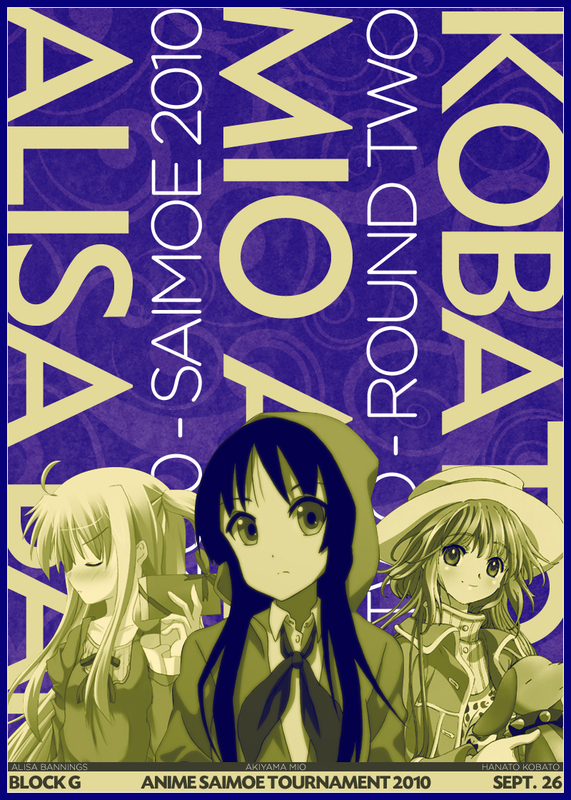 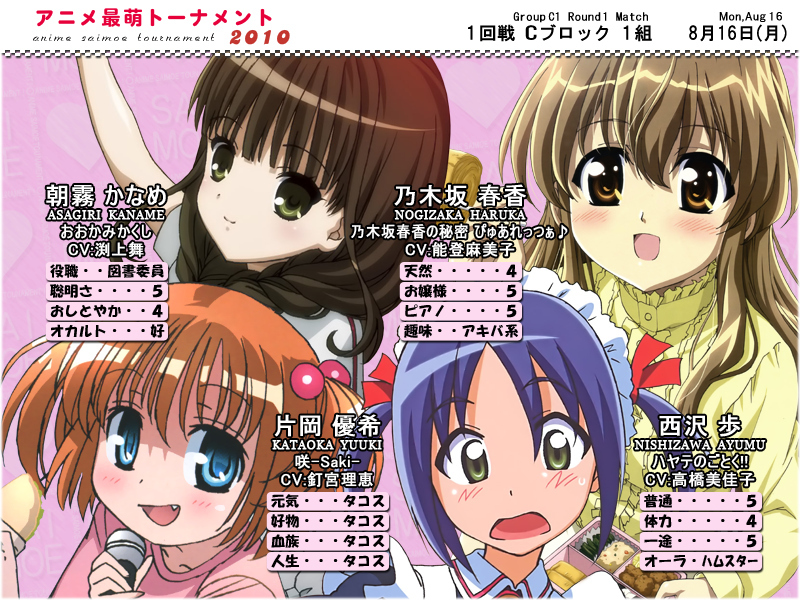 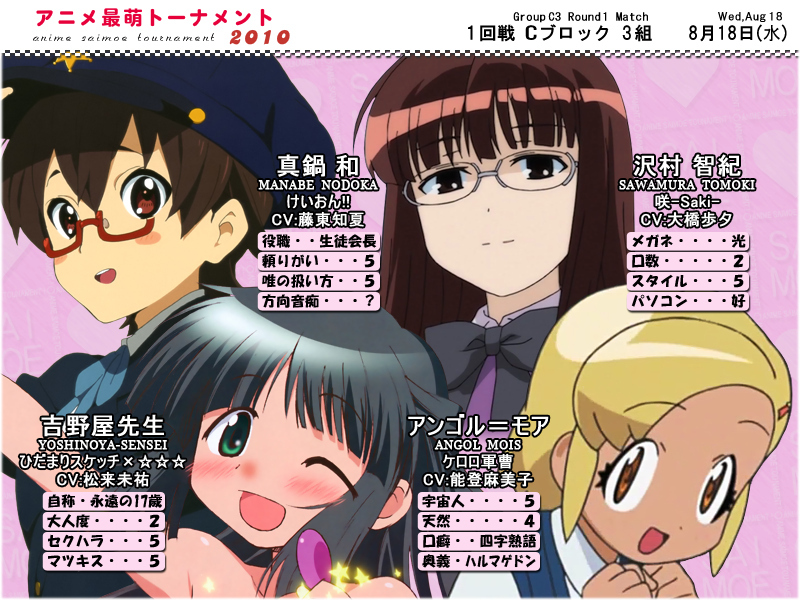 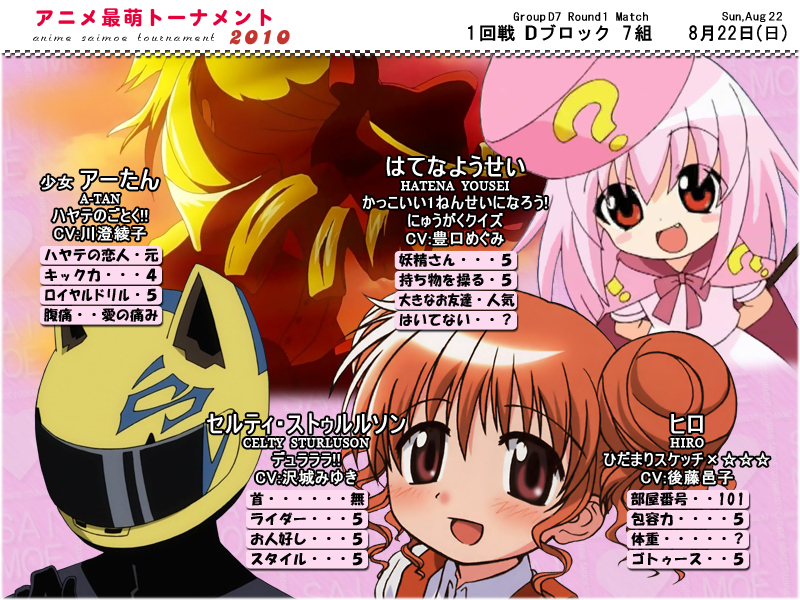 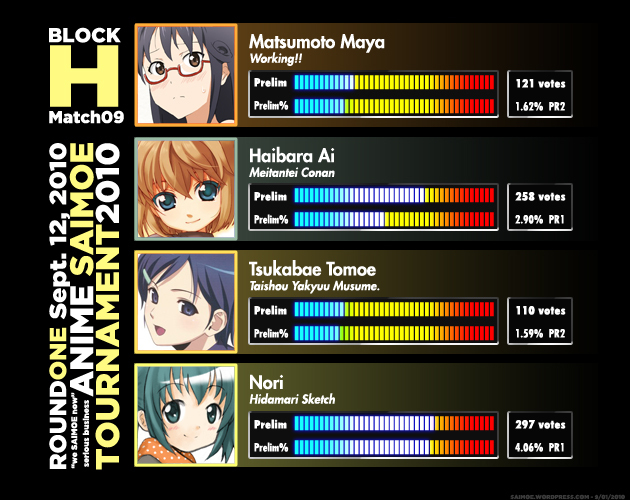 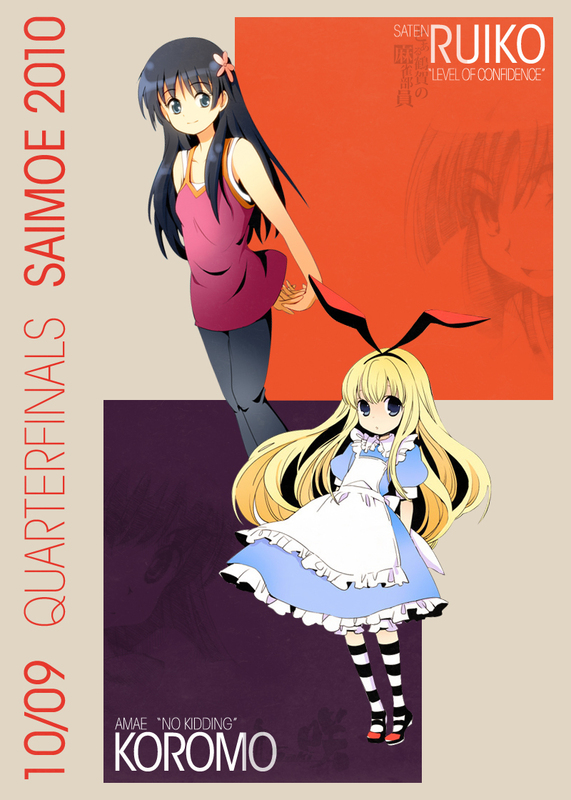 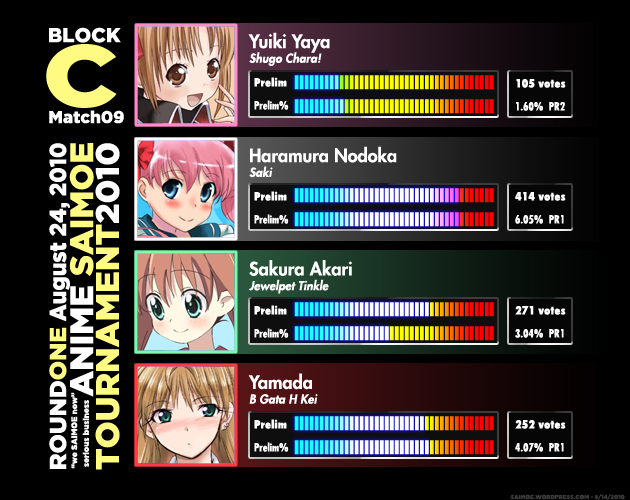 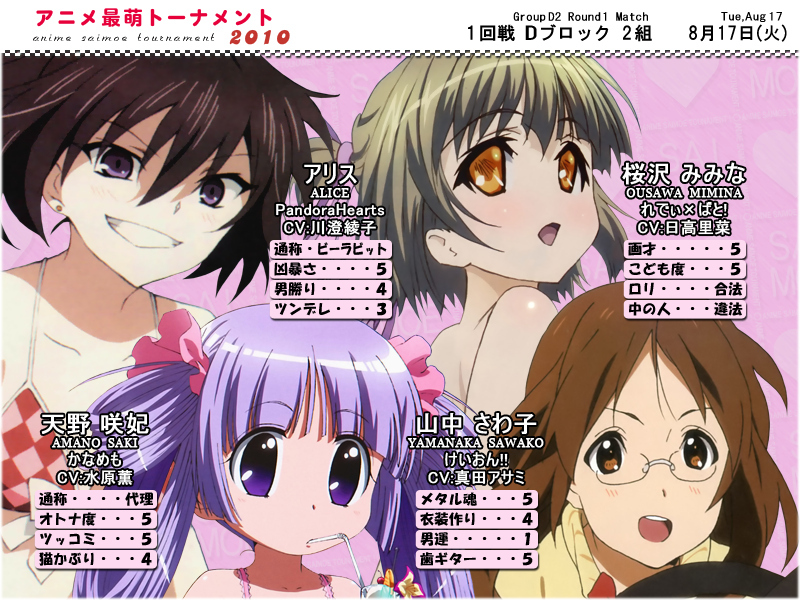 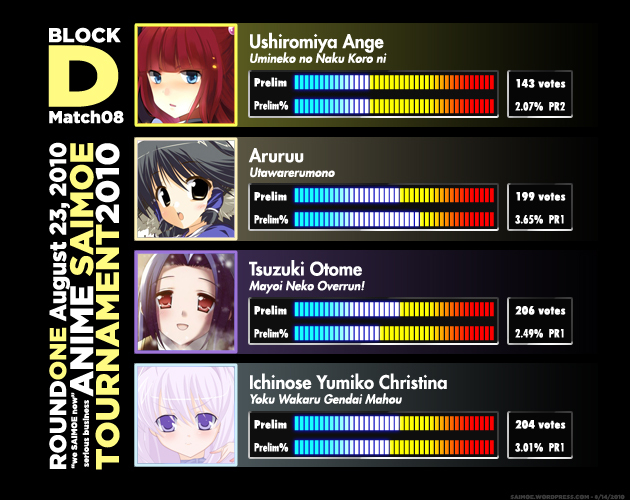 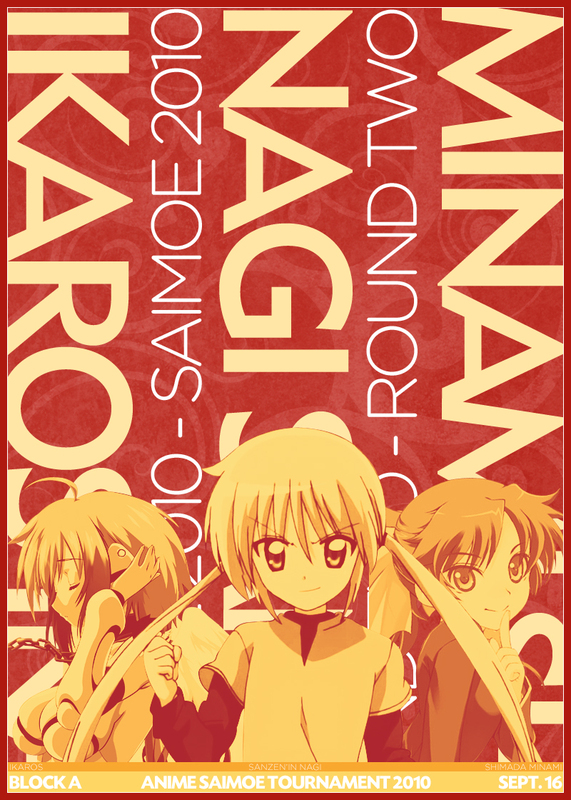 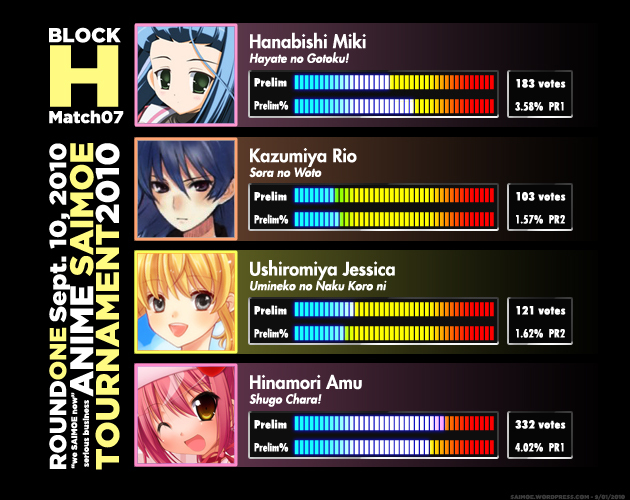 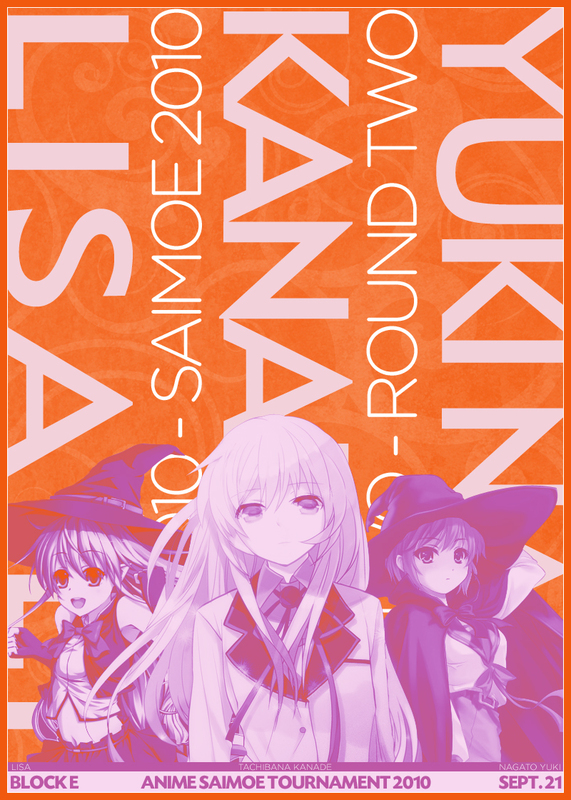 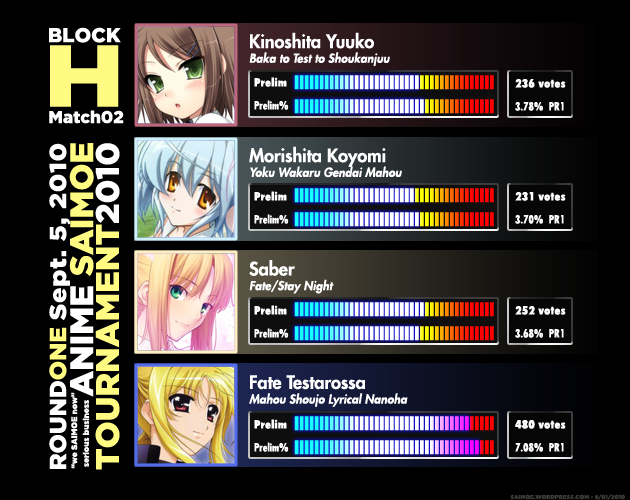 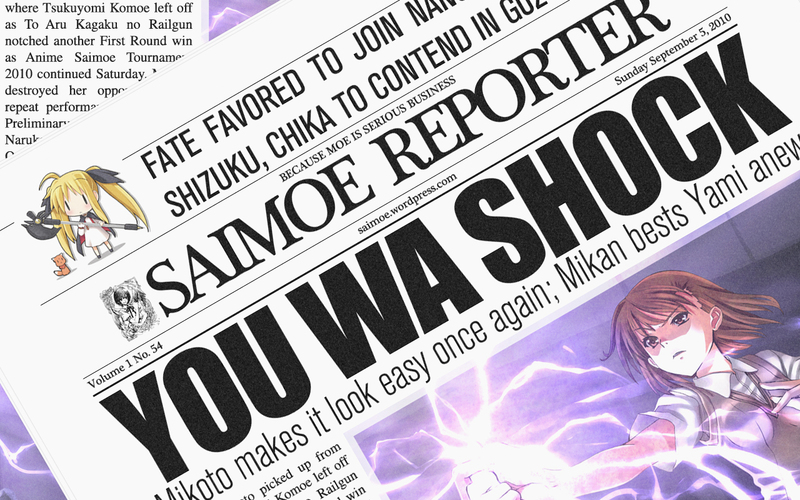 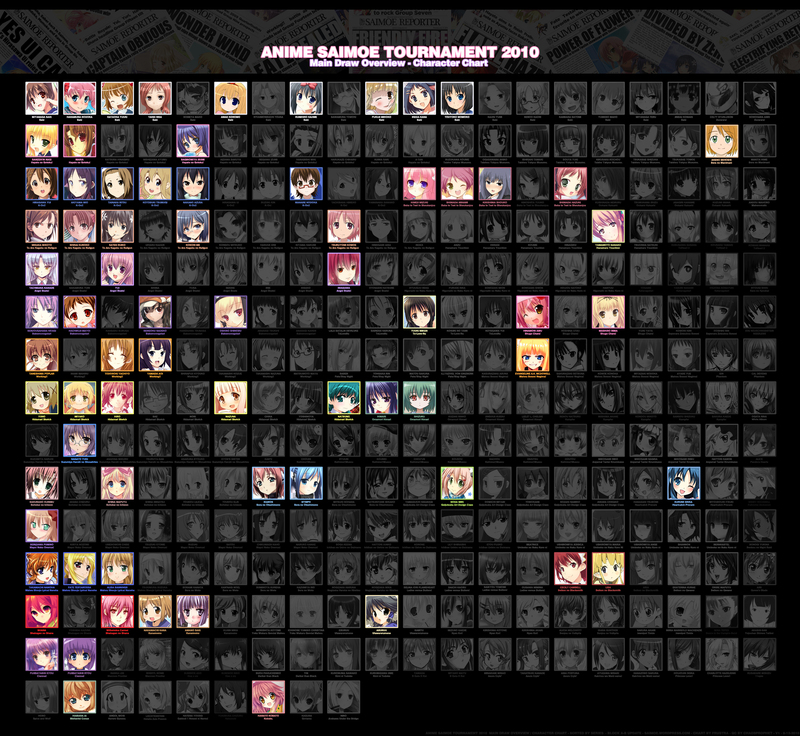 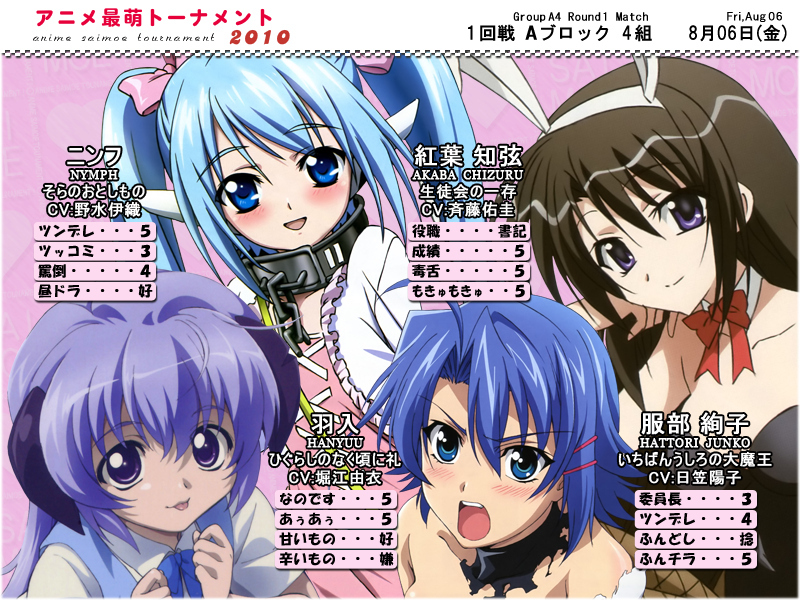 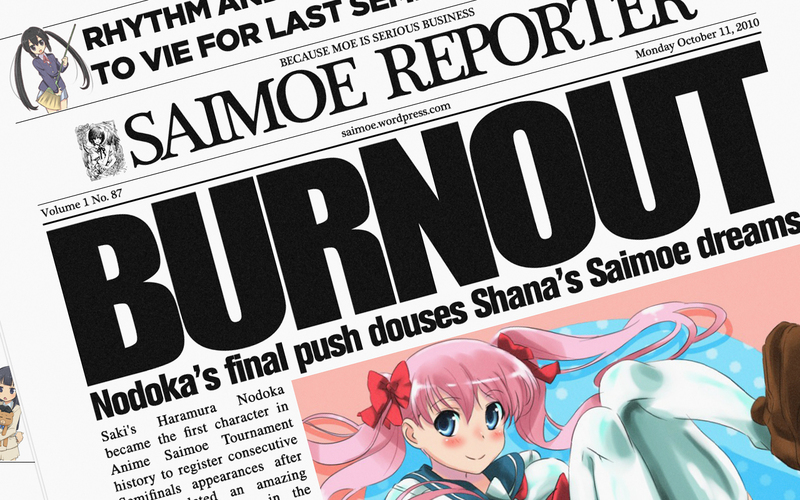 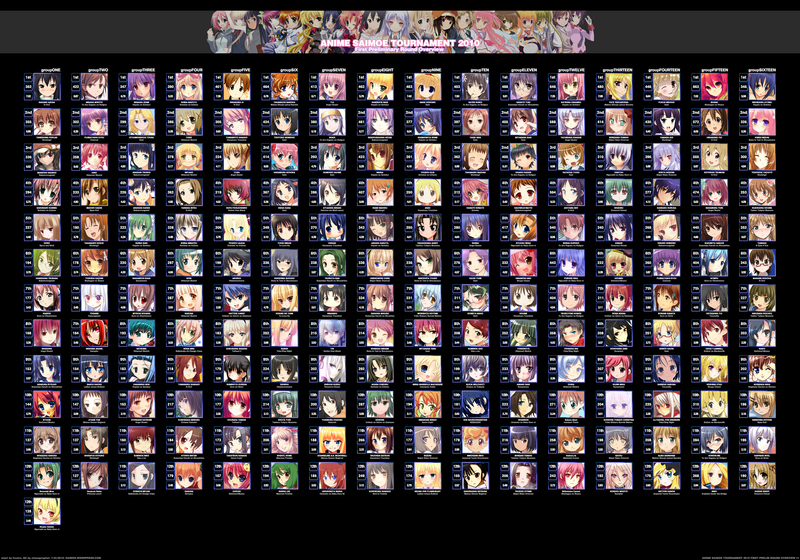 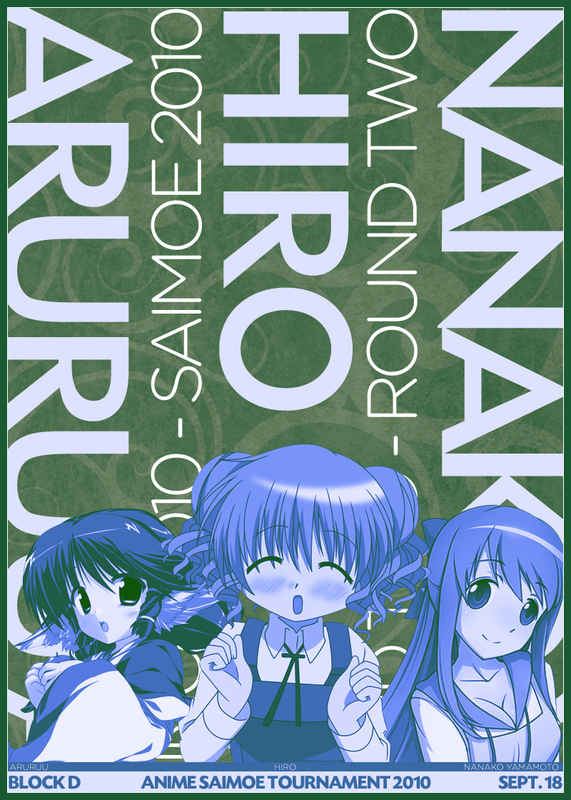 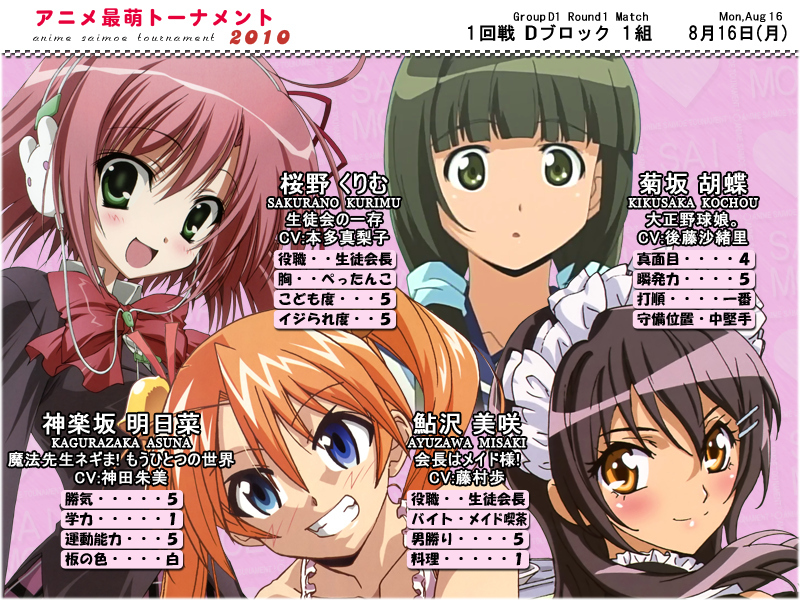 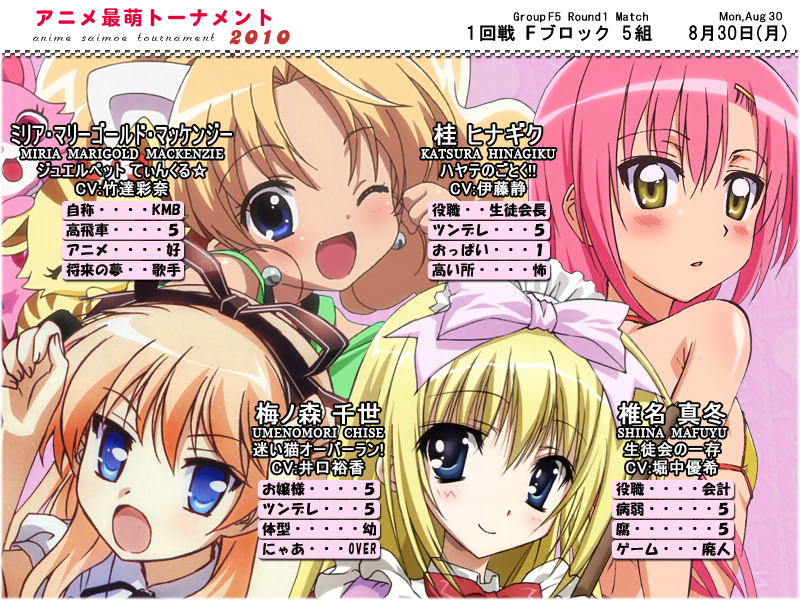 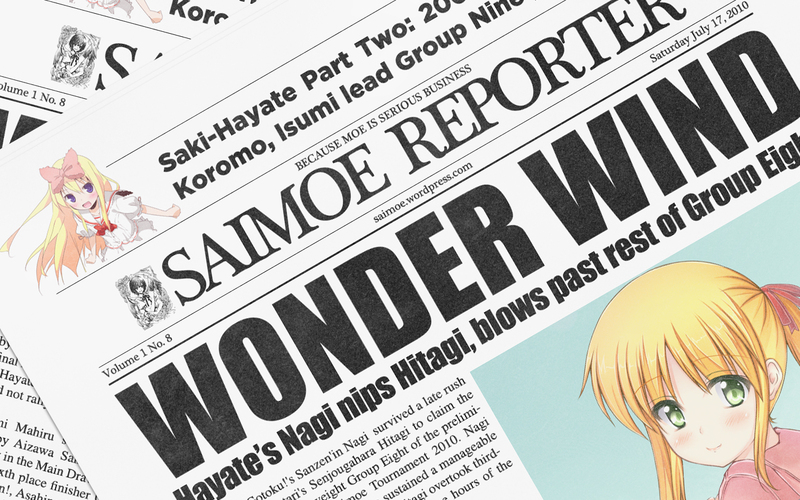 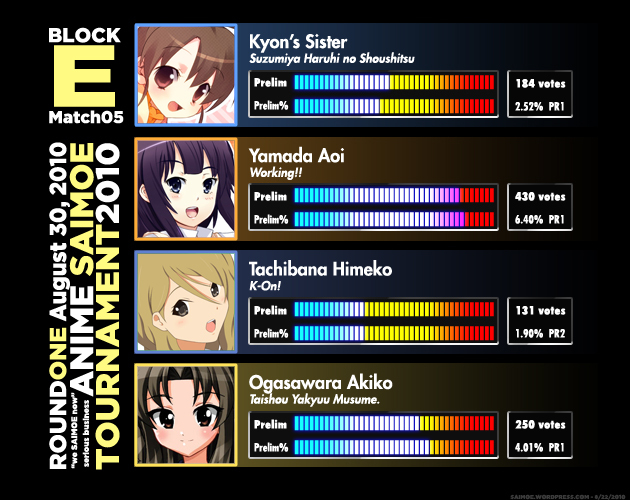 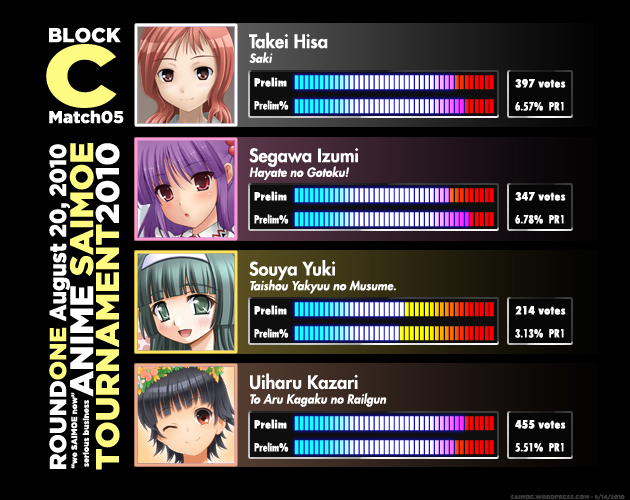 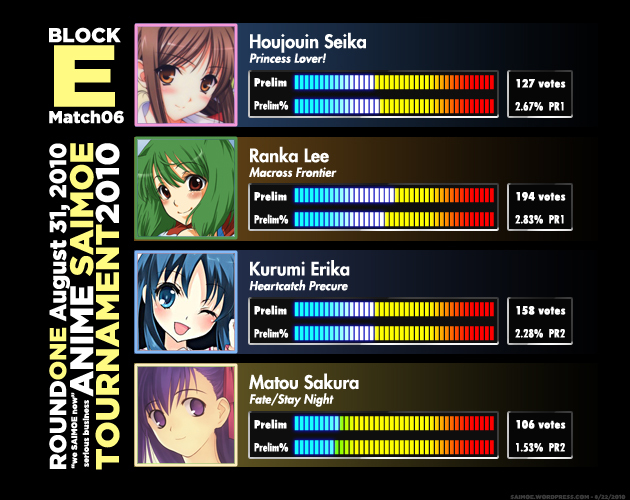 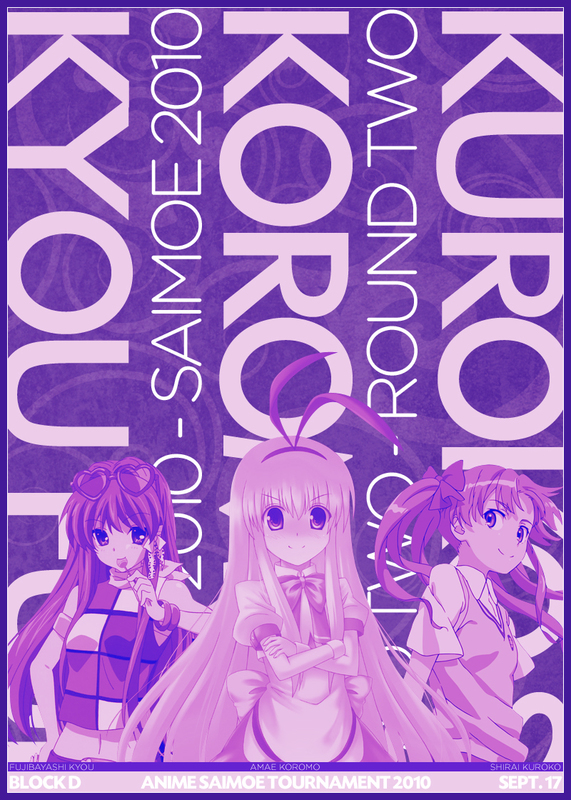 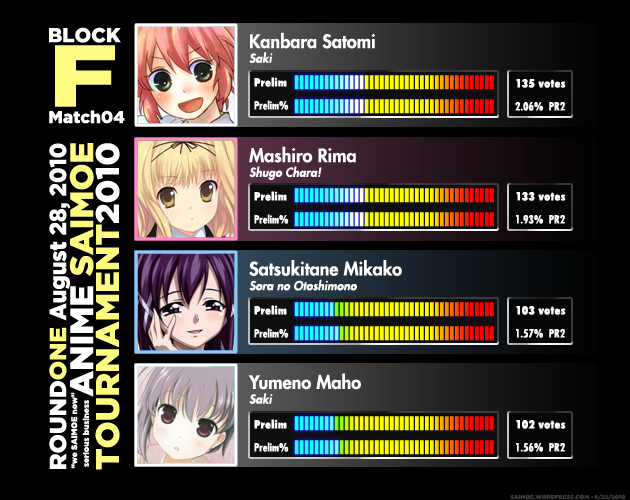 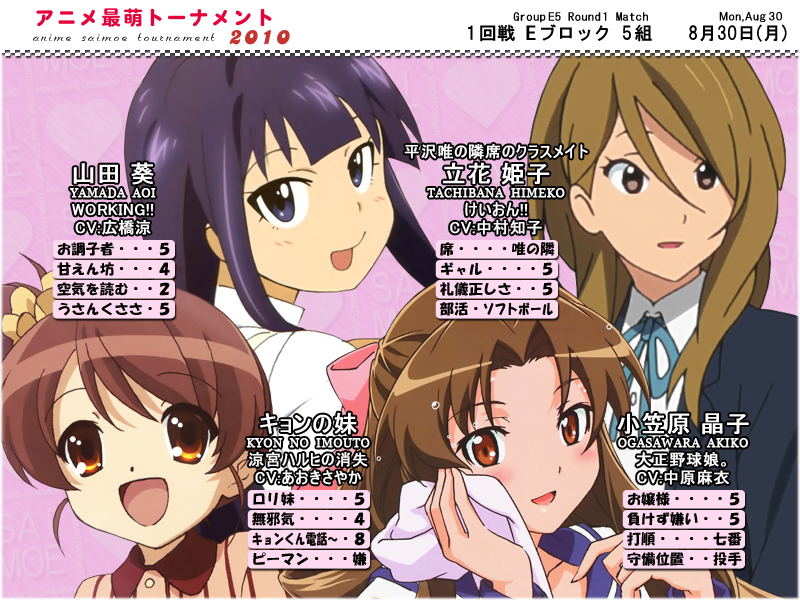 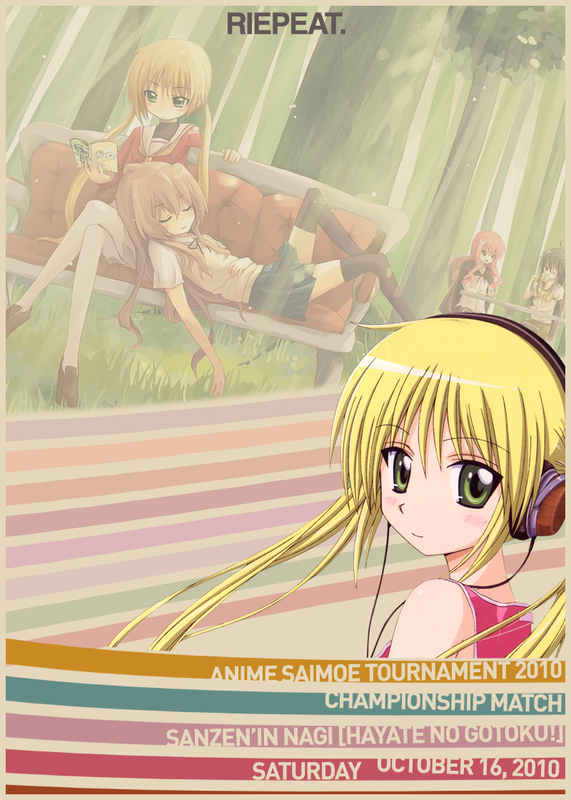 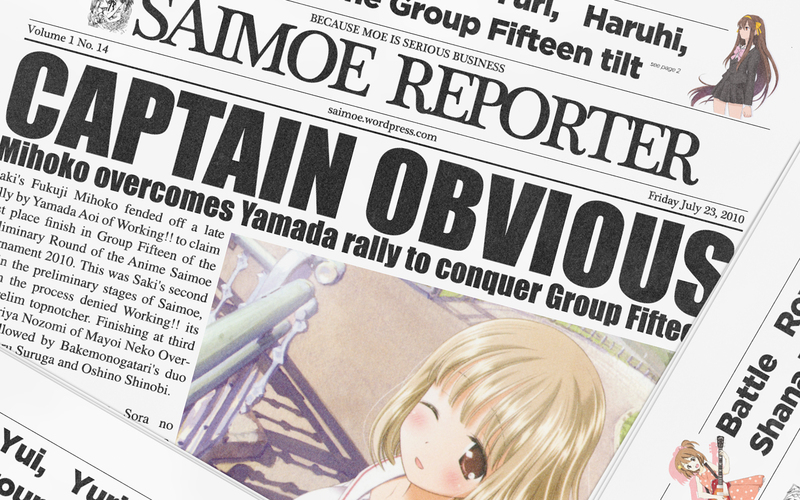 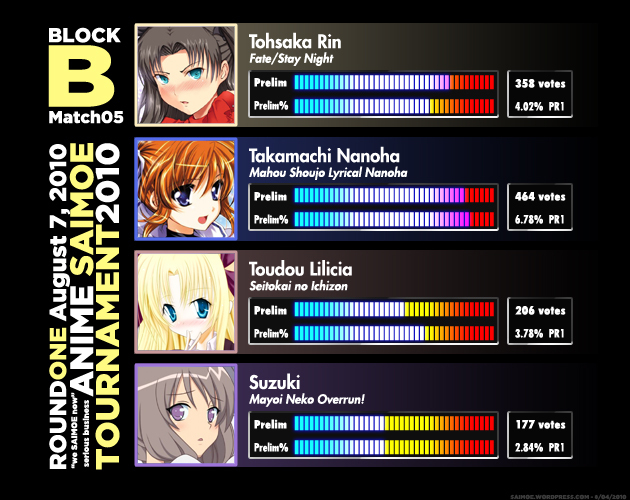 All Saimoe 2010 posts on this site, including winners and match graphs, are filed here. 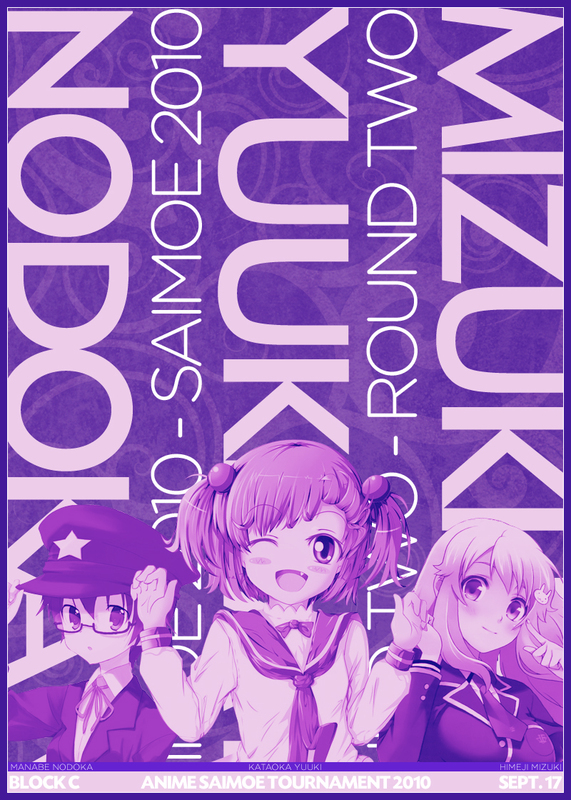 I’ll be supporting my fav chars through the whole tourney! 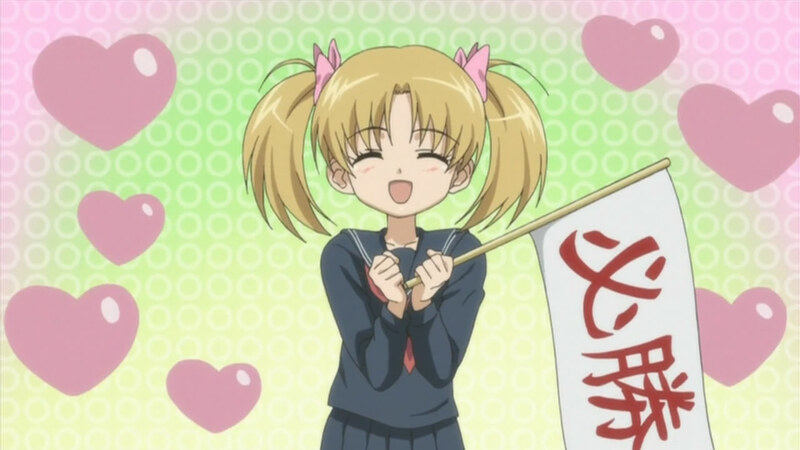 Thanks frustra for the sig! 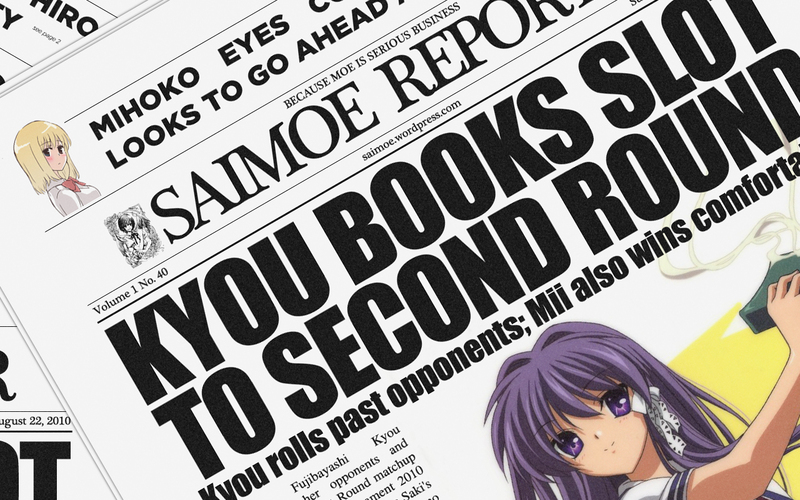 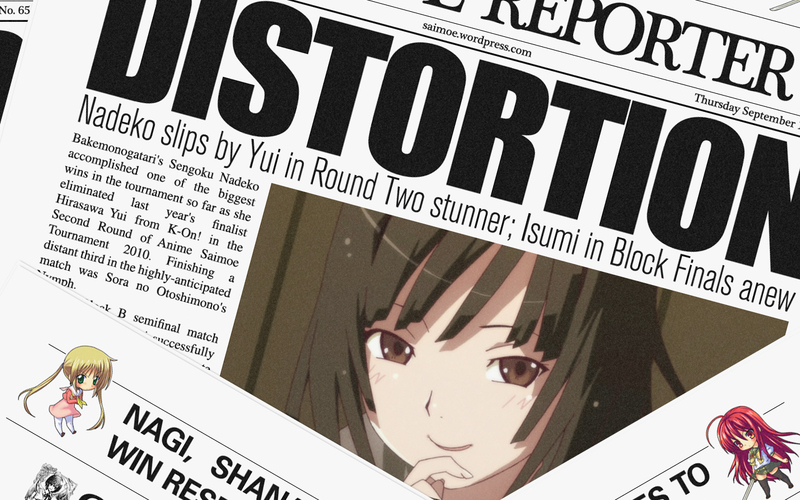 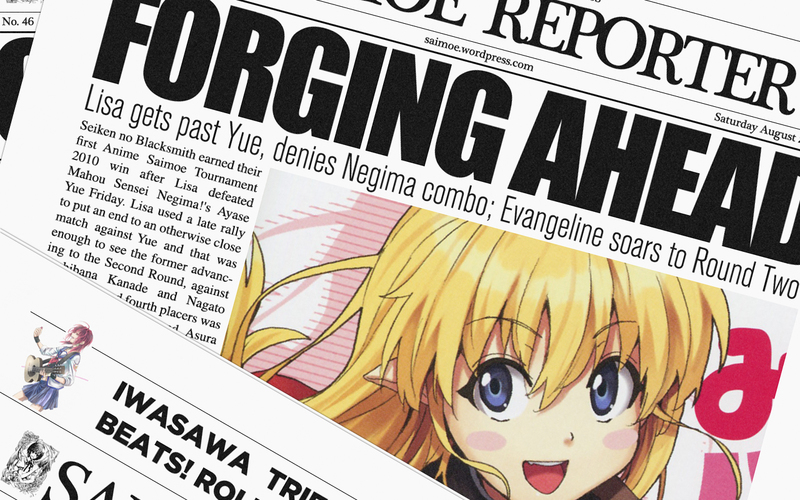 “English Synchroom” link should be changed to http://synchroom.wikispaces.com/SaiMoe2010 or just http://synchroom.wikispaces.com and the link you have there right now should be for “Animesuki forums” as the one for that links to the 2009 thread. 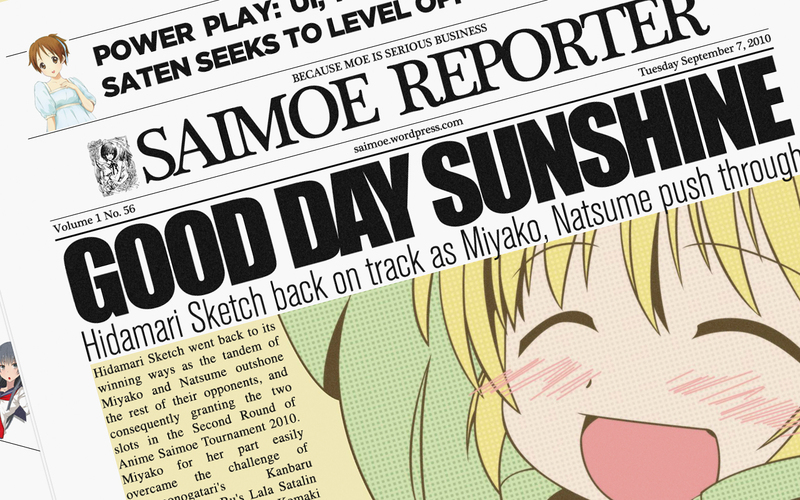 In any case, let’s have a good one. 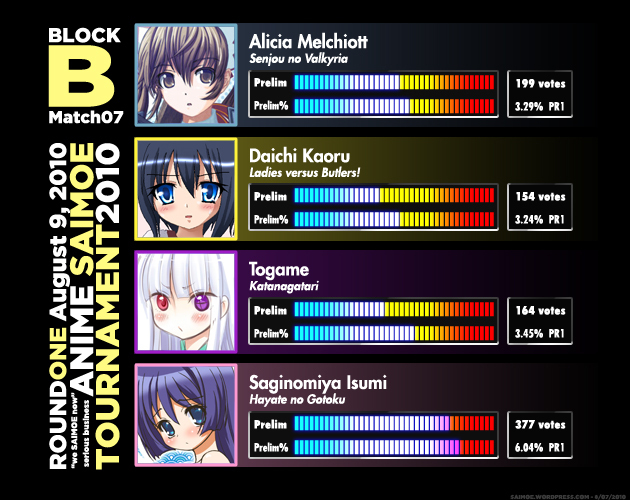 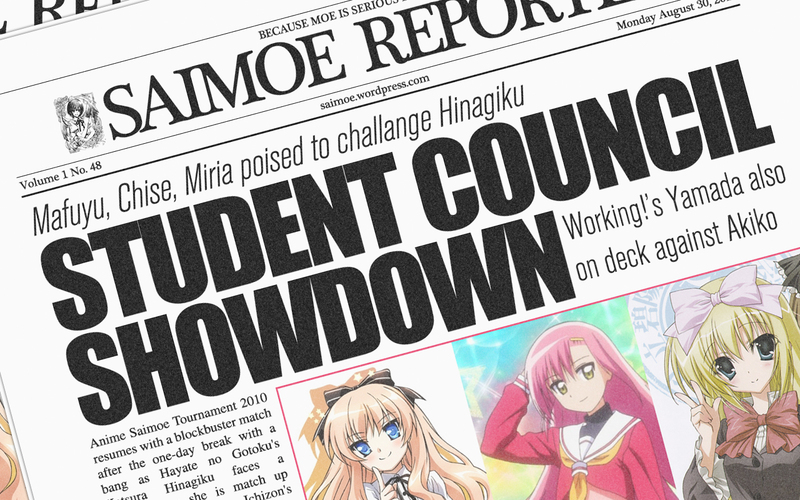 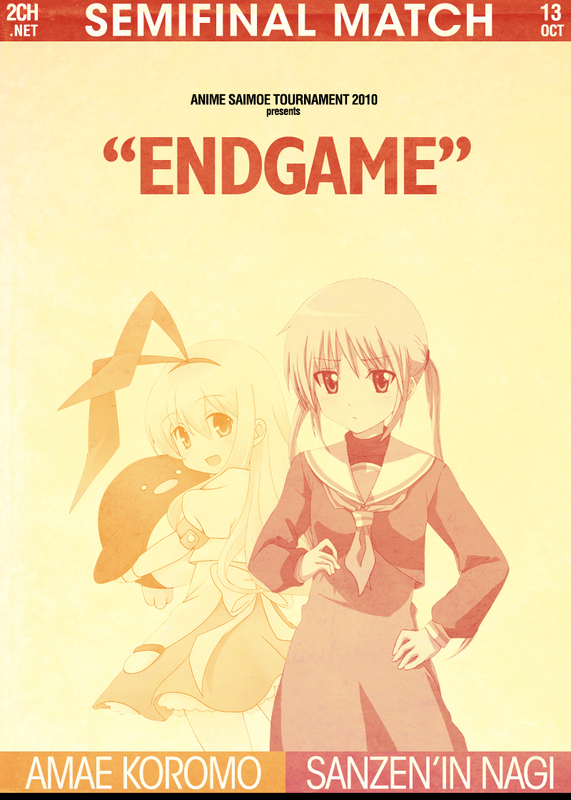 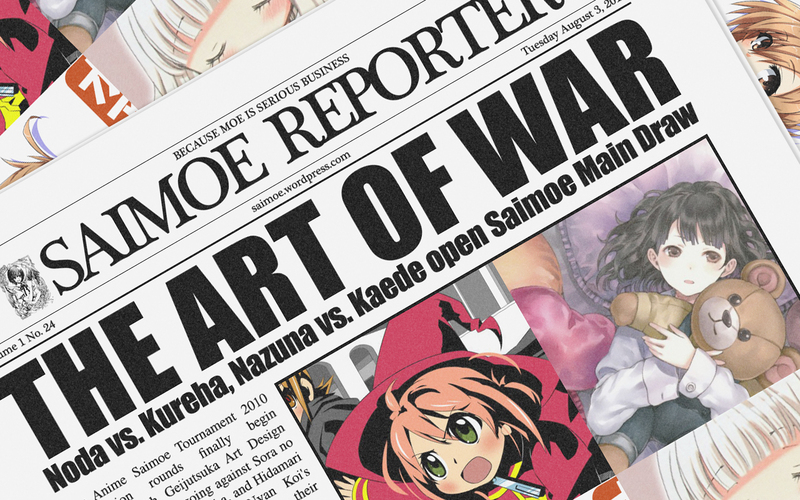 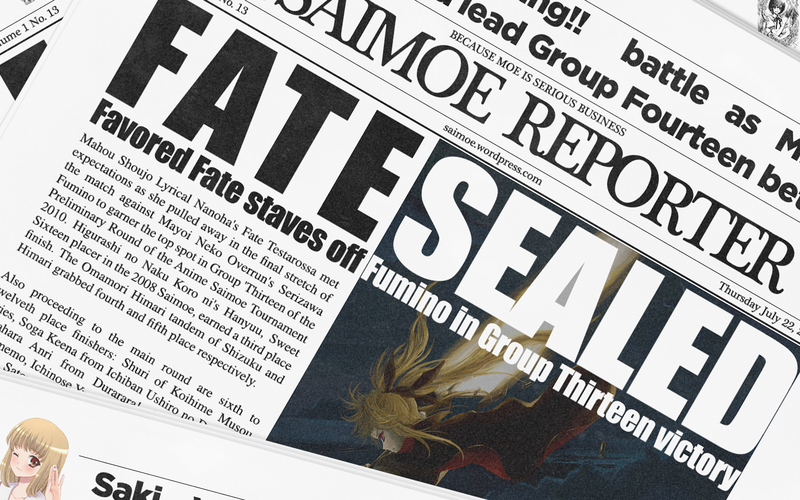 The saimoe contest is one of the epicness contest of our world. 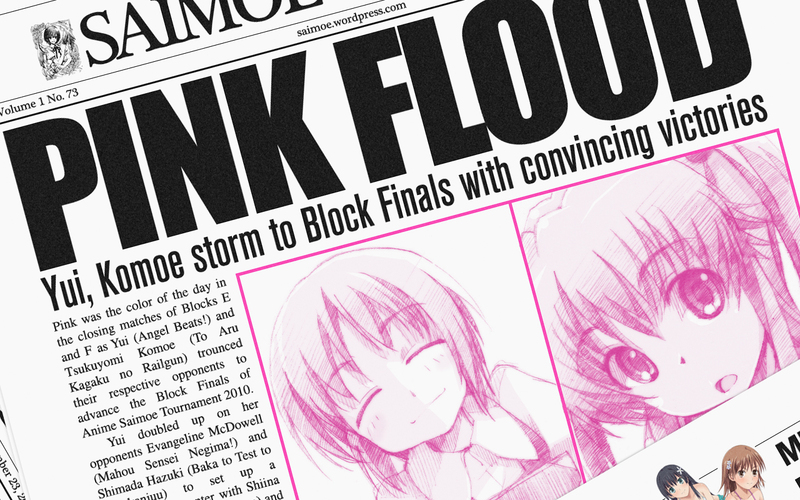 Are you going to make a page about the 2011 one? 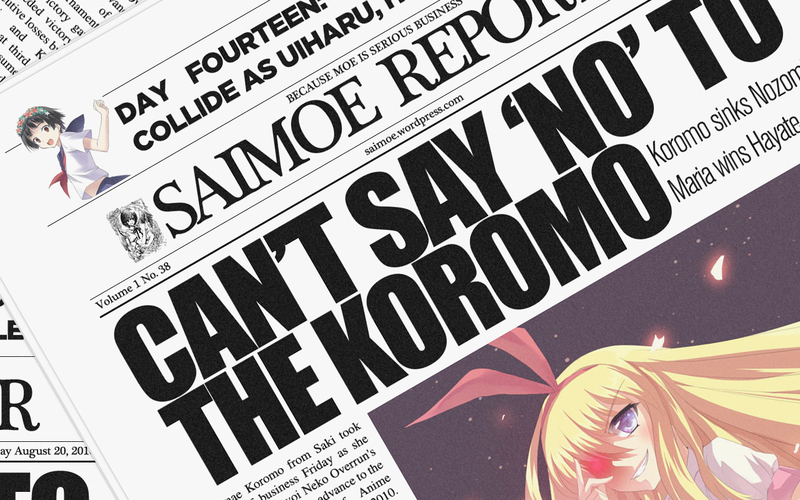 I don’t expect to since I don’t have the time. 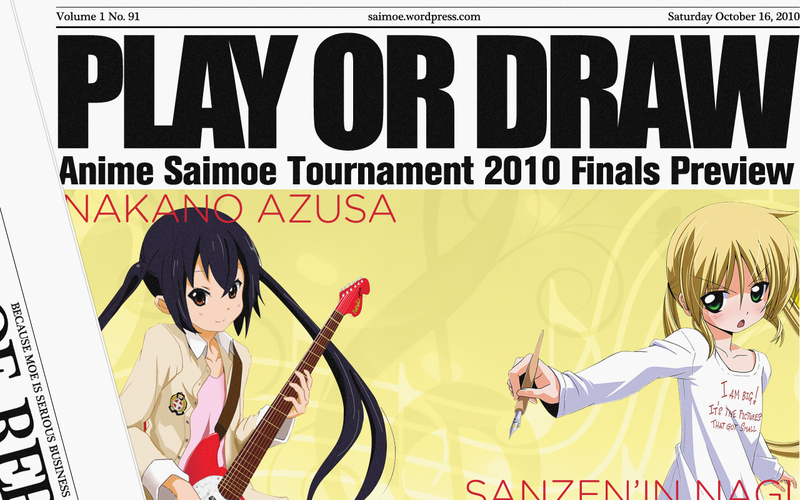 My friend frustra @ http://saimoe.wordpress.com/ will be following the tourney. 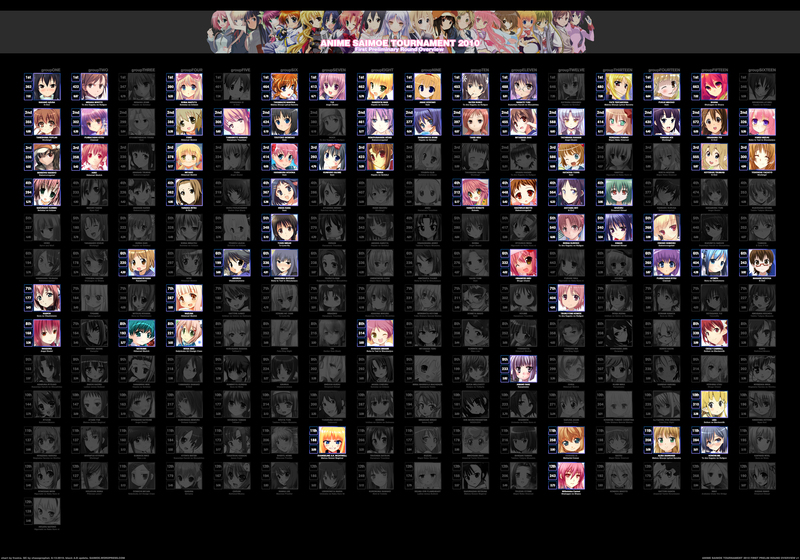 Maybe I might end up collecting some images again, but as of this moment, it’s unlikely.